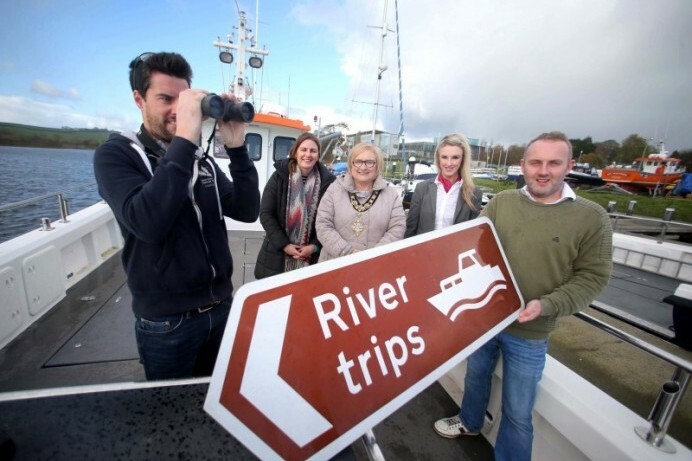 A competition to find Northern Ireland’s Best Small Visitor Attraction is now open to applications. 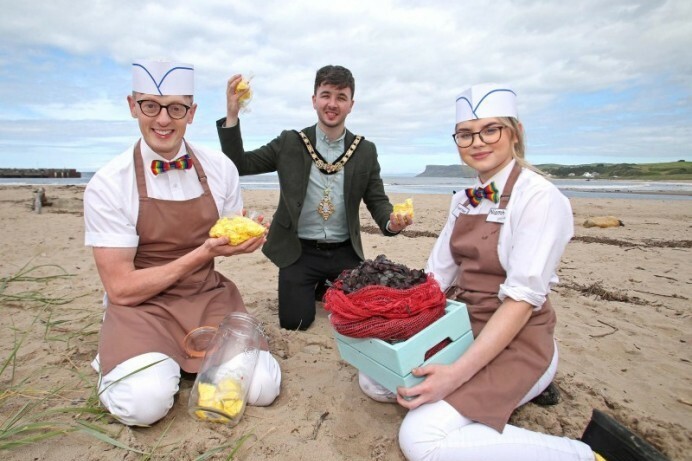 Do you love Ballycastle? 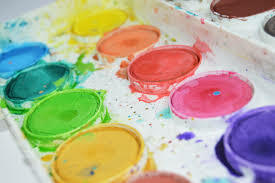 Would you like to create an artwork for public display in the town? 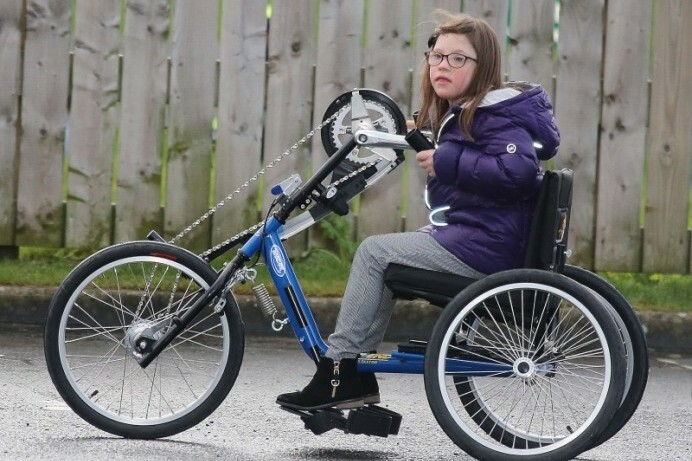 Causeway Coast and Glens Borough Council's first Inclusive Cycling initiative has proved to be a great success. 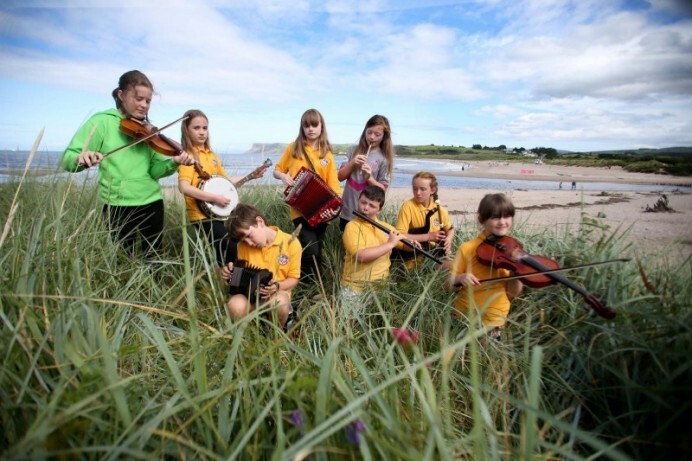 Flowerfield Arts Centre in Portstewart will host a performance of ‘The Lost Bear’ on Friday 1st February at 11am. 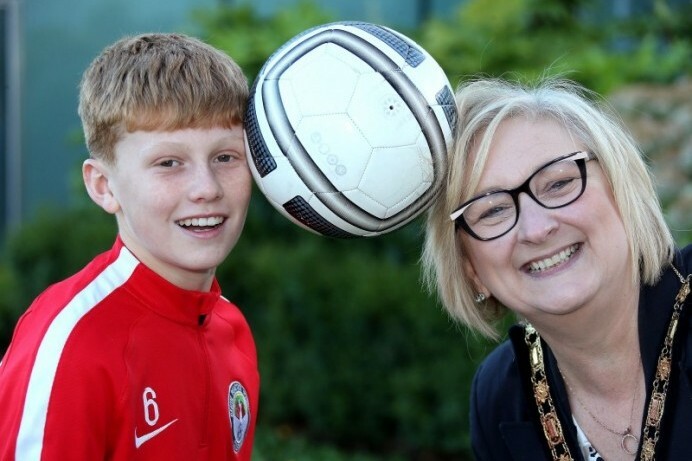 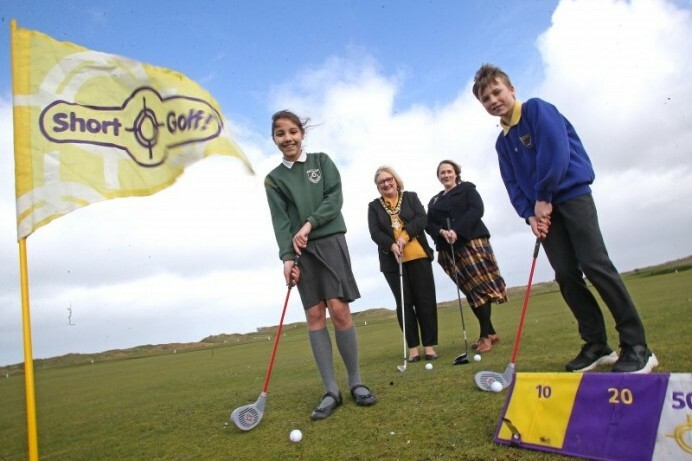 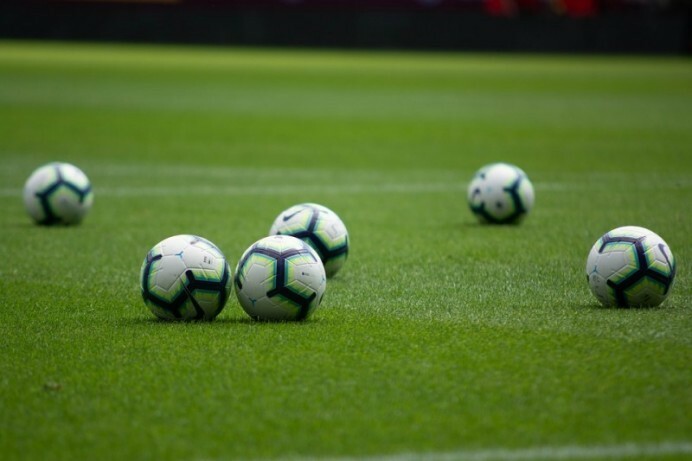 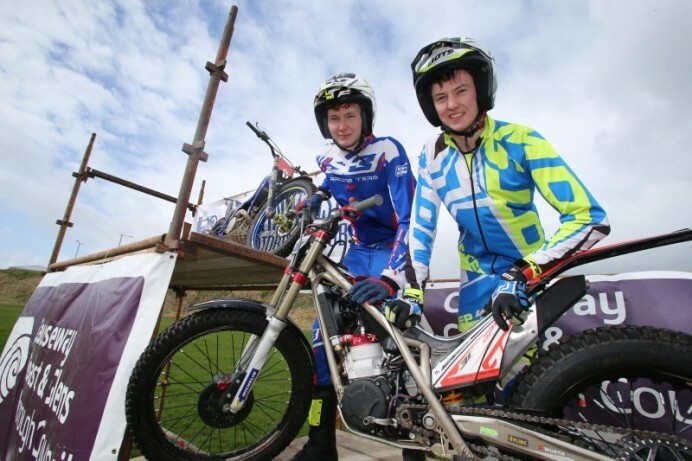 Led by Causeway Coast and Glens Borough Council, the funding for this project will act as a cross-community sports hub, used by the schools’ pupils during the day, and by the local community and sports clubs at night. 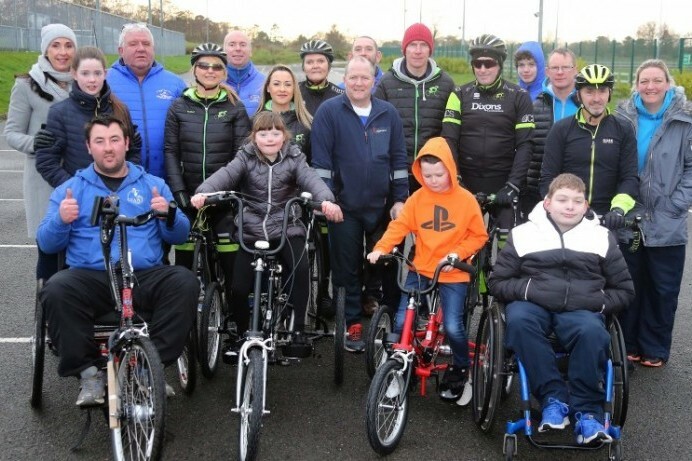 Causeway Coast and Glens Borough Council is holding a free Inclusive Cycling event at the Joey Dunlop Leisure Centre in Ballymoney on Sunday 20th January from 2pm – 4pm. 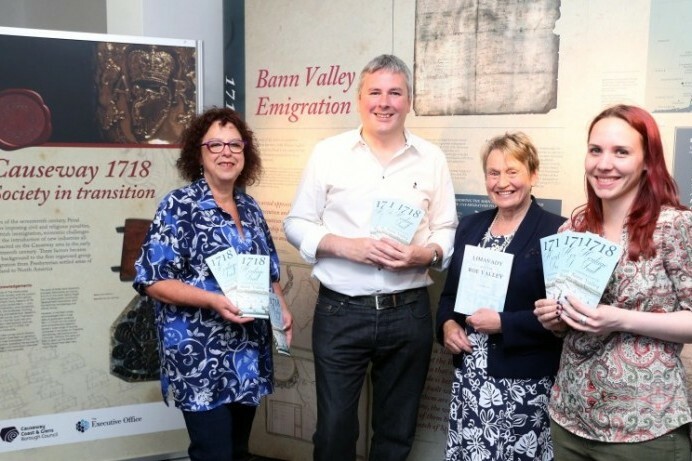 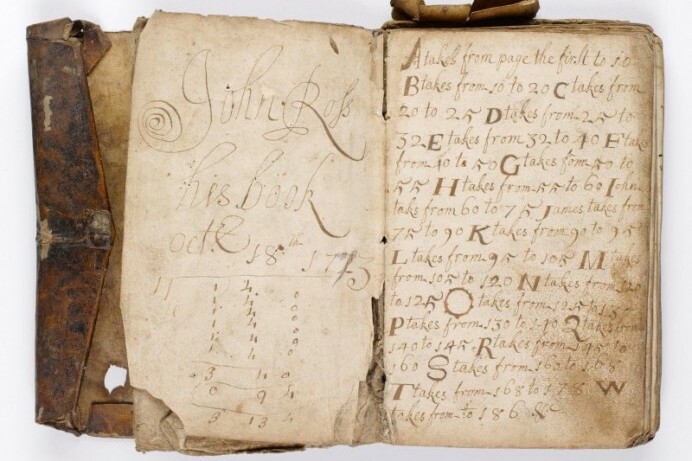 1718 Bann Valley migration exhibition opens at Ballymoney Museum. 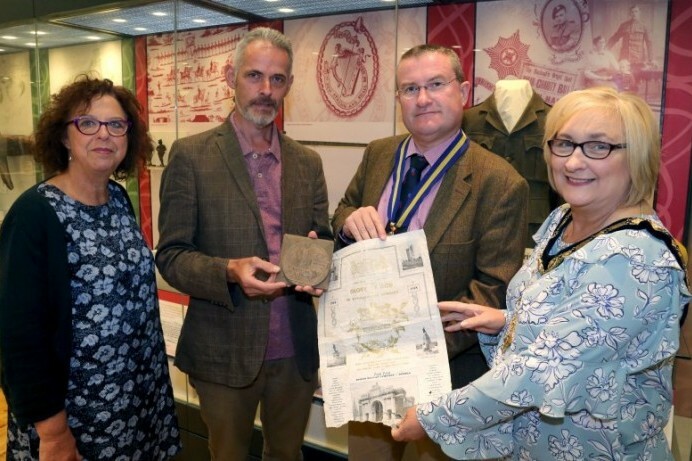 An exhibition commemorating the 300th anniversary of the 1718 Bann Valley migration has opened in Ballymoney Museum. 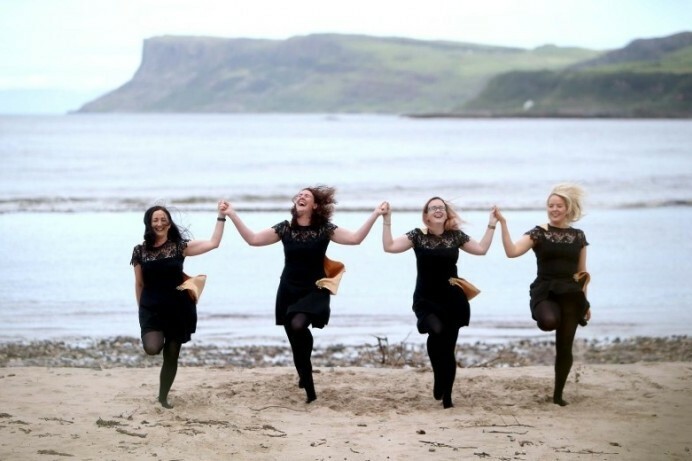 The Dominican Collective Exhibition is now open at Flowerfield Arts Centre in Portstewart. 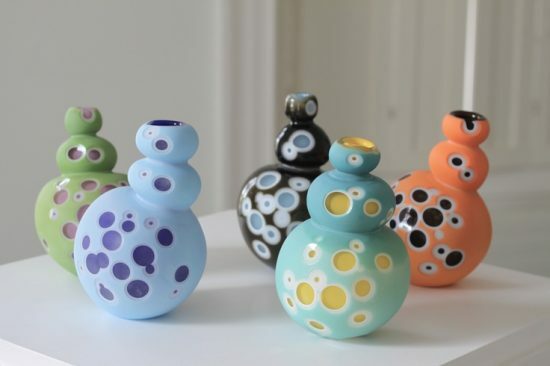 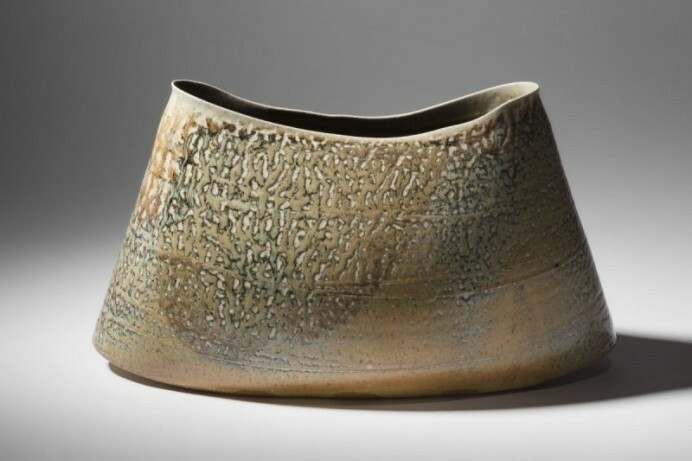 A stunning exhibition featuring work by some of Ireland’s leading contemporary ceramicists launches in Flowerfield Arts Centre on Thursday 7th February. 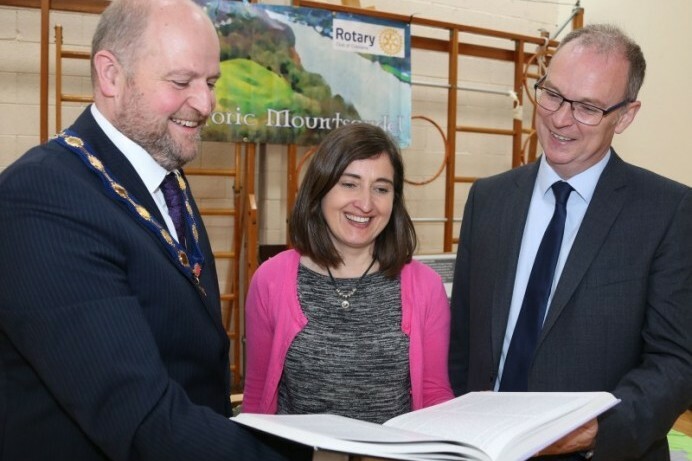 Roe Valley Arts and Cultural Centre in Limavady has launched its latest free events guide. 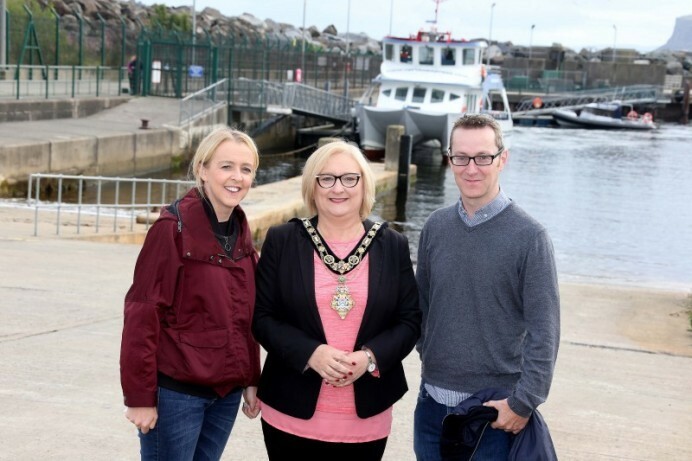 Flowerfield Arts Centre in Portstewart has launched its latest arts programme for the new season. 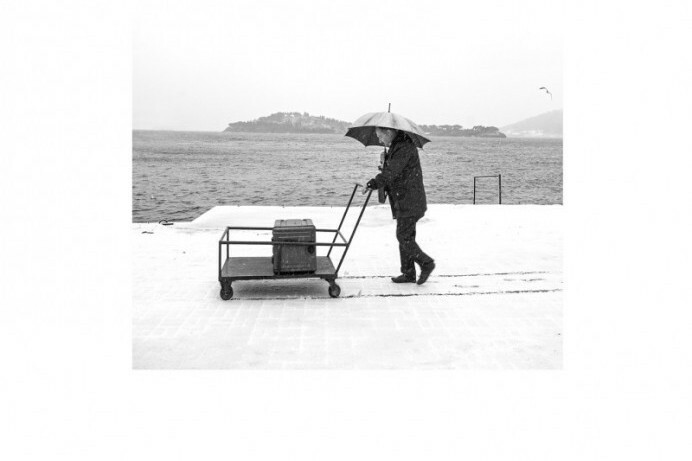 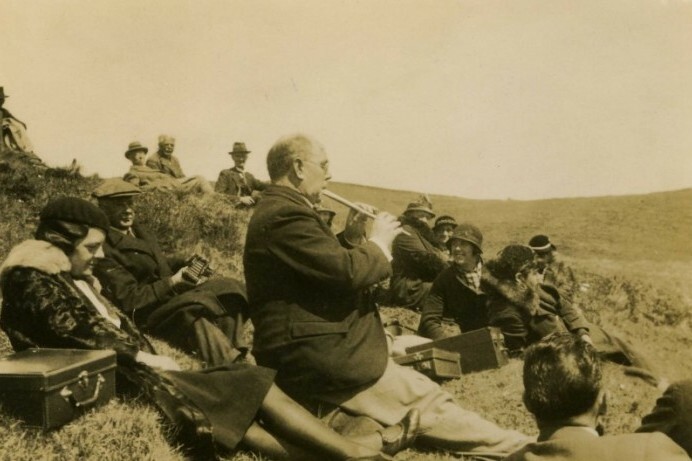 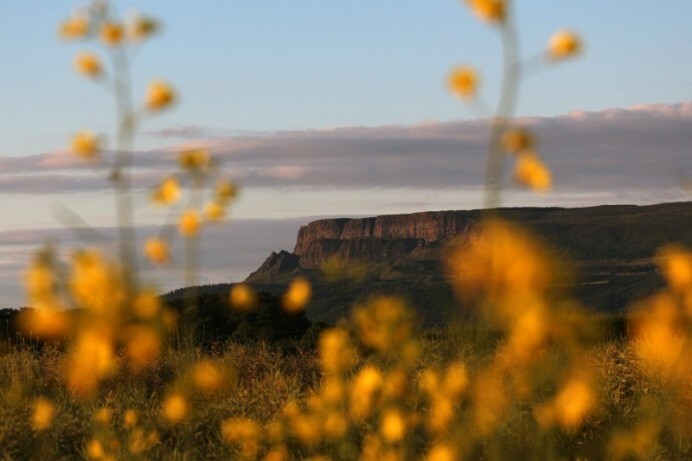 Causeway Coast and Glens Borough Council and Flowerfield Arts Centre are delighted to announce the launch of the Springfield Artist in Residency Programme. 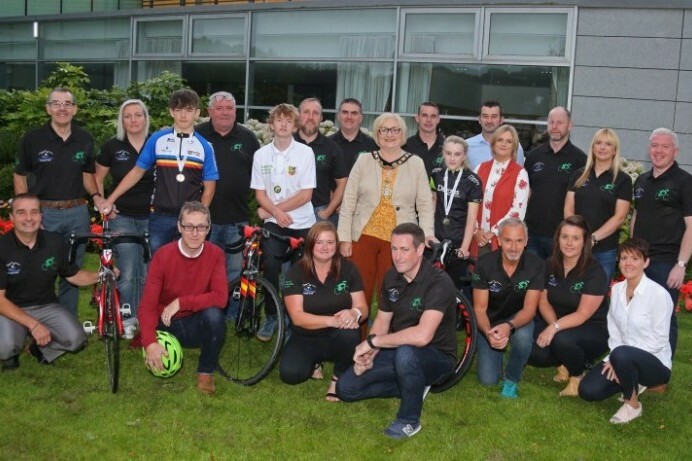 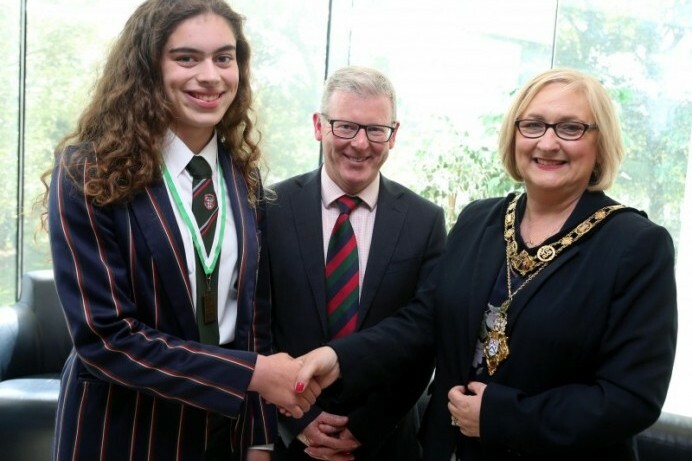 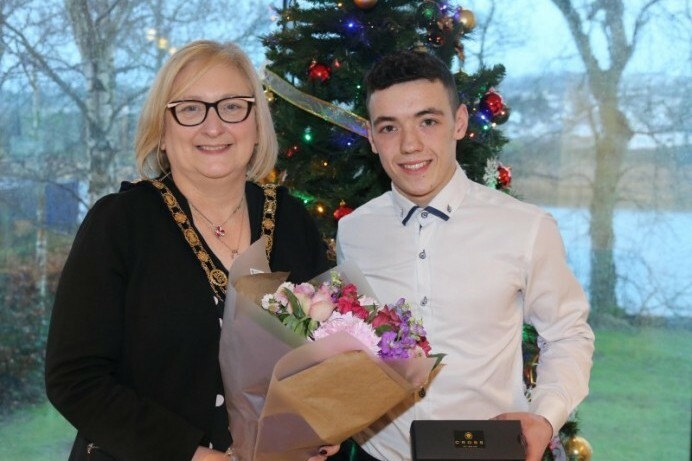 The Mayor of Causeway Coast and Glens Borough Council has held a civic reception for a rising motor racing star from Aghadowey. 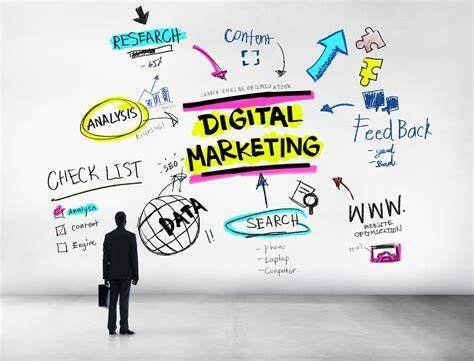 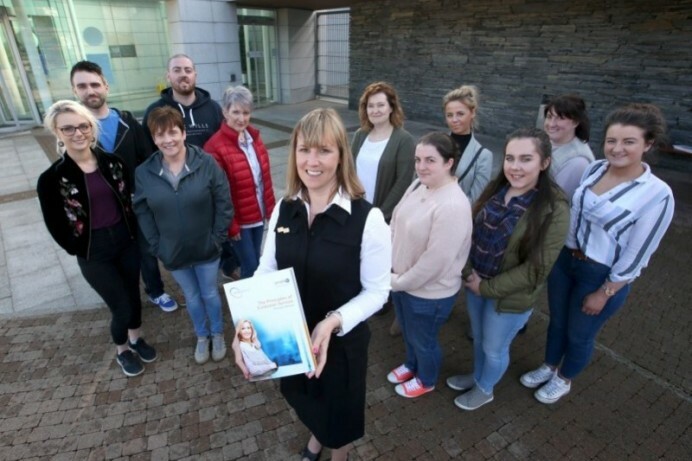 An exciting new marketing course aimed at artists and makers begins in Flowerfield Arts Centre in Portstewart later this month. 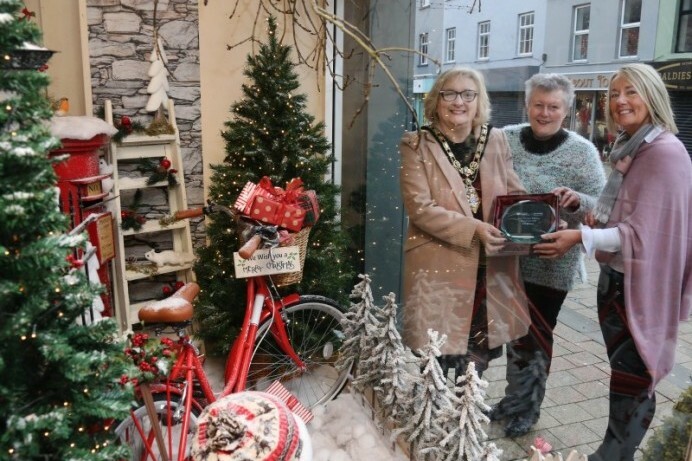 Shop owners and businesses have been praised for creating beautiful Christmas window displays in towns and villages across the Causeway Coast and Glens. 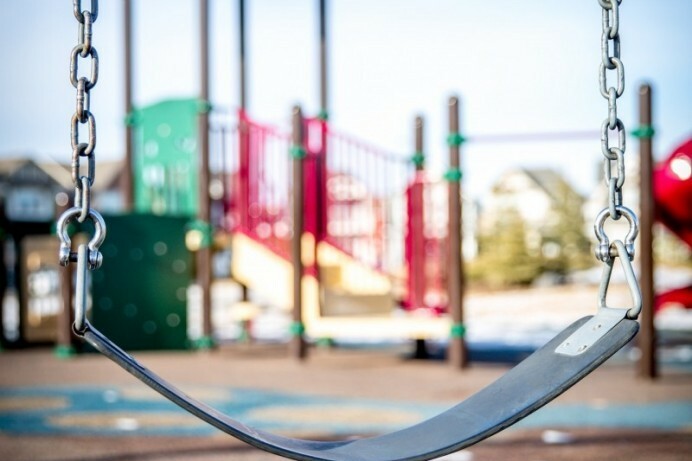 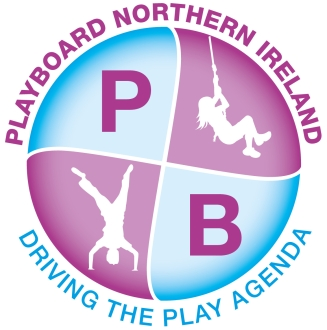 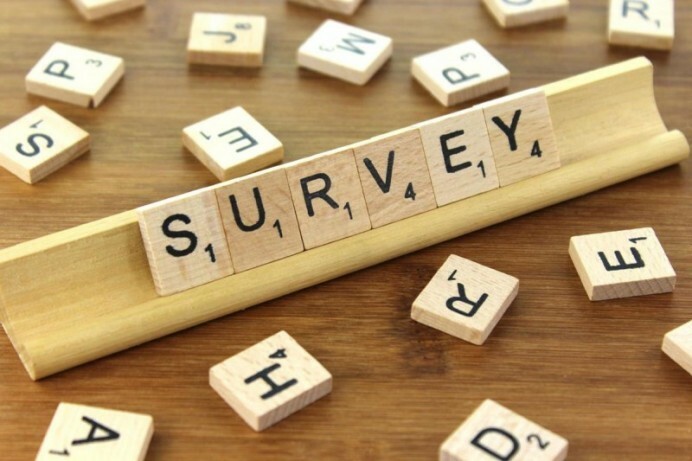 PlayBoard NI, on behalf of Causeway Coast and Glens Borough Council recently conducted an online consultation and a number of children’s engagement sessions regarding the potential development of an inclusive play area in Limavady. 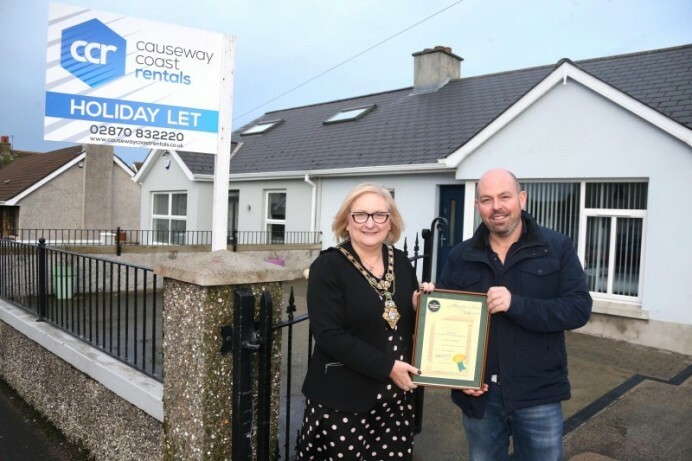 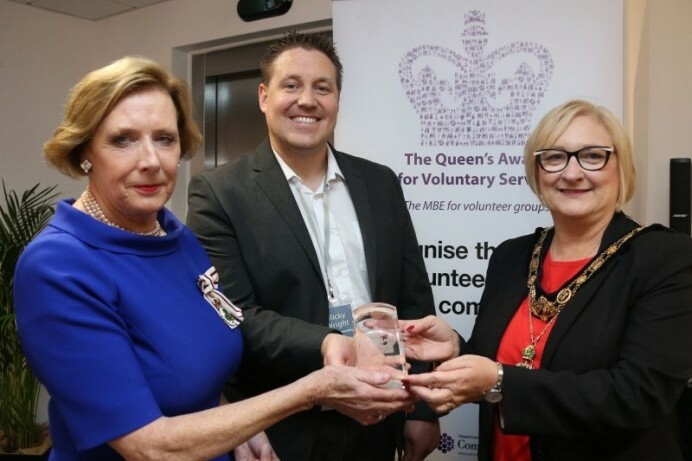 The Mayor of Causeway Coast and Glens Borough Council has applauded all those who contribute to community life across the area. 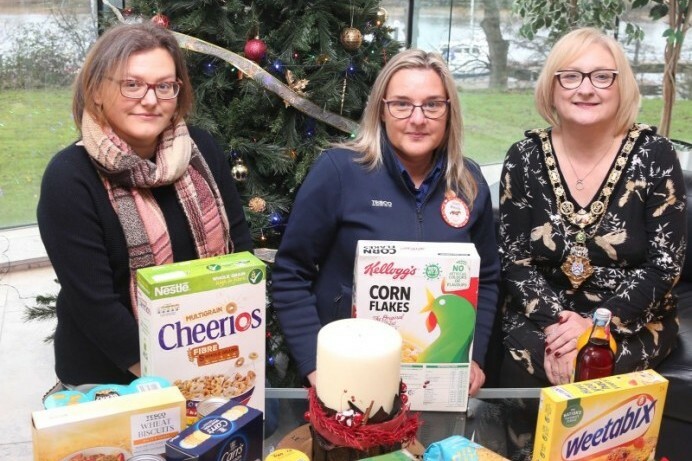 A ‘Food Drive’ organised by Causeway Coast and Glens Borough Council has helped to raise much needed donations for local food banks. 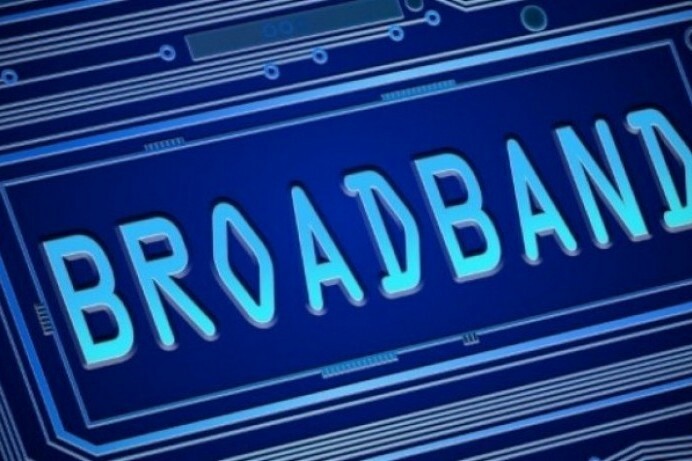 Residents across the Causeway Coast and Glens have been encouraged to check postcode lists showing poor broadband areas. 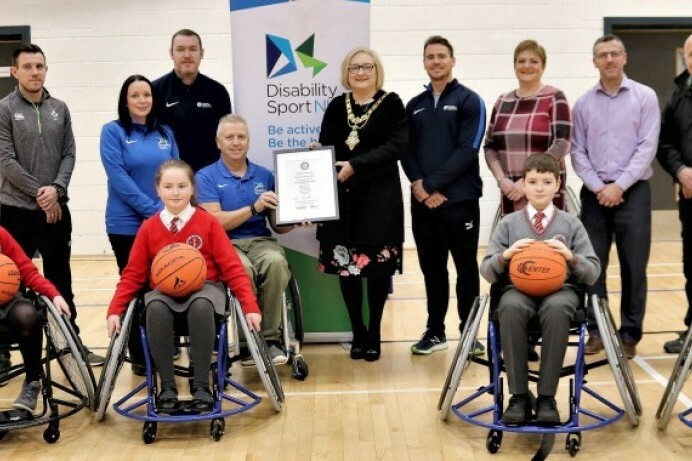 Dungiven Sports Centre has just become the first sports facility in Northern Ireland to be awarded the excellence level of Disability Sport NI’s prestigious ‘Inclusive Sports Facility Accreditation’ scheme. 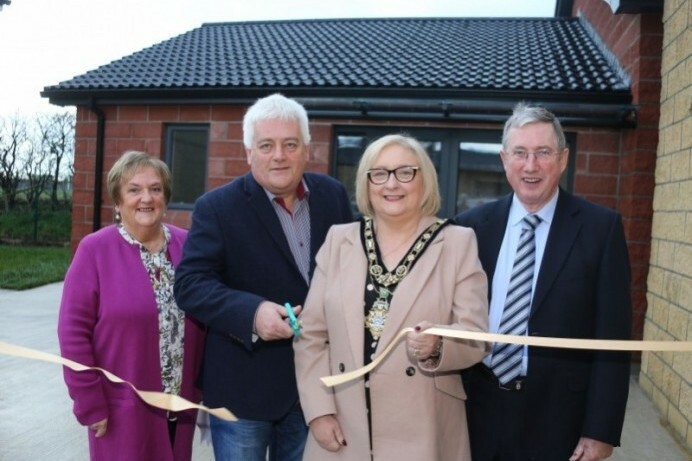 Loughgiel Community Association has celebrated its 30th anniversary with the official opening of a new Health & Wellbeing Centre. 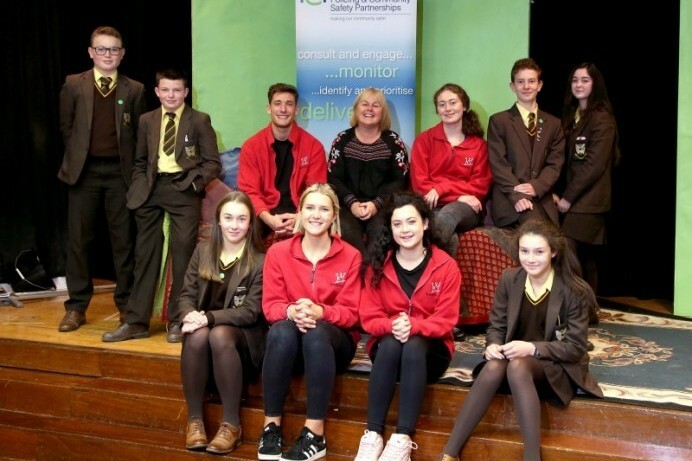 Pupils from Cross and Passion College, Ballycastle High School and Dominican College have discussed issues around policing and community safety at a special event in Cloonavin. 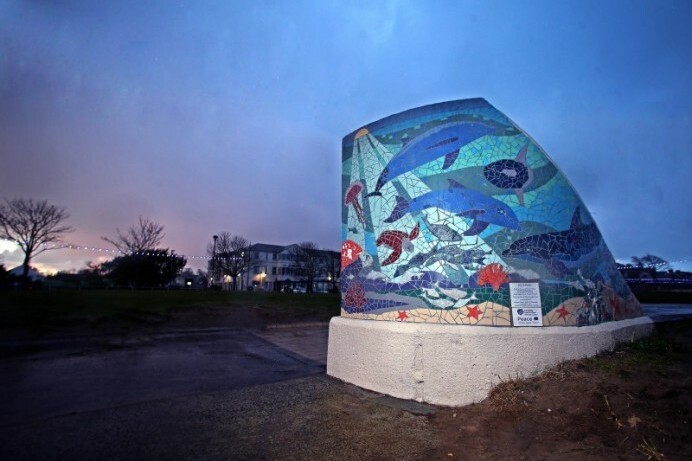 Pupils from Cross and Passion College and Ballycastle High School have added some colour to the seafront with a new mosaic artwork. 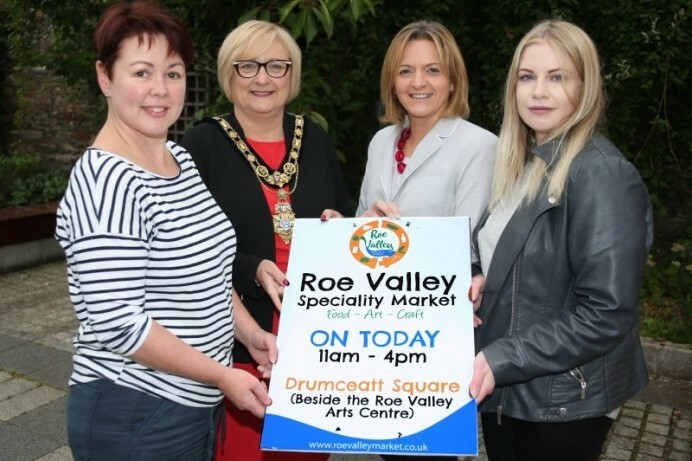 Roe Valley Arts and Cultural Centre in Limavady features a packed programme of events throughout December. 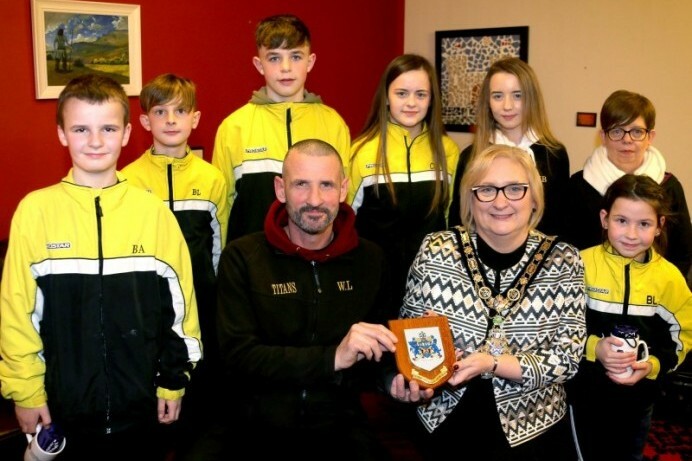 The Mayor of Causeway Coast and Glens Borough Council has held a civic reception for members of Limavady Titans Kickboxing Club. 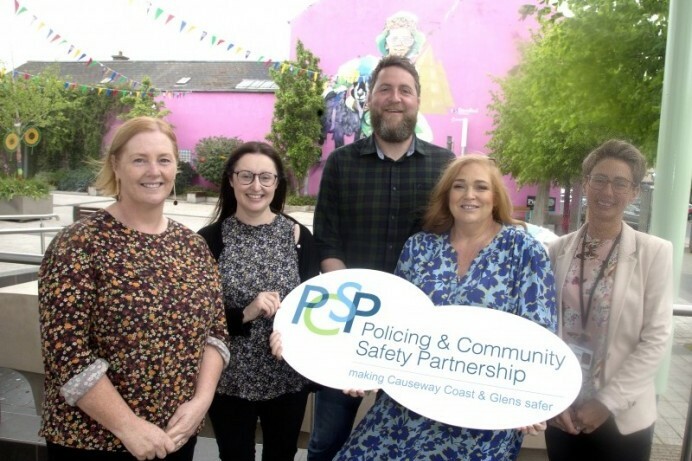 Causeway Coast and Glens Policing and Community Safety Partnership (PCSP) has been operational over the last four years. 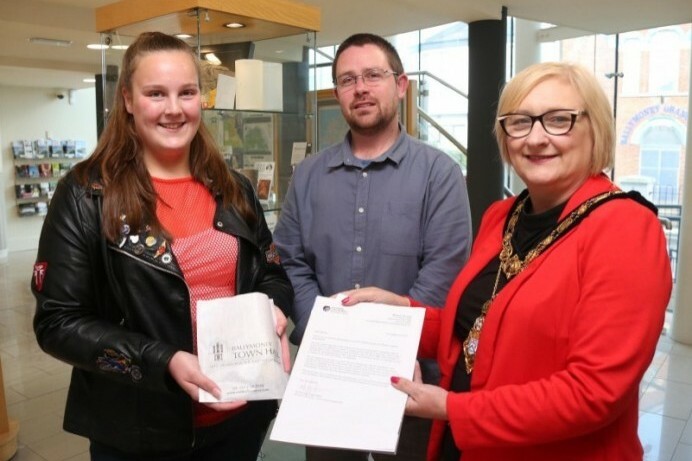 Close to Home exhibition showcases local artists in Limavady. 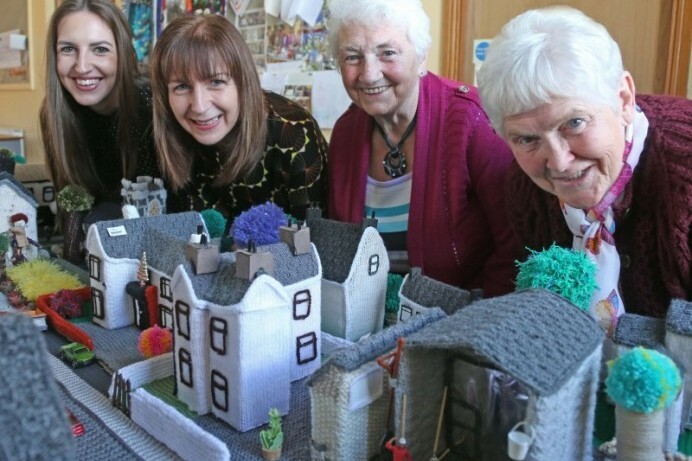 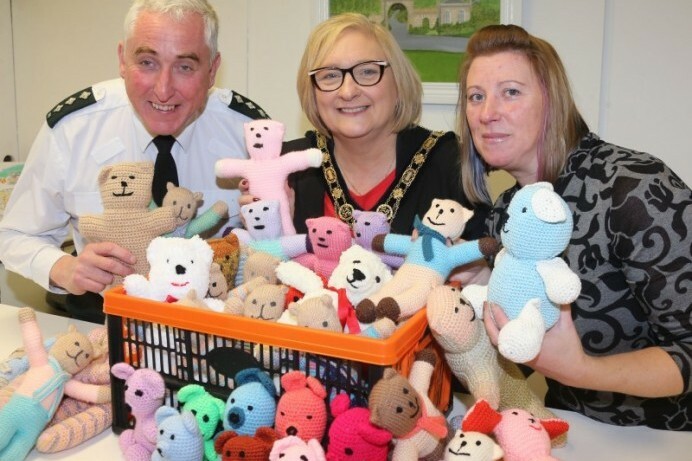 Roe Valley Arts and Cultural Centre in Limavady welcomes an exhibition created by local artists from The Puffin Artists Group CIC. 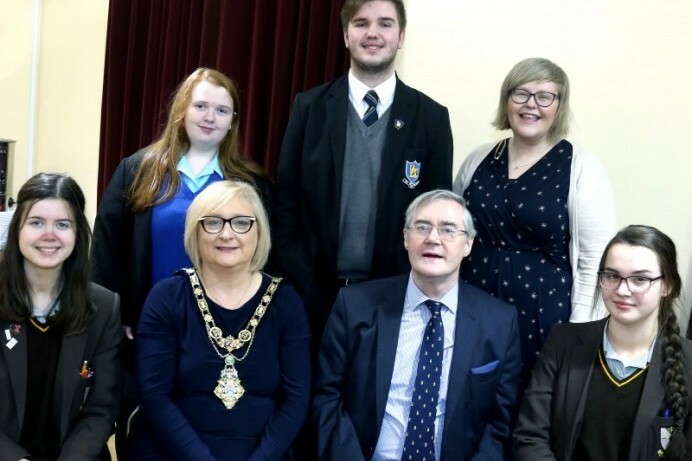 Secondary school pupils from across the Causeway Coast and Glens have attended a special talk about the Great War and its legacy. 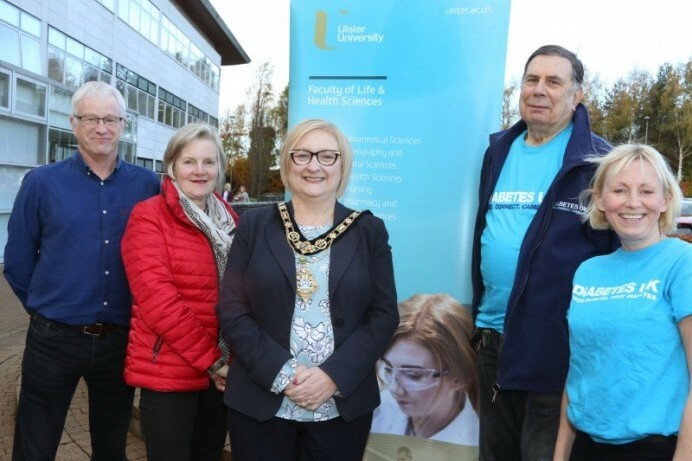 Participants of a running challenge in Limavady have celebrated the completion of their first 5K event. 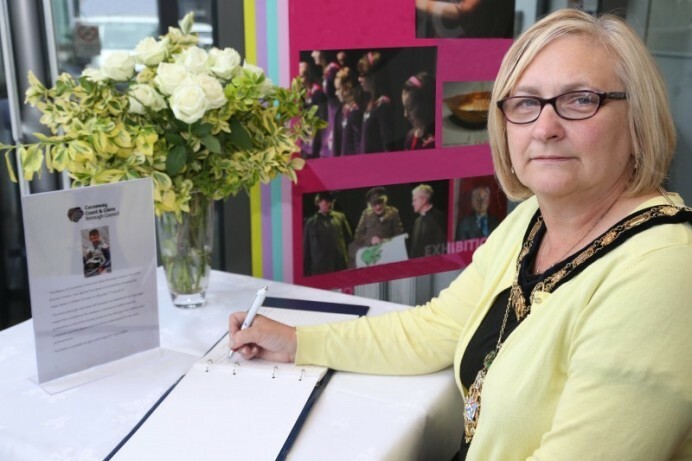 A Book of Condolence has been opened to allow friends and colleagues to pay tribute to John Winton. 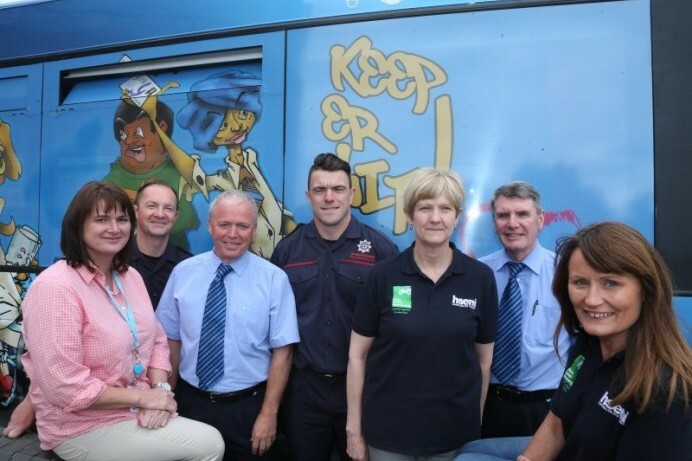 Awareness campaign highlights risk of Carbon Monoxide poisoning. 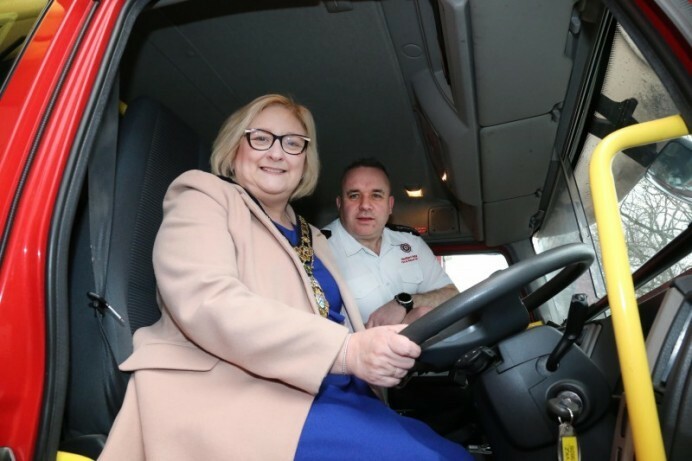 Causeway Coast and Glens Borough Council is encouraging all householders to be mindful of the risks associated with Carbon Monoxide. 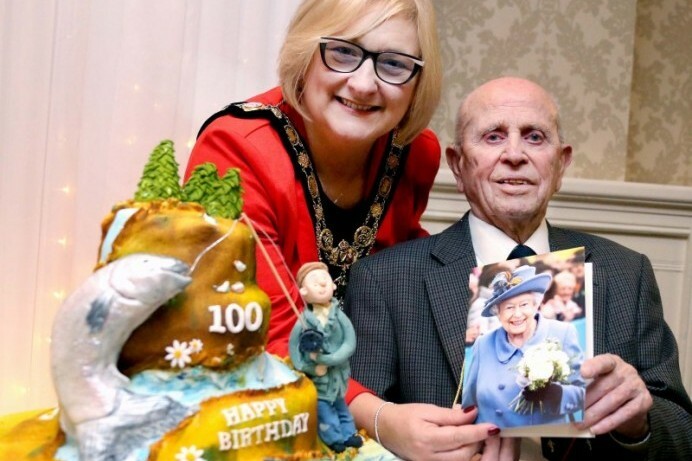 Norman Irwin was the very special guest at a surprise party in Coleraine on Saturday 17th November. 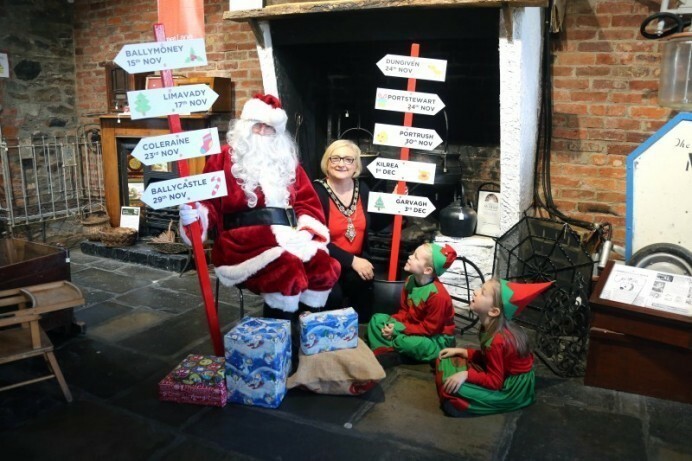 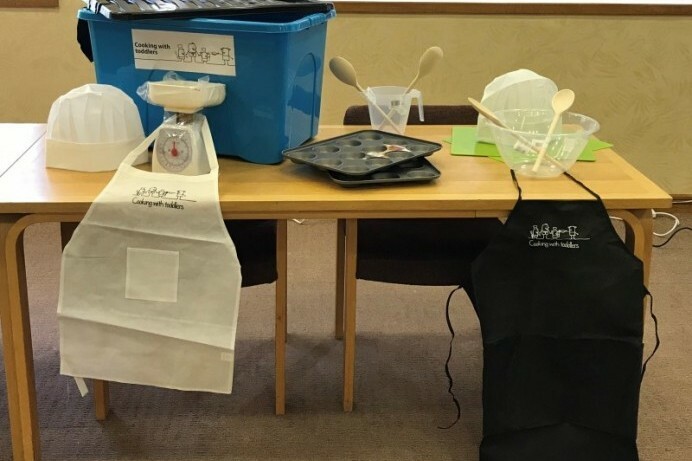 A children’s craft workshop is coming to Limavady as part of the countdown to Christmas. 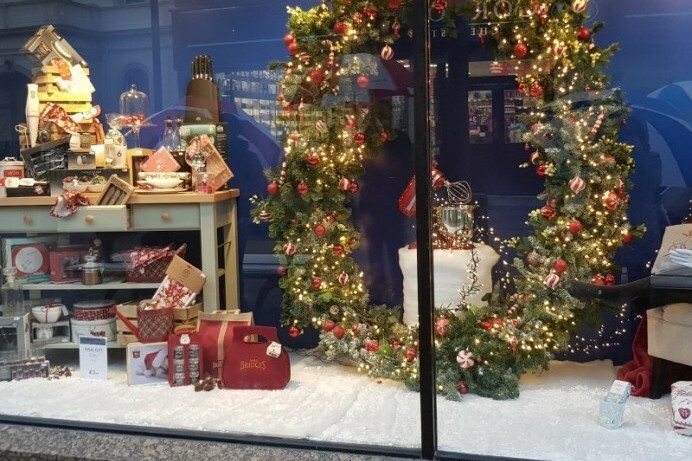 Festive themed window displays create a warm welcome for shoppers and visitors. 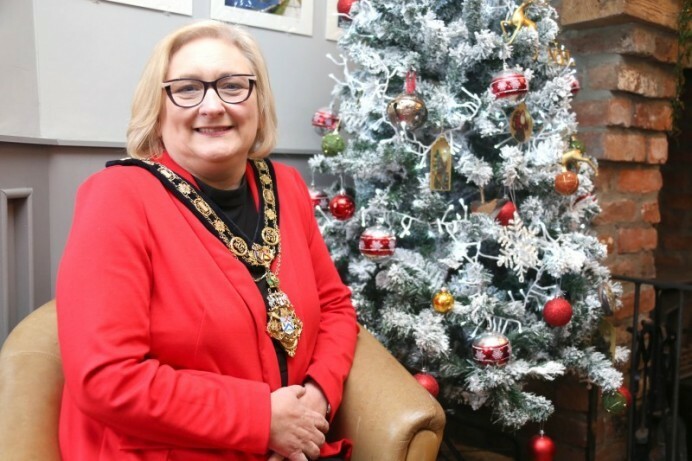 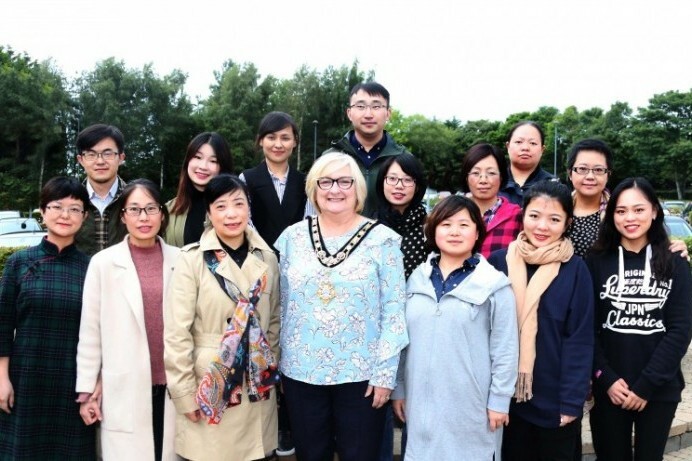 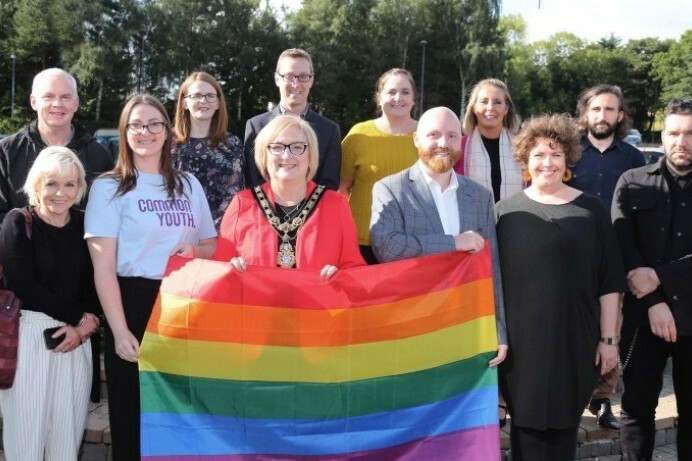 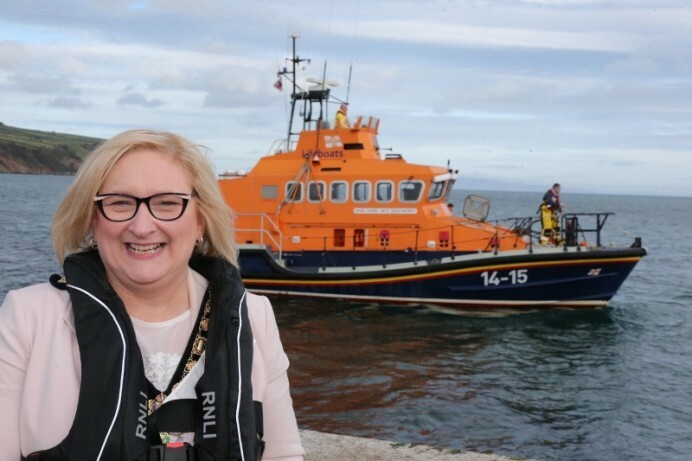 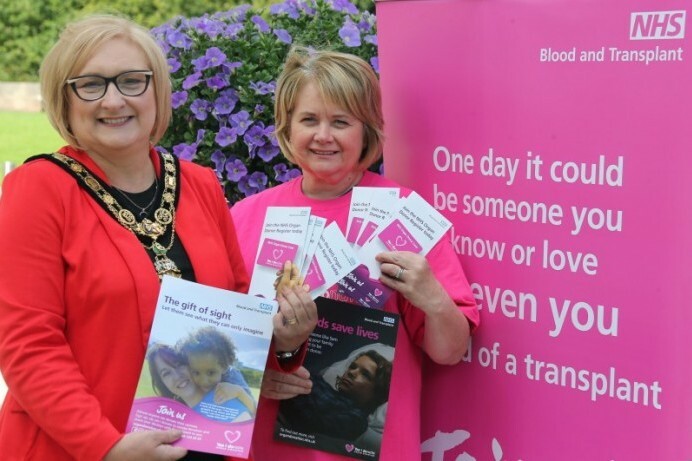 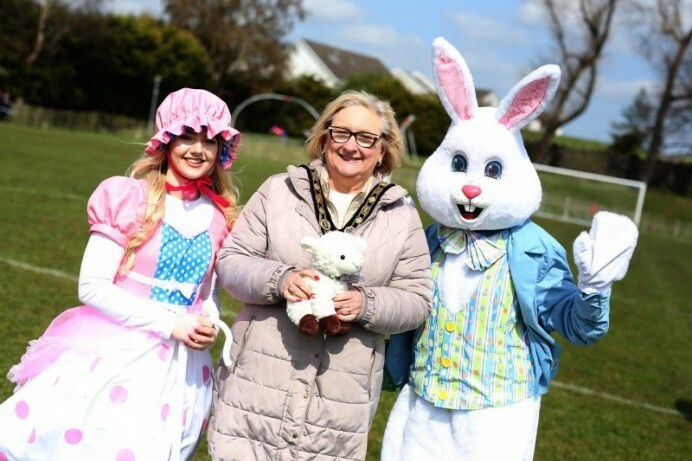 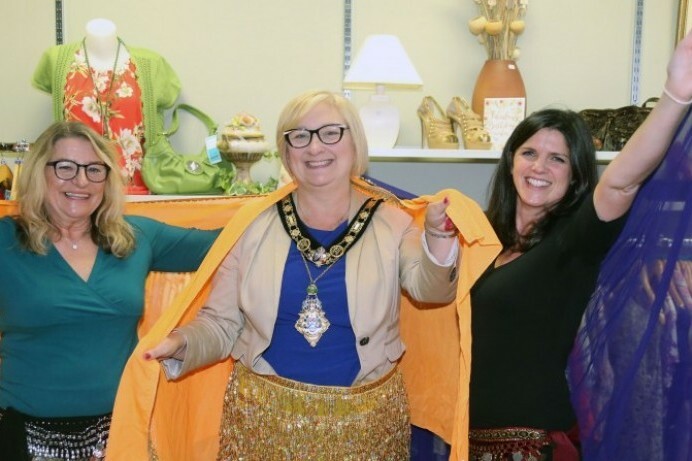 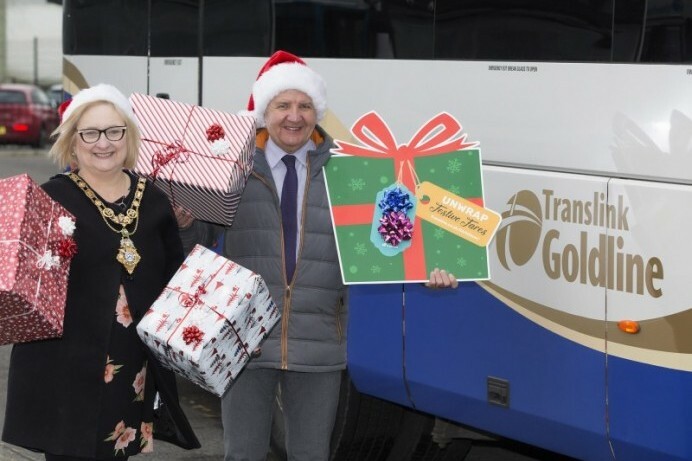 The Mayor of Causeway Coast and Glens Borough Council had a very special reason for taking a break from her official duties this week. 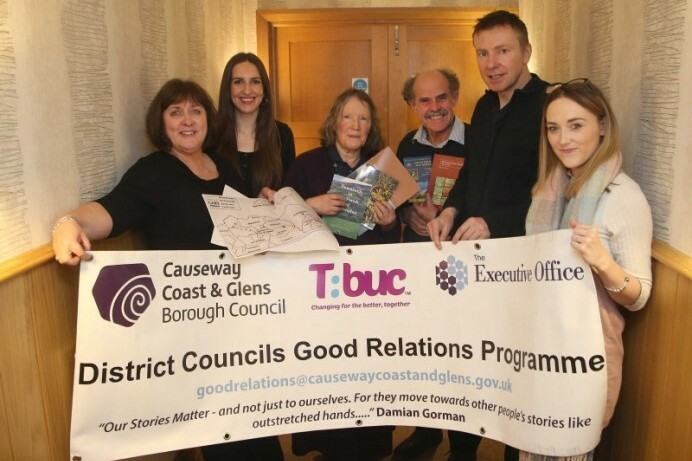 Causeway Coast and Glens Borough Council’s Good Relations Team would like to invite you to take part in a series of educational visits. 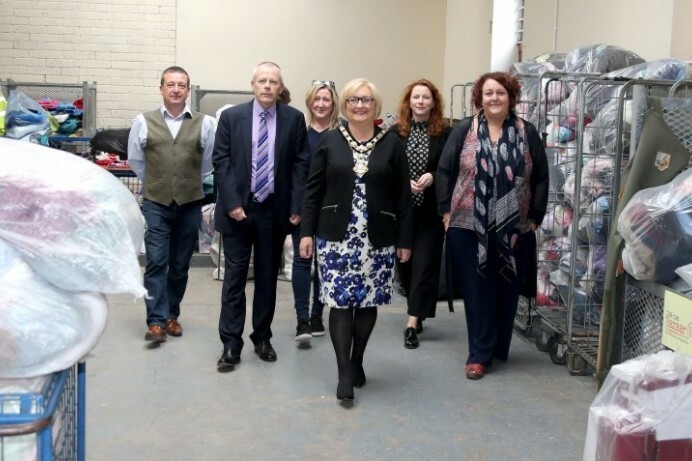 The Sam Henry collection is the inspiration behind an evening with The Causeway Yarn Spinners on Thursday 29th November in Kilrea Town Hall. 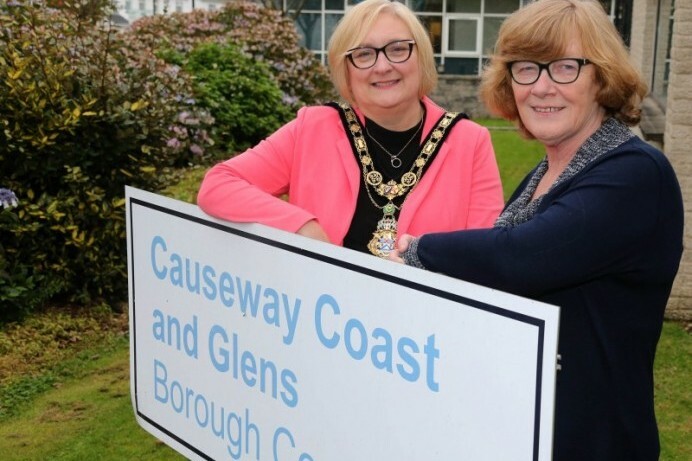 Causeway Coast and Glens Borough Council’s civic headquarters will be illuminated in blue this month to raise awareness about diabetes. 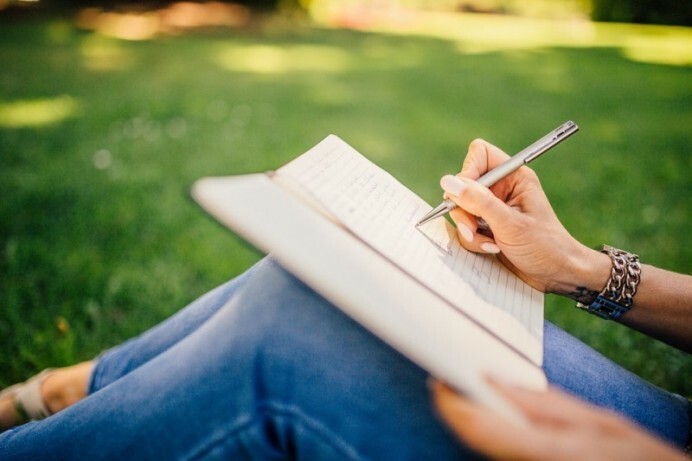 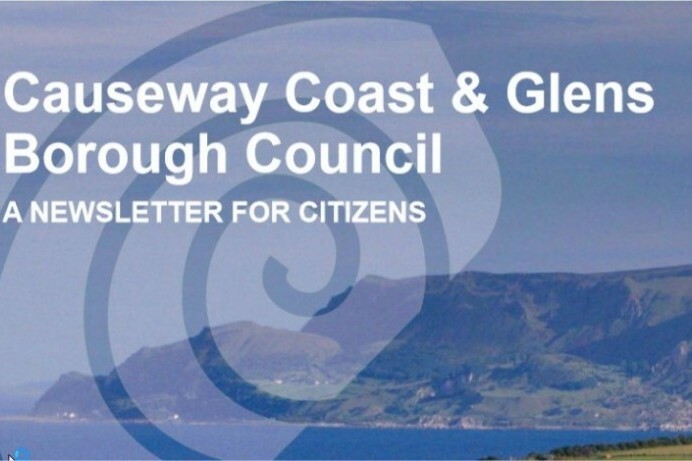 Welcome to the latest edition of our citizens’ newsletter where we reflect on some of the ways Causeway Coast and Glens Borough Council is working for you. 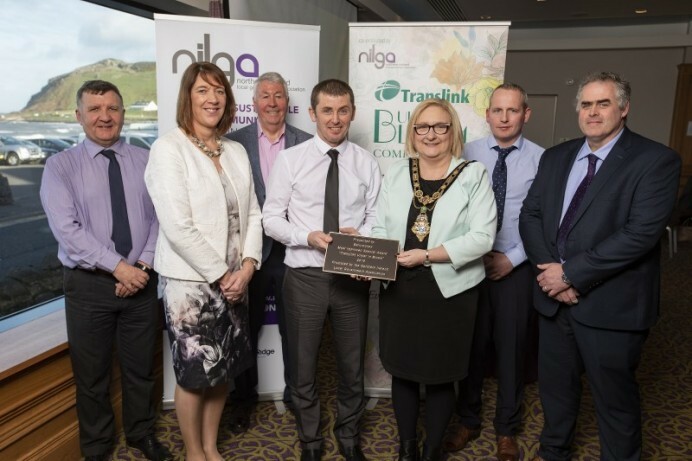 The diversity of work within the organisation, including recycling, community planning, tourism promotion, events and business support. 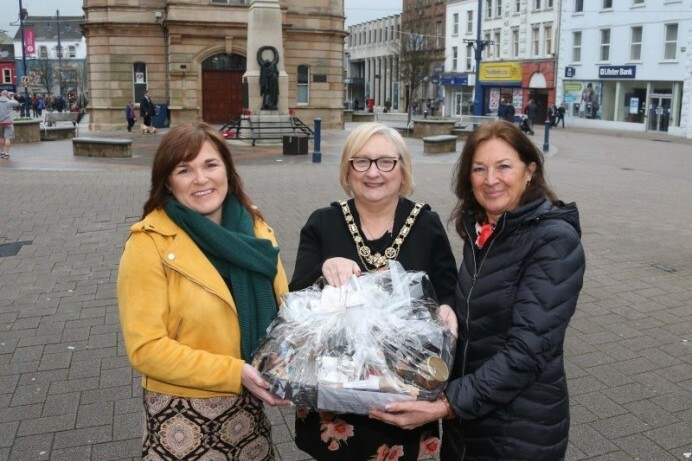 Causeway Coast and Glens Borough Council is playing its part in an international commemoration to mark 100 years since the end of World War One. 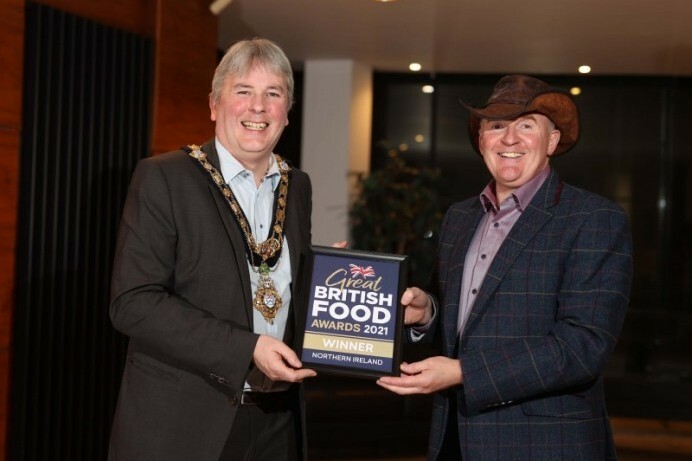 A civic reception has been held in honour of Reversible Ploughing World Champion Tom Cochrane. 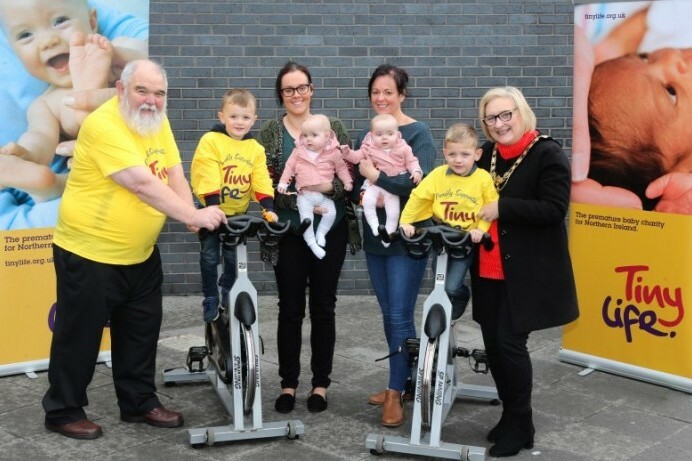 A charity spinathon in aid of TinyLife will take place on Saturday 1st December. 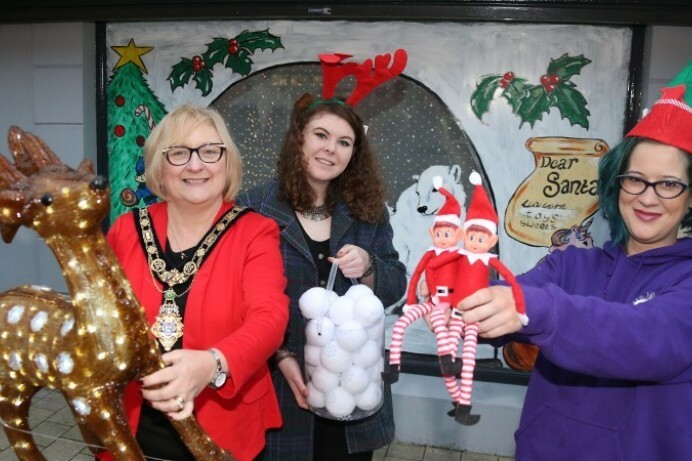 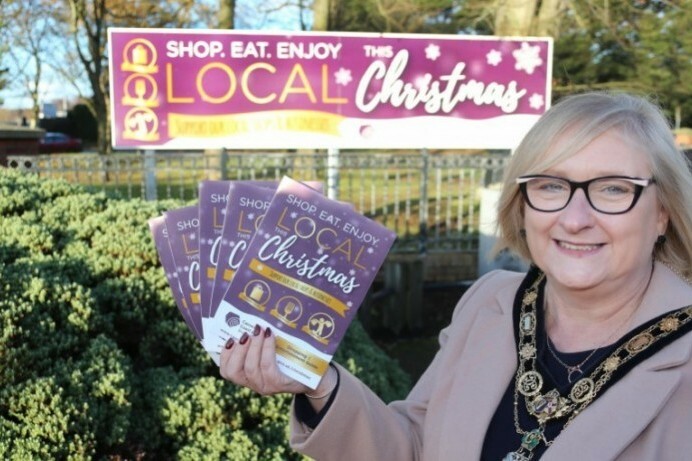 Preparations are well under way for Christmas lights switch-on events across the Causeway Coast and Glens. 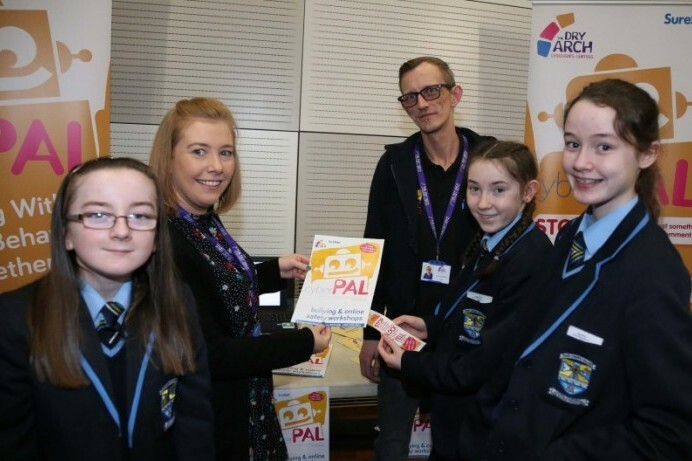 Over 300 children and young people aged 14-24 have been coming together to learn how to engage positively within their communities whilst improving and developing relations with others across the council area. 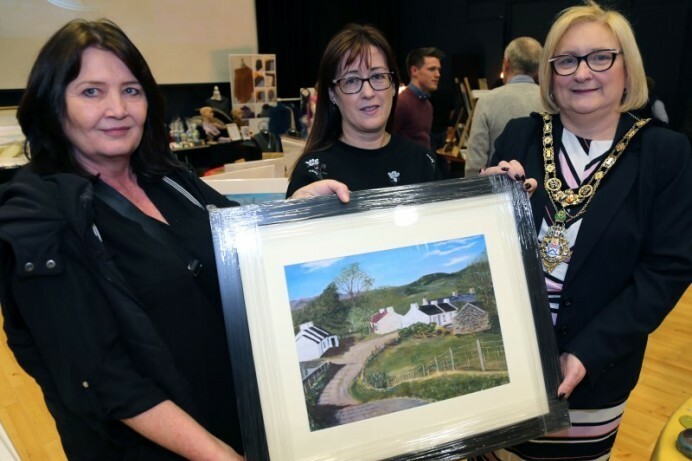 Coleraine Art Society celebrates its 70th birthday this year and is marking this major milestone with a special art exhibition in Flowerfield Arts Centre. 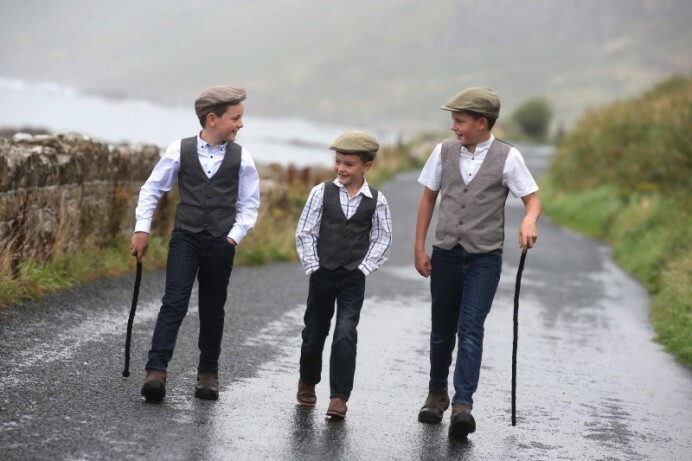 Bluegrass folk band The Mulligan Brothers will perform in Roe Valley Arts and Cultural Centre on Saturday 17th November. 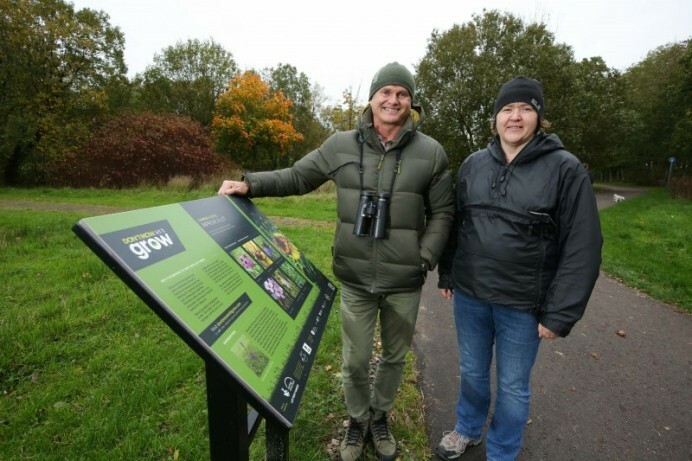 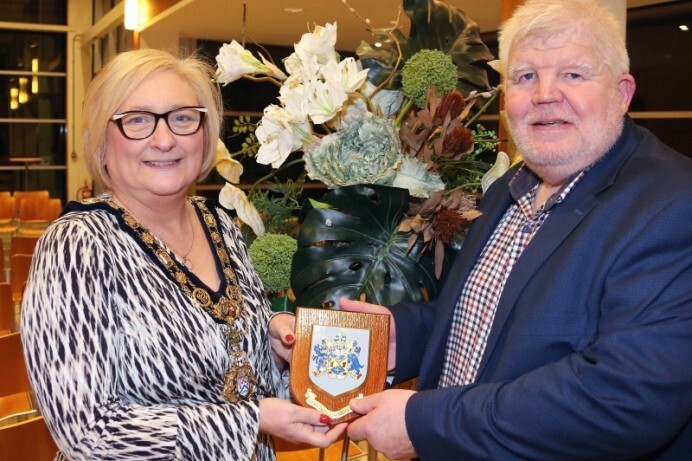 Blue Planet cameraman and BBC presenter, Simon King OBE has congratulated Causeway Coast & Glens Borough Council for the success of environmental project, Don’t Mow, Let It Grow. 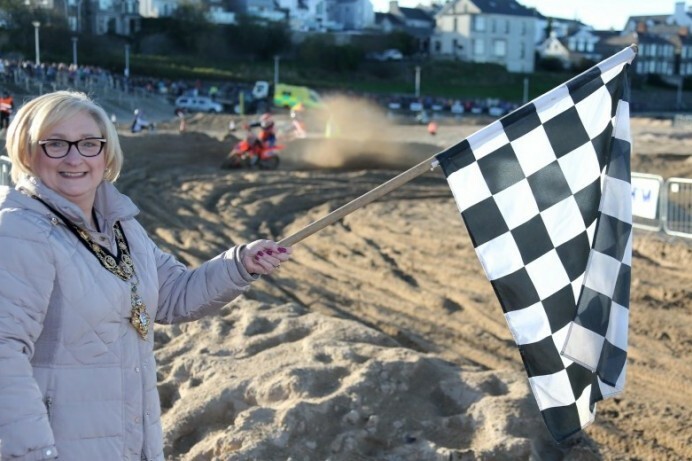 Thousands of people descended on Portrush over the weekend to enjoy the resort’s annual Beach Races. 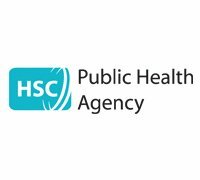 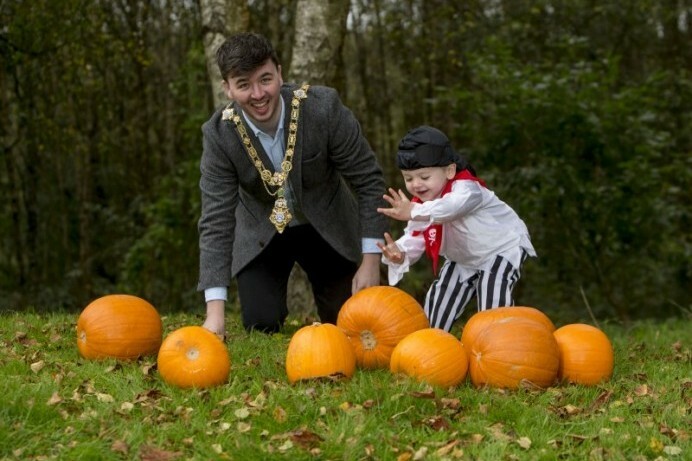 Causeway Coast and Glens Borough Council has launched a new programme which aims to promote healthly eating among some of our youngest residents. 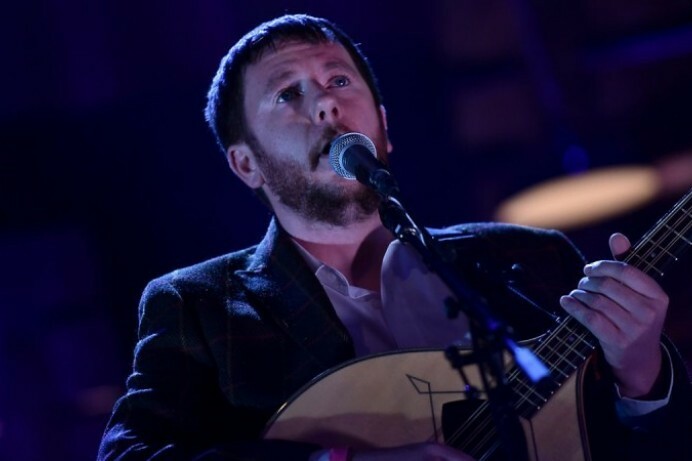 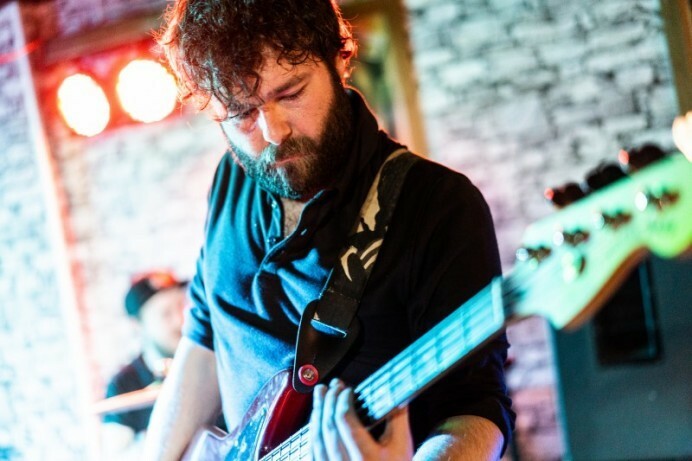 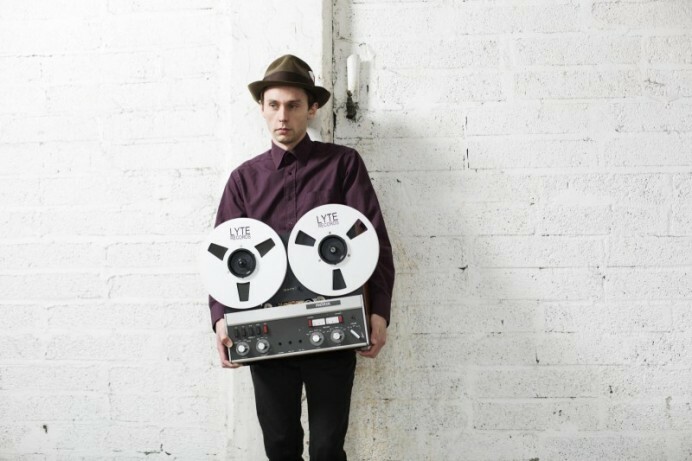 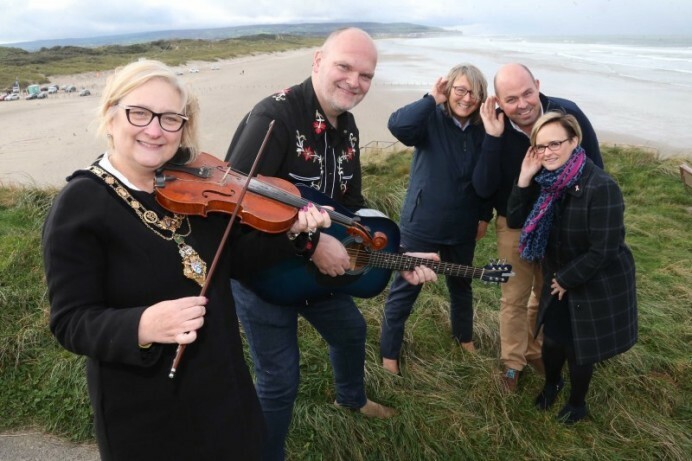 Over 110 musicians are set to descend on Portstewart and Portrush to mark the 10th anniversary of the award-winning Atlantic Sessions music festival. 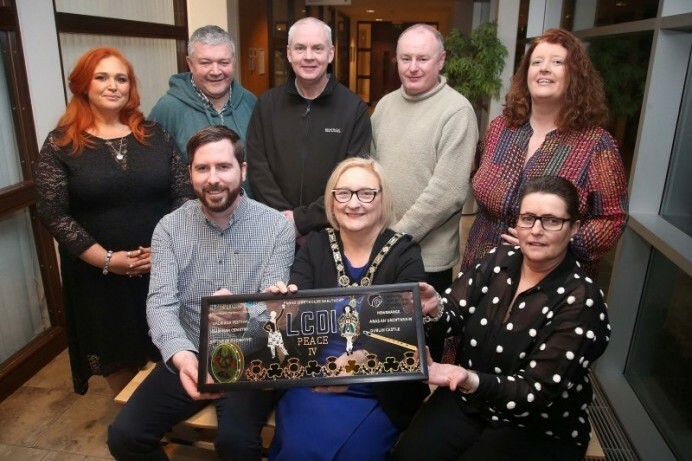 A new Community Fridge in Dungiven has been launched at Glenshane Care Centre. 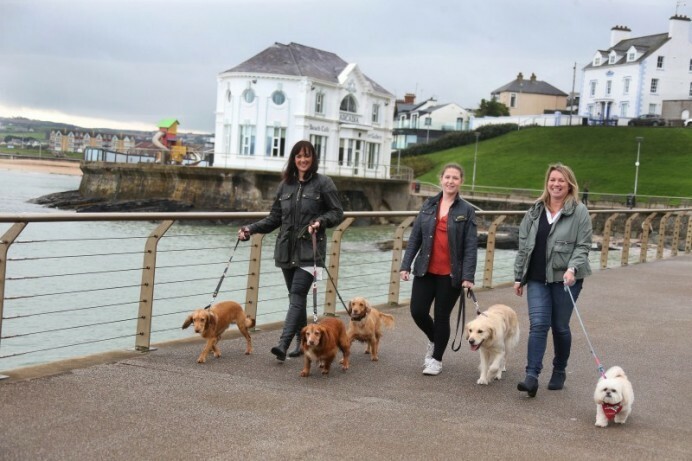 The Causeway Coast and Glens is celebrating its growing reputation as a dog friendly holiday destination. 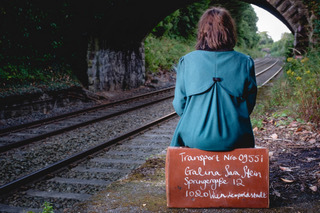 Local work goes on display in new ‘Troubles and Beyond Gallery’ at the Ulster Museum. 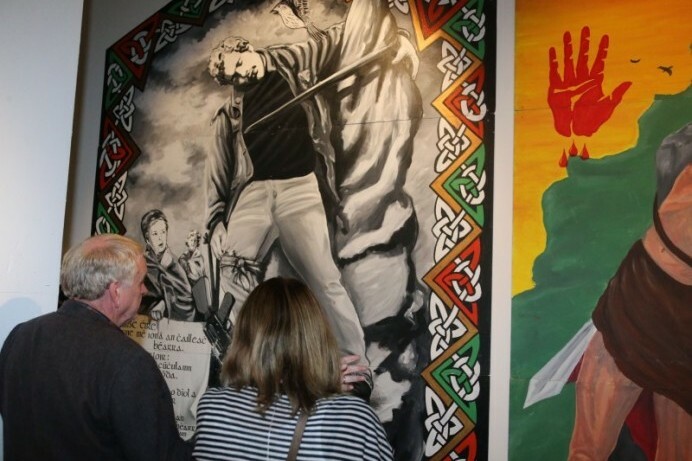 Causeway Coast and Glens Borough Council’s Museum Services are delighted to announce that the work of two local people forms part of the new Troubles and Beyond Gallery at the Ulster Museum. 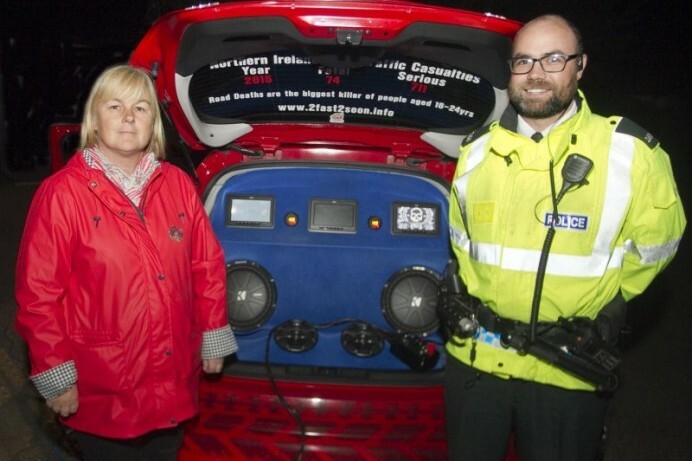 Causeway Coast and Glens Policing and Community Safety Partnership is using a car crash simulator to educate young drivers. 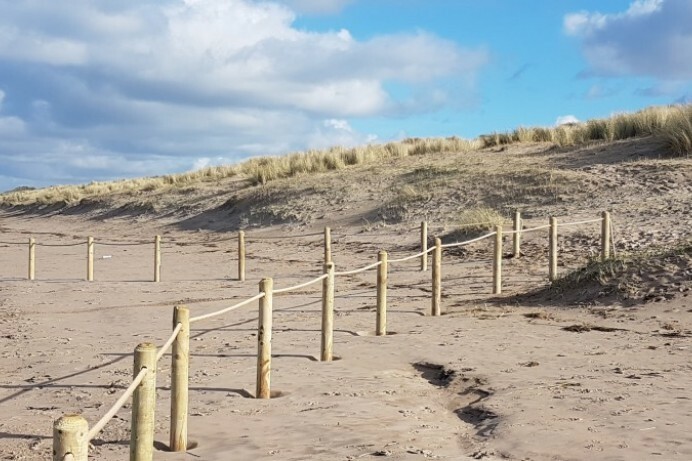 Causeway Coast and Glens Borough Council is working in partnership with Northern Ireland Environment Agency to help manage some of our most sensitive and well-loved coastal sites. 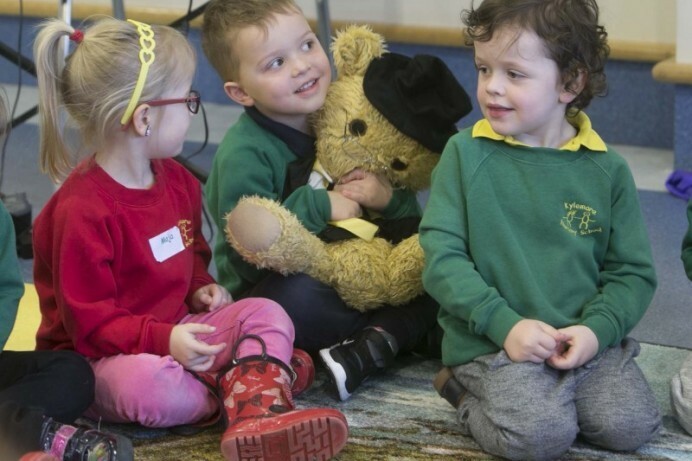 There are still places left on the half-term free circus school for children and young people. 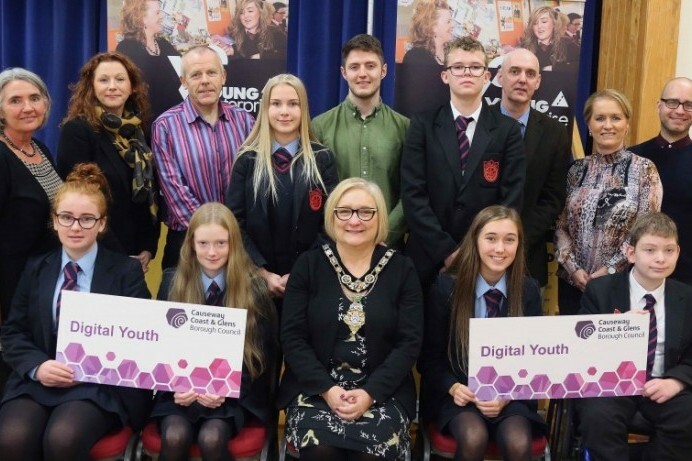 Students from Dunluce School in Bushmills have enjoyed the launch of Causeway Coast and Glens new Digital Youth Programme. 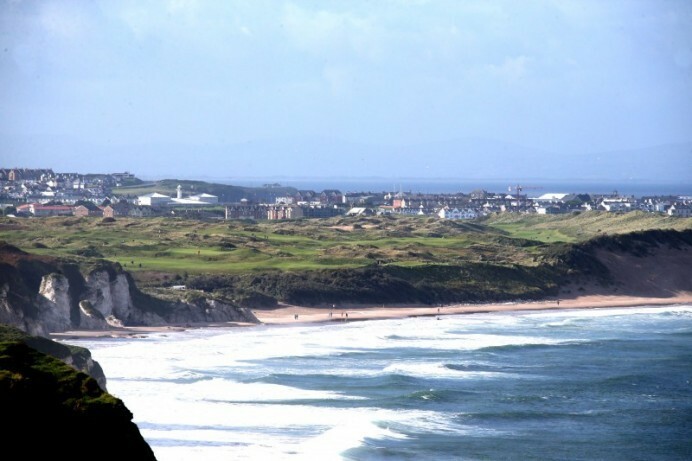 The 148th Open, Royal Portrush is the fastest-selling Championship in the history of The Open. 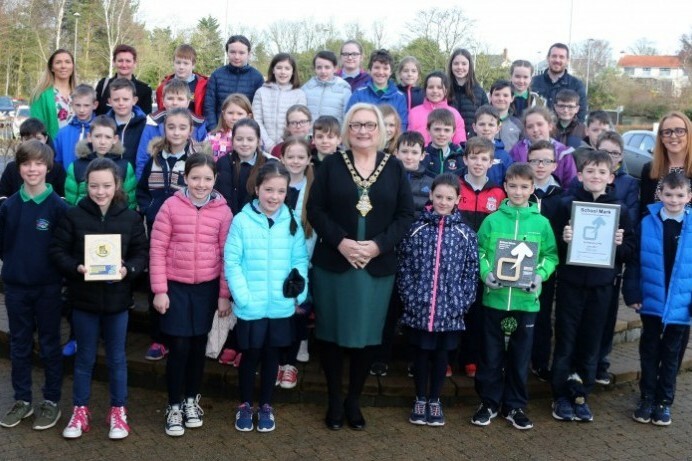 Primary 4 pupils from St Malachy’s Primary School and The Irish Society Primary School in Coleraine have taken part in the Mountsandel Field School Project. 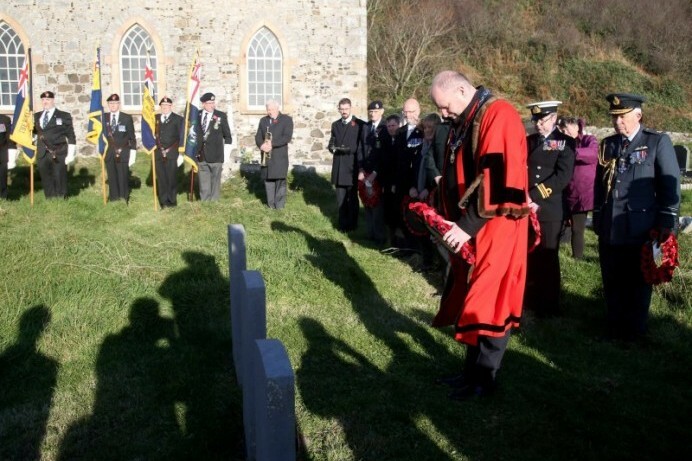 Royal British Legion Group 10 members have enjoyed a civic reception in Cloonavin. 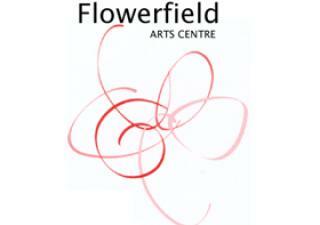 Are you a craft maker or artist and would you like to feature in Flowerfield Art Centre’s Christmas Craft Market? 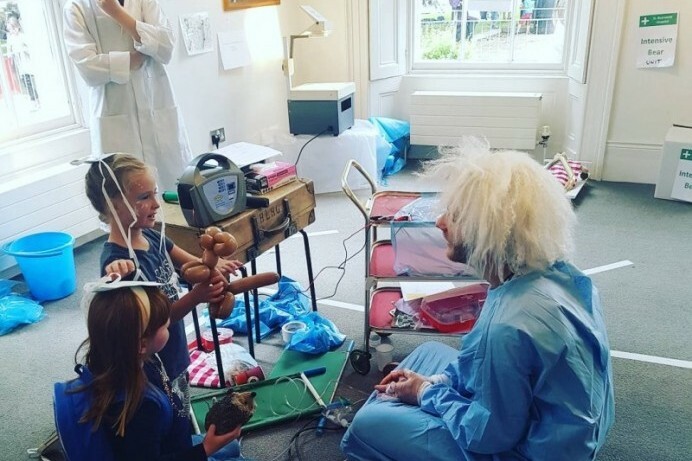 Flowerfield Arts Centre has oodles of creepy goings on to make your hair stand on end this Halloween. 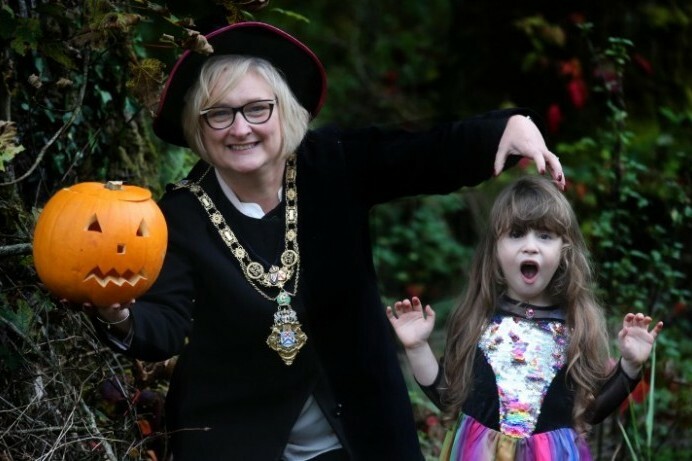 Halloween will be celebrated across the Causeway Coast and Glens with a series of spooktacular events. 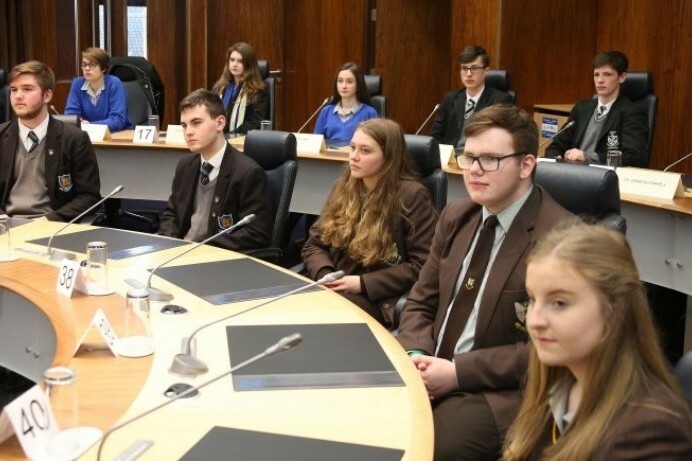 Secondary school pupils got the chance to question local elected members at a recent Good Relations event. 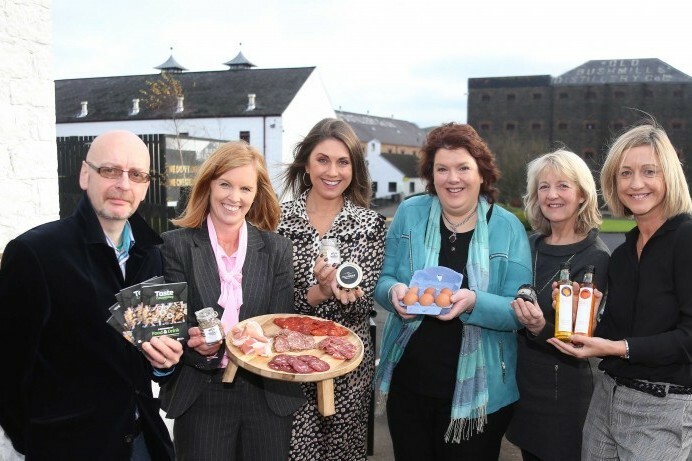 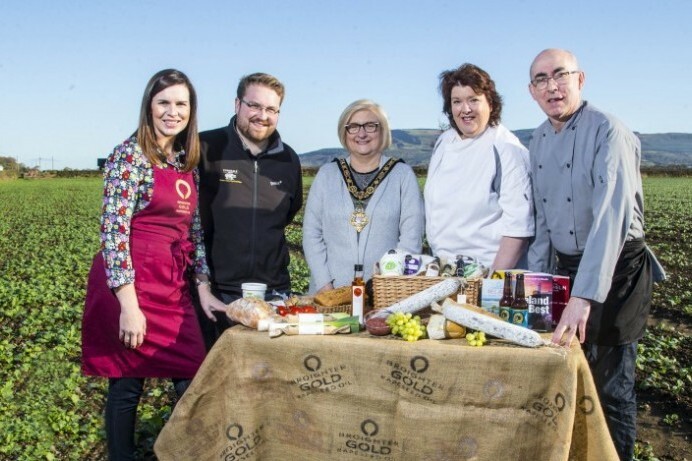 A new culinary celebration is set to serve up a treat this autumn across the Causeway Coast and Glens. 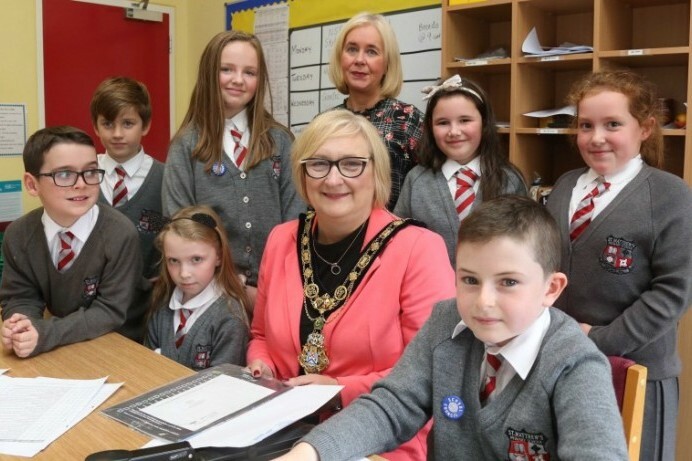 The Mayor of Causeway Coast and Glens Borough Council was welcomed to Roe Valley Integrated Primary School recently to enjoy afternoon tea with staff and pupils. 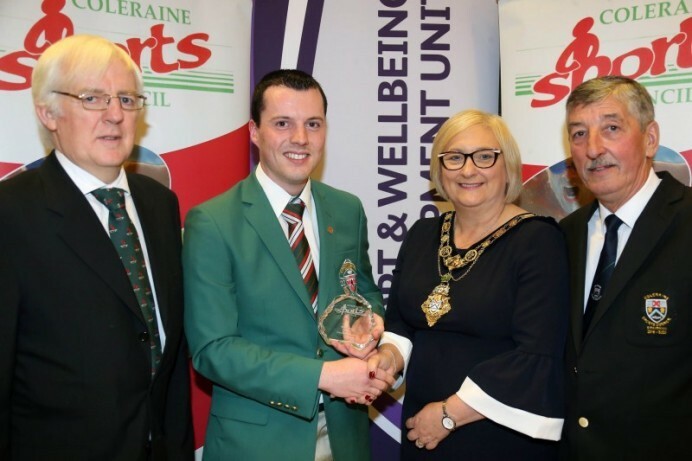 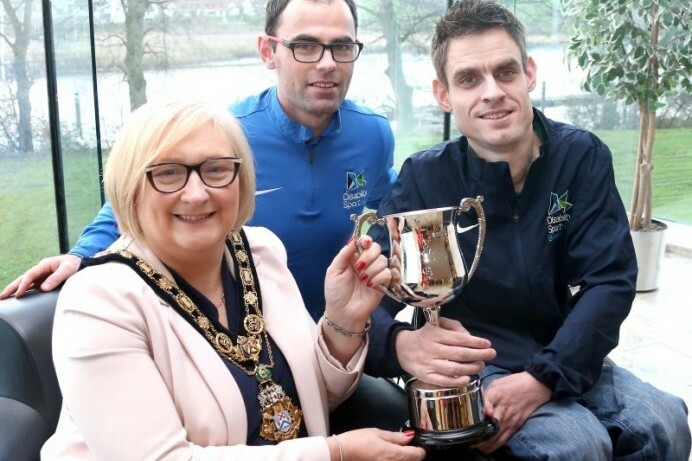 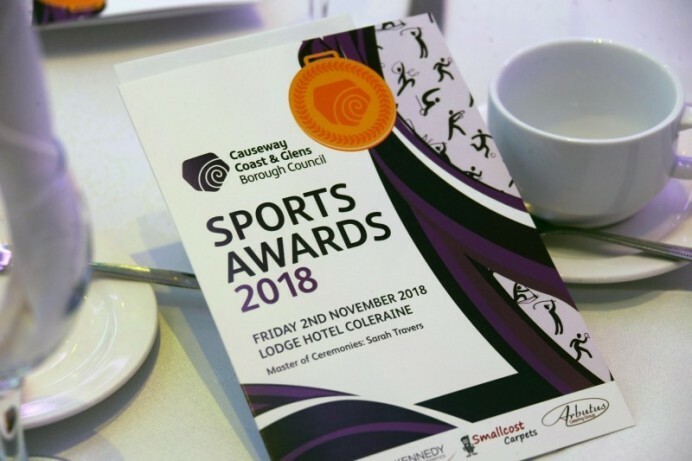 A range of sporting achievements have been recognised at Coleraine’s annual Sports Awards. 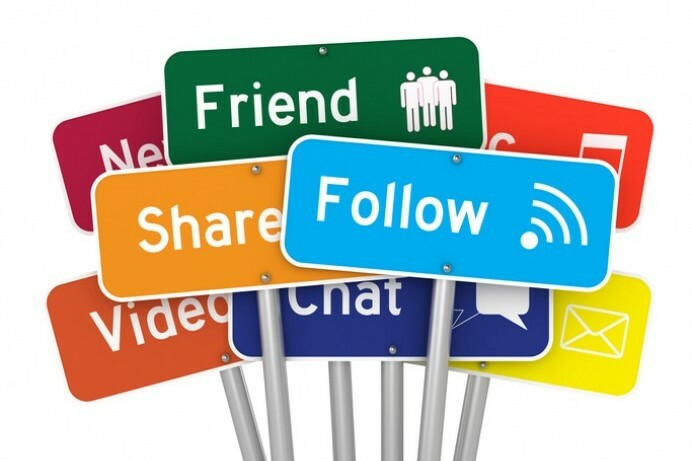 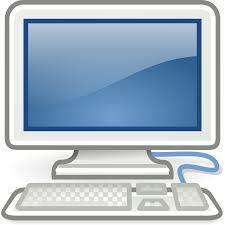 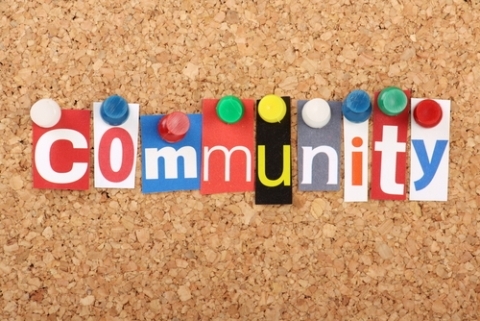 Are you a member of a local community or voluntary group? 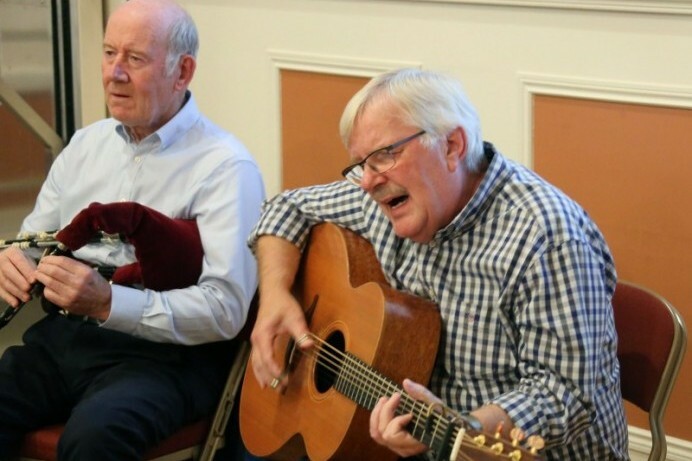 Flowerfield Arts Centre will welcome accomplished guitarist Frank Vignola and the Hot Jazz Guitar Trio on Wednesday 31st October. 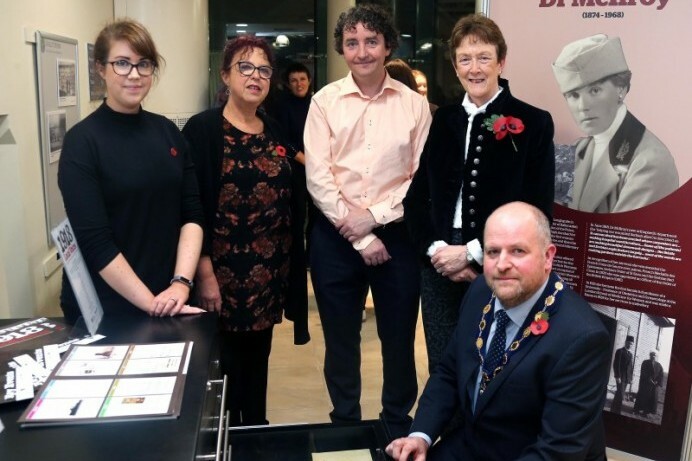 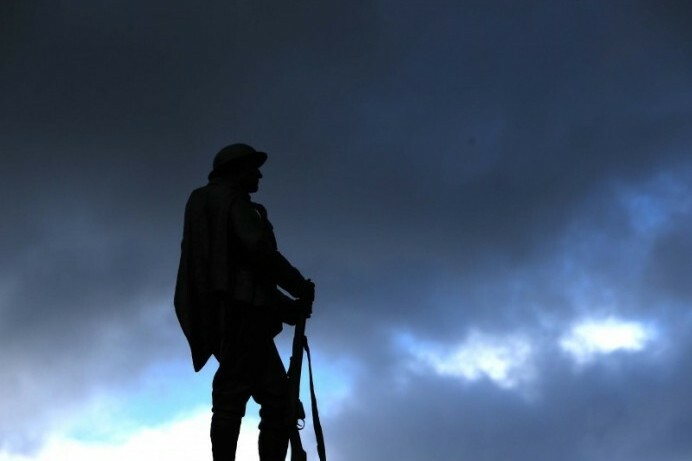 Causeway Coast and Glens Borough Council has unveiled a programme of events to commemorate the centenary of World War One. 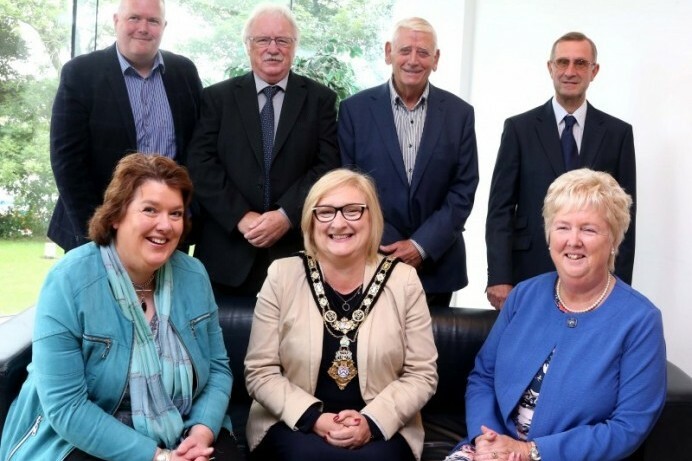 A civic reception has been held in Cloonavin for the long serving committee members of The Red Sails Festival. 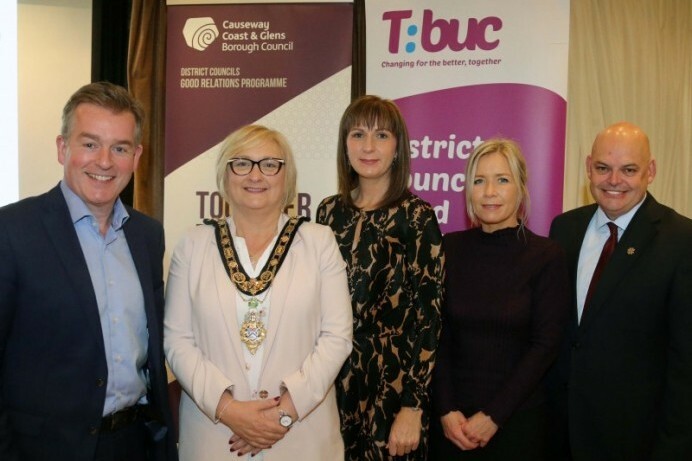 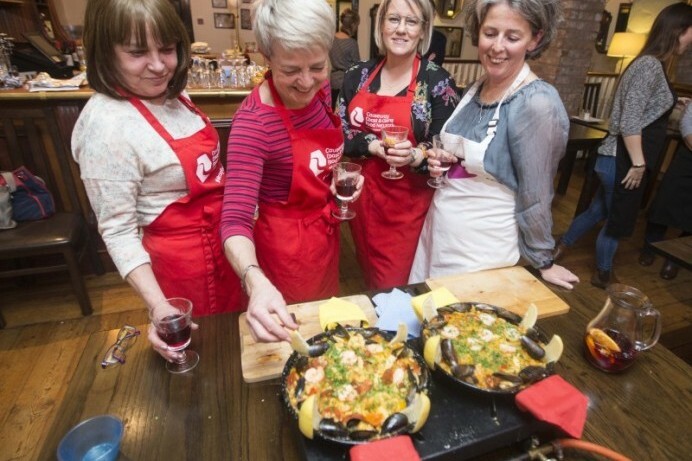 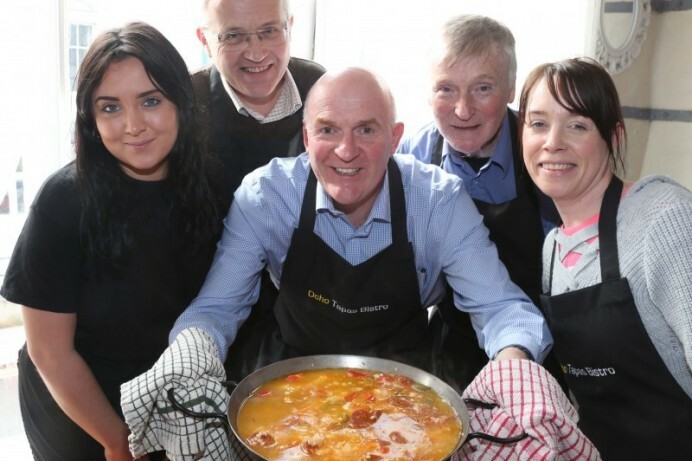 The importance of staff development in the hospitality industry was the focus of a recent event hosted by Causeway Coast and Glens Borough Council’s Destination Tourism Team. 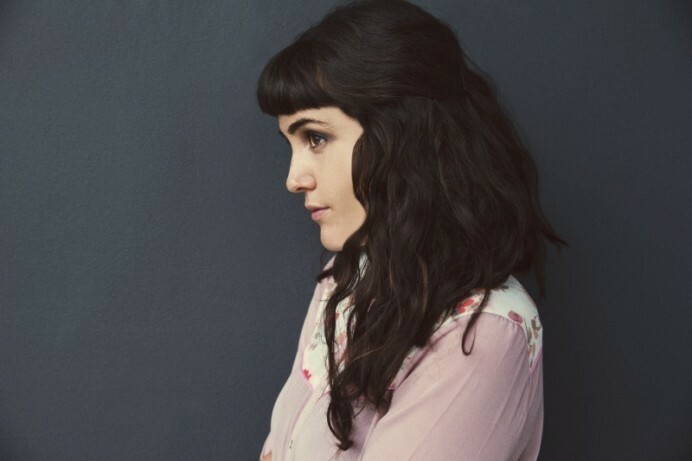 International singer songwriter Emily Barker will perform at Roe Valley Arts and Cultural Centre on Saturday 20th October at 8pm. 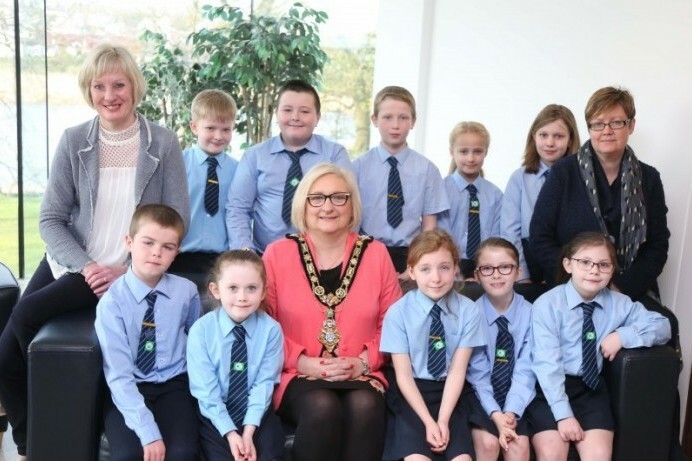 St Matthew’s Primary School in Drumsurn enjoyed a visit from the Mayor of Causeway Coast and Glens Borough Council as part of its 50th anniversary celebrations. 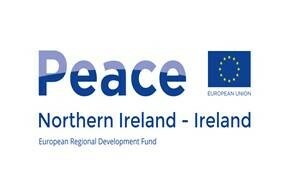 Work is getting underway on an EU PEACE IV funded project which will improve community facilities across the Causeway Coast and Glens. 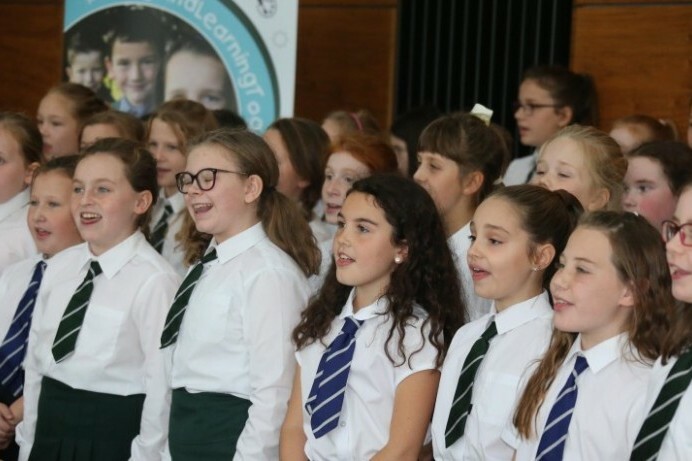 A special cross community choir performance in Cloonavin has marked Northern Ireland’s first Shared Education week. 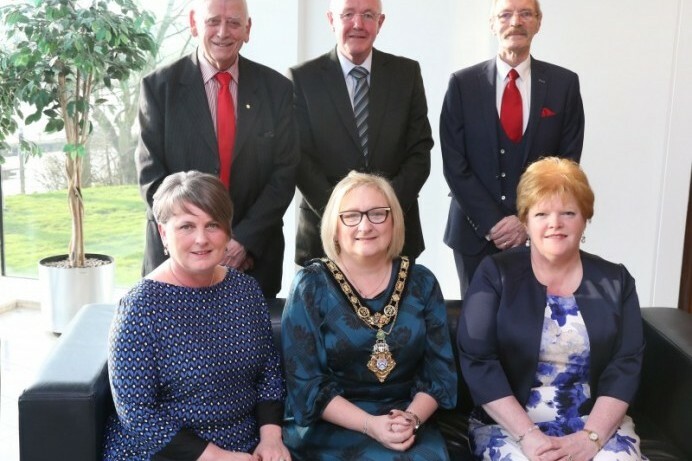 A civic reception has been held for members of Dungiven Regeneration Club who are helping to create a brighter future in the area. 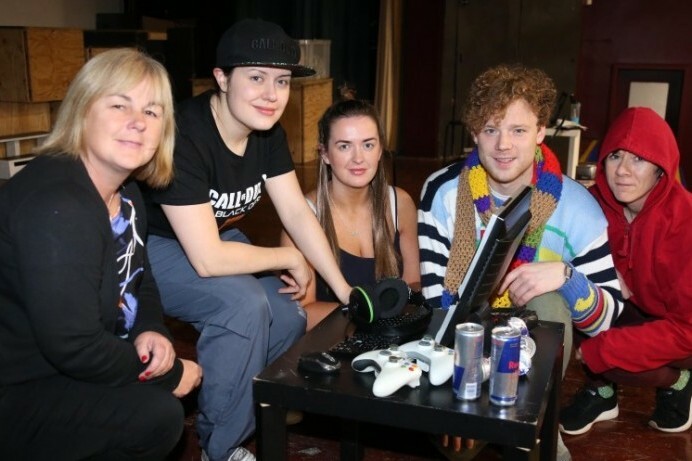 An educational play highlighting the dangers of alcohol and anti-social behaviour has been staged in local secondary schools. 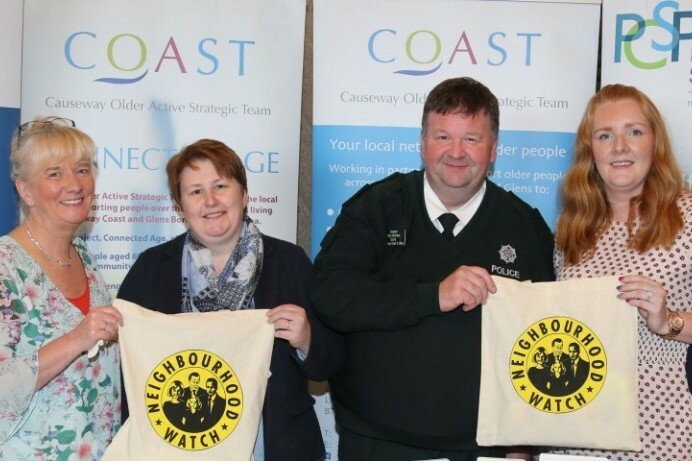 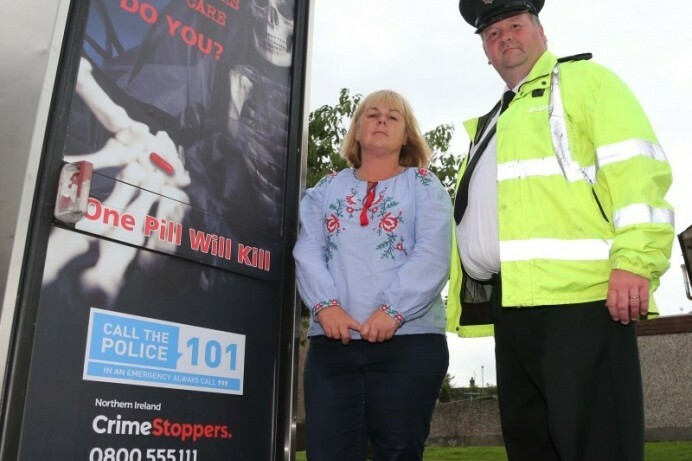 Protecting property and reducing the fear of crime were discussed recently at a Neighbourhood Watch conference in Portrush. 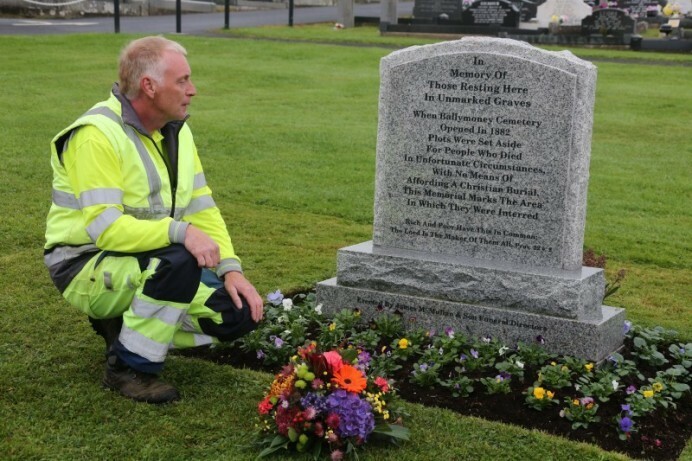 A poignant service has taken place in Ballymoney Cemetery to remember those laid to rest in the town’s ‘Paupers’ Graves’. 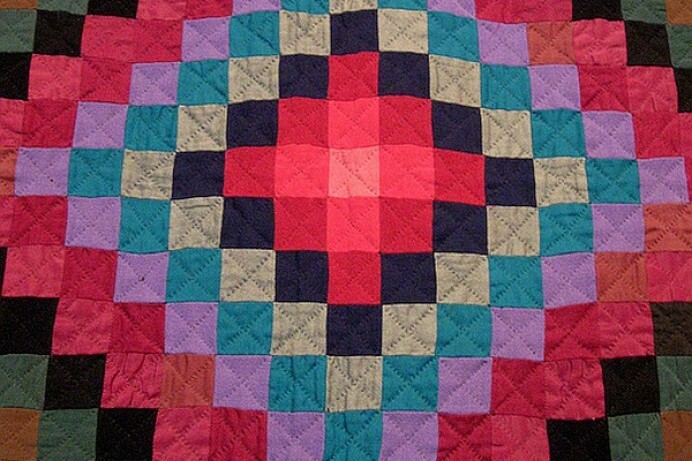 R.S. 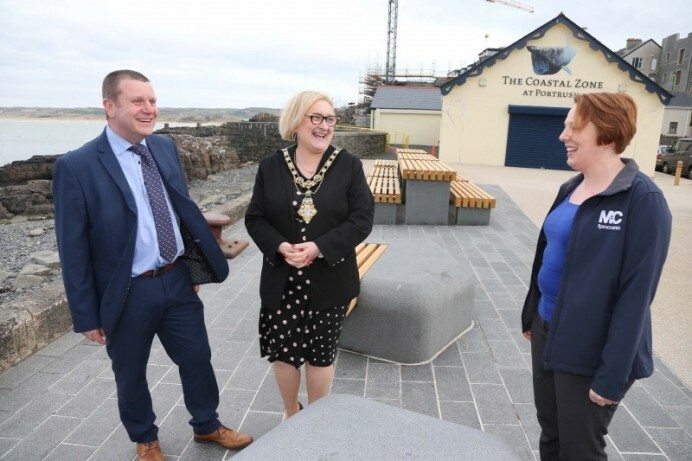 Sandblasting in Dungiven has become the 200th business to benefit from Causeway Coast and Glens Borough Council’s Go for It Programme. 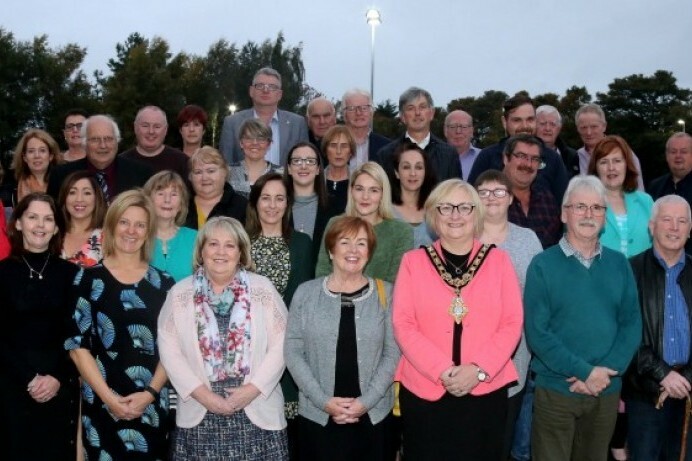 The Mayor of Causeway Coast and Glens Borough Council has attended a World International Day of Peace gathering in Ballycastle. 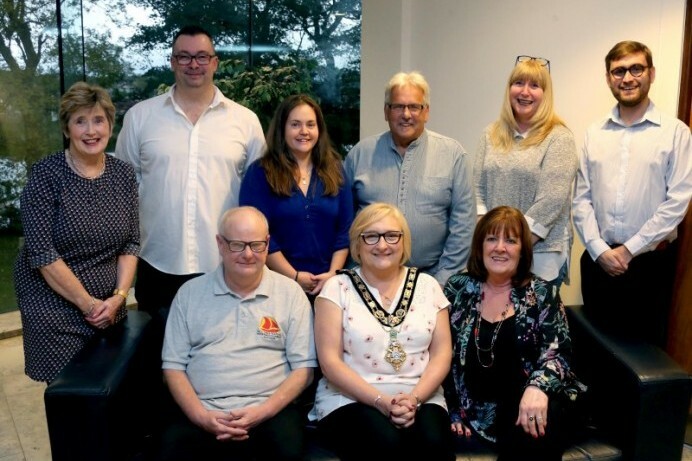 A visit to Limavady Orange Heritage Centre has taken place as part of a new Good Relations programme organised by Causeway Coast and Glens Borough Council. 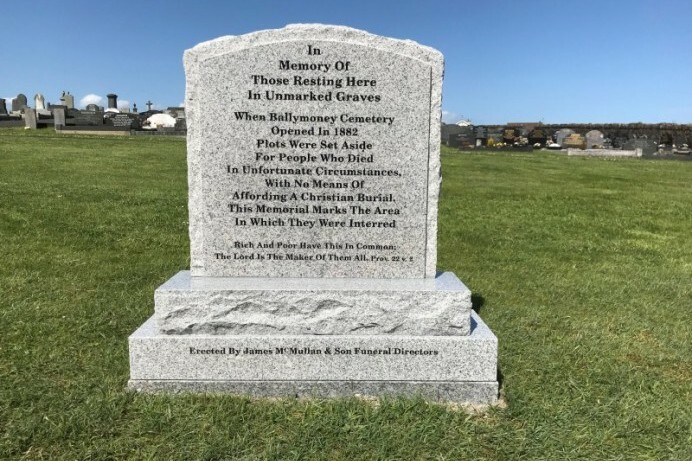 Members of the public are invited to attend a Service of Remembrance at Ballymoney Cemetery on Wednesday 3rd October at 11am for those interred in previously unmarked graves. 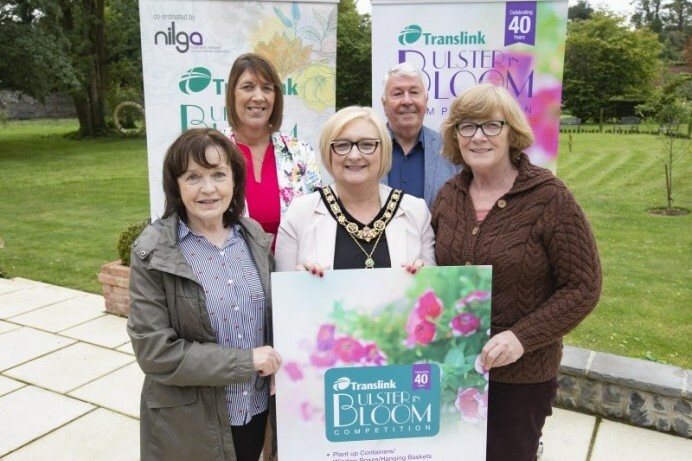 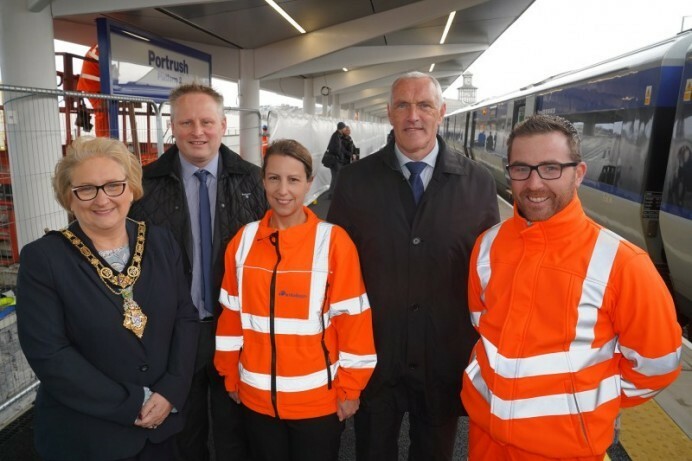 Ballymoney and Dungiven have been named Ulster in Bloom’s ‘most improved’ towns while Castlerock was recognised in the ‘Community Rail Halt’ category. 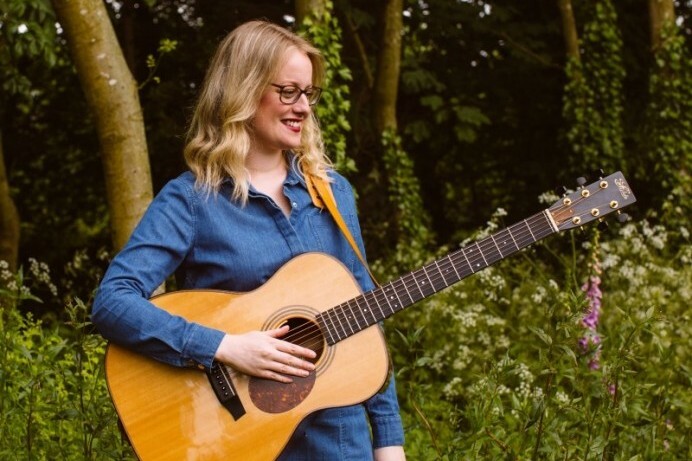 The smooth guitar sounds of Eilidh Patterson will entertain audiences at Flowerfield Arts Centre on Saturday 29th September at 8pm. 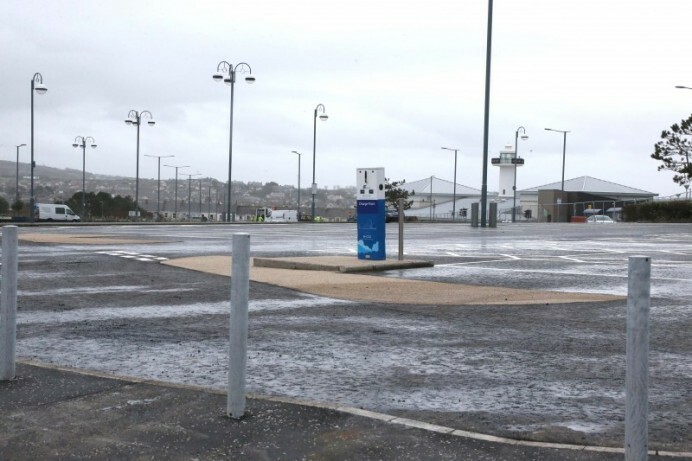 A photograph entitled ‘Trust’ was one of three winning entries in this year’s Vauxhall International NW 200 photography competition. 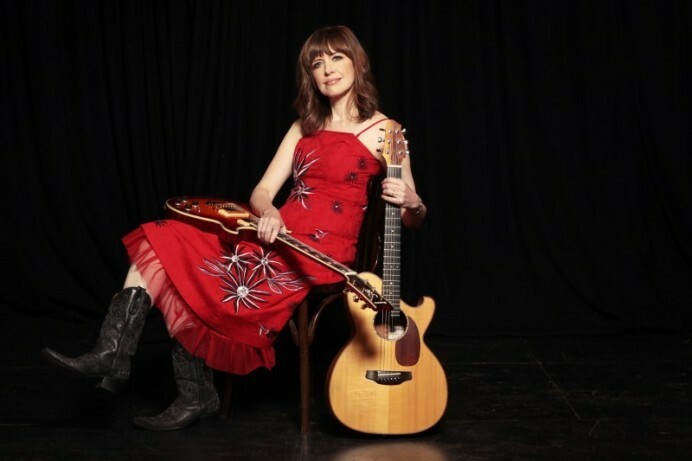 A taste of Nashville comes to Roe Valley Arts & Cultural Centre with three country folk stars performing in ‘On the Road and In the Round’ on Friday 5th October at 8pm. 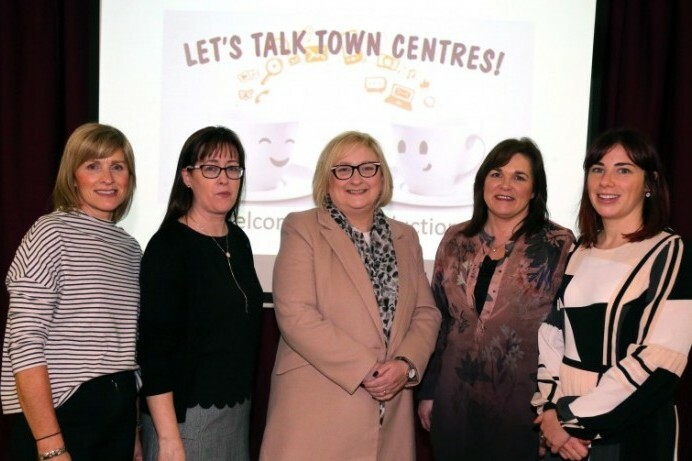 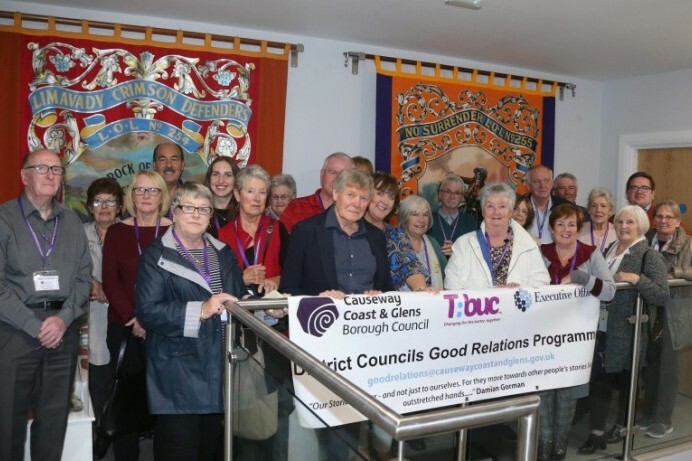 A visit to the Ulster Museum has marked the start of a programme of events organised by Causeway Coast and Glens Borough Council’s Good Relations team. 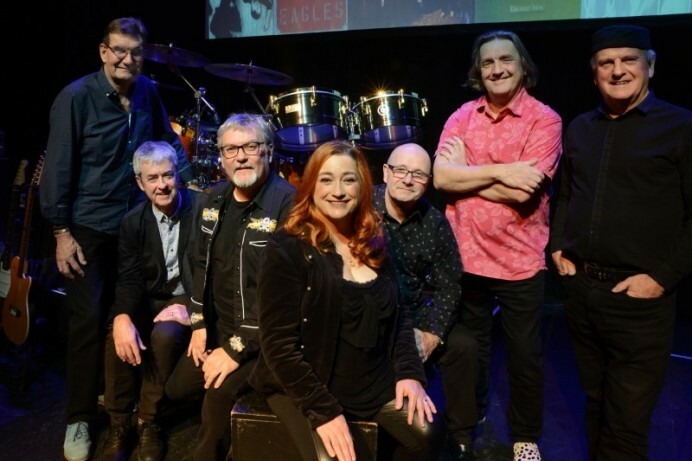 Songs in the Sam Henry collection have been brought back to life by North Antrim based music group Scad the Beggars. 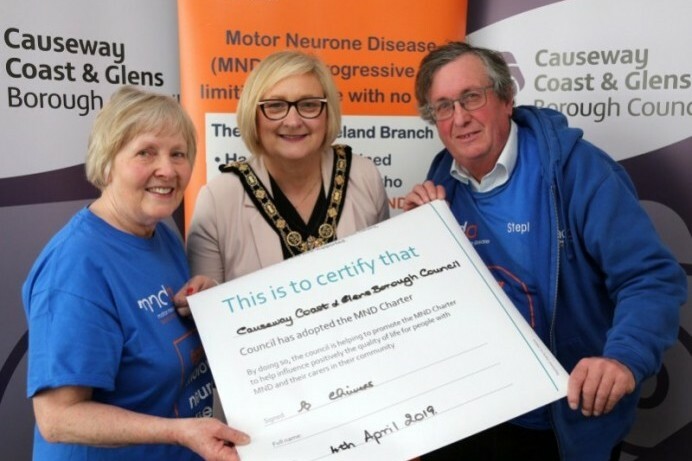 Causeway Coast and Glens Borough Council is reminding householders about the dangers associated with blind cords. 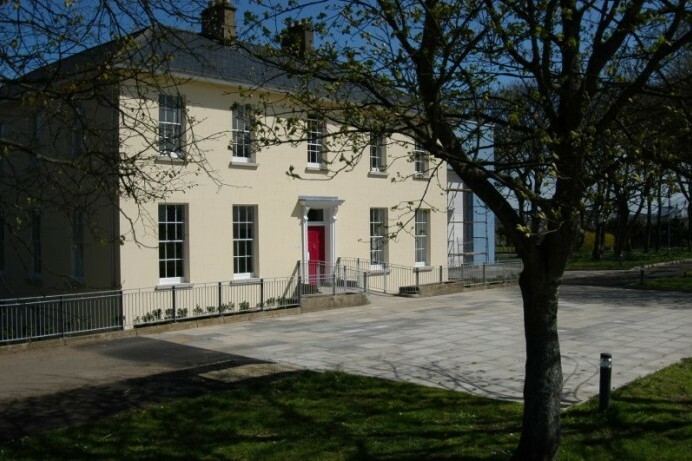 Limavady Writers Group will launch its first collaborative publication at Roe Valley Arts & Cultural Centre on Tuesday 25th September. 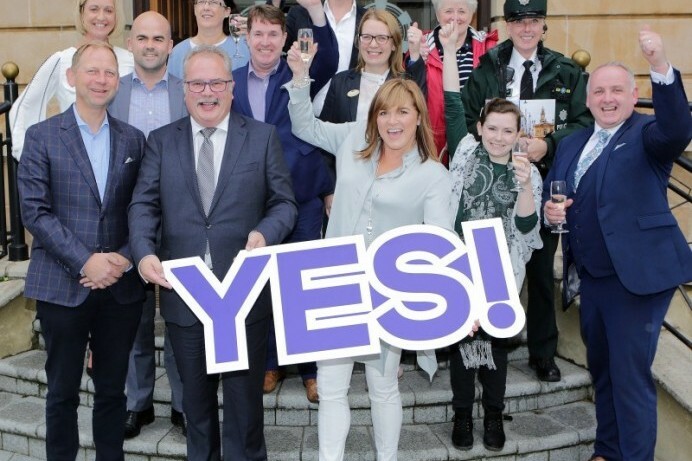 Businesses and organisations in Coleraine have voted in favour of taking more control over their future by setting up Northern Ireland’s eighth Business Improvement District (BID). 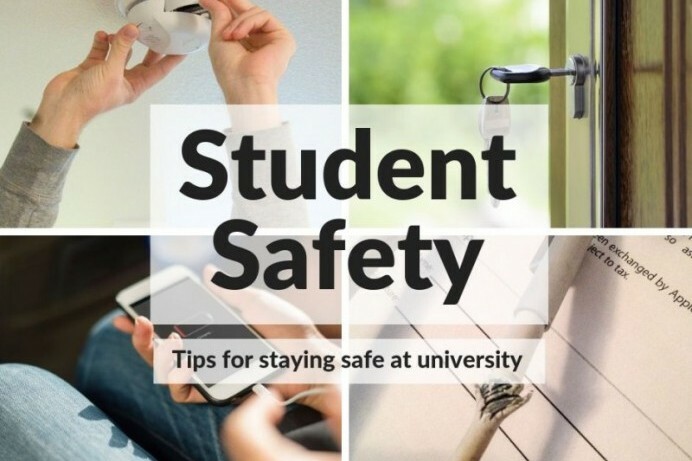 As college and university students prepare for a new academic year, Council is encouraging students to keep safe by being aware of potential hazards in their home or student accommodation. 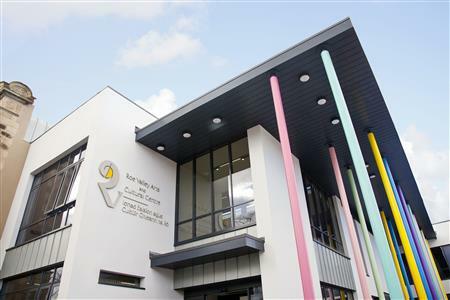 An innovative scheme which gives school pupils important lessons on energy efficiency has been shortlisted for a prestigious award. 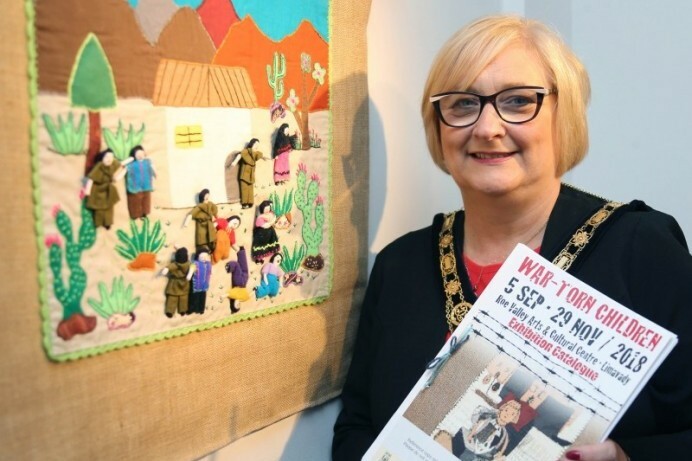 A new exhibition which reflects on the global impact of war on children has gone on display in Roe Valley Arts and Cultural Centre. 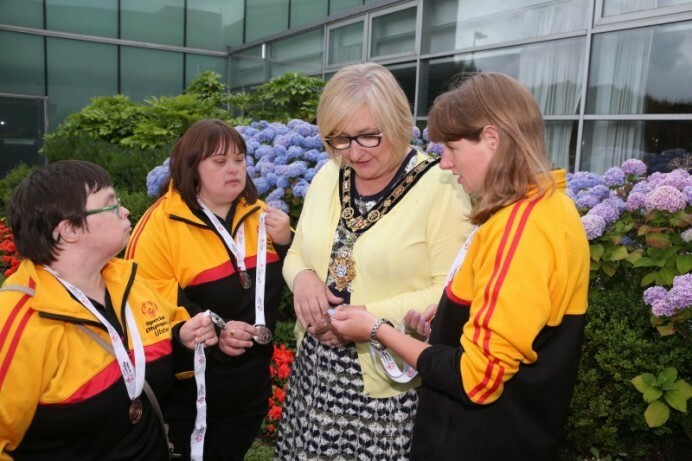 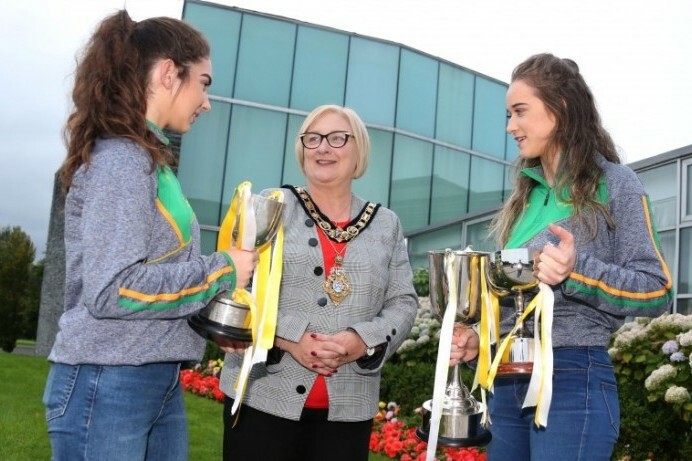 A civic reception has been held in recognition of two All-Ireland winning camogie teams from County Antrim. 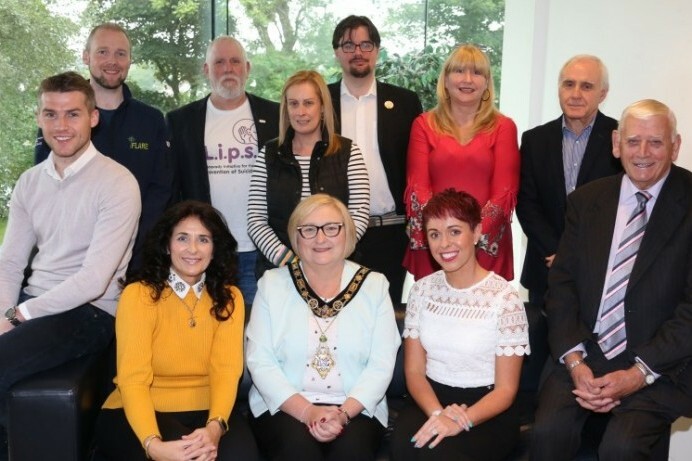 Civic reception marks World Suicide Prevention Day. 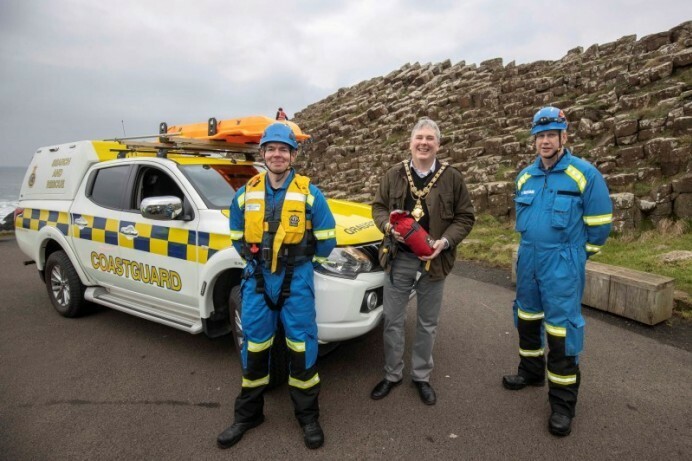 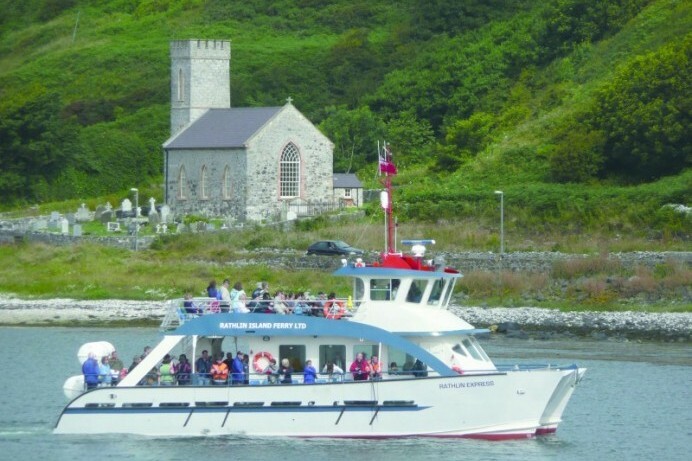 The Mayor of Causeway Coast and Glens Borough Council has enjoyed a visit to Rathlin Island. 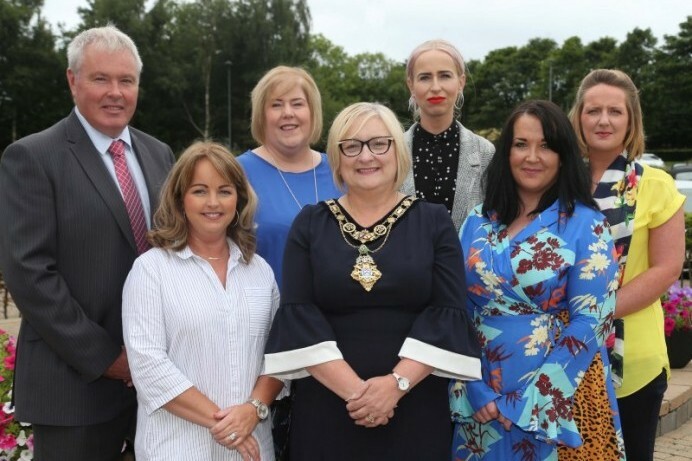 The latest recipients of Causeway Coast and Glens Borough Council’s Enterprise Fund have enjoyed a civic reception in Cloonavin. 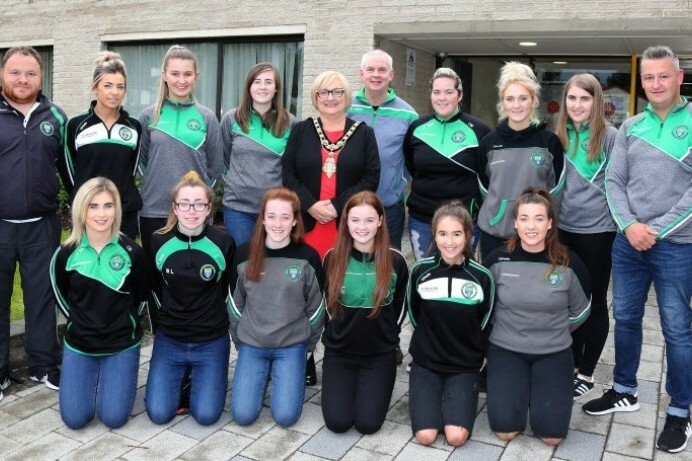 The recent achievements of Faughanvale Ladies GAC have been marked by a civic reception. 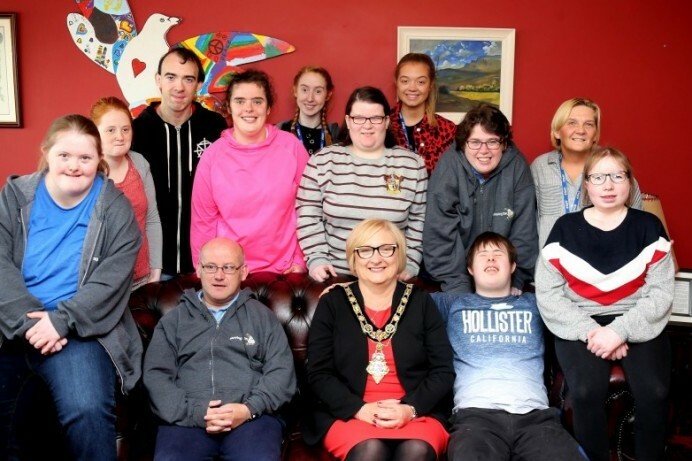 Students from ‘Moving On Up’ in Limavady have enjoyed a special civic reception. 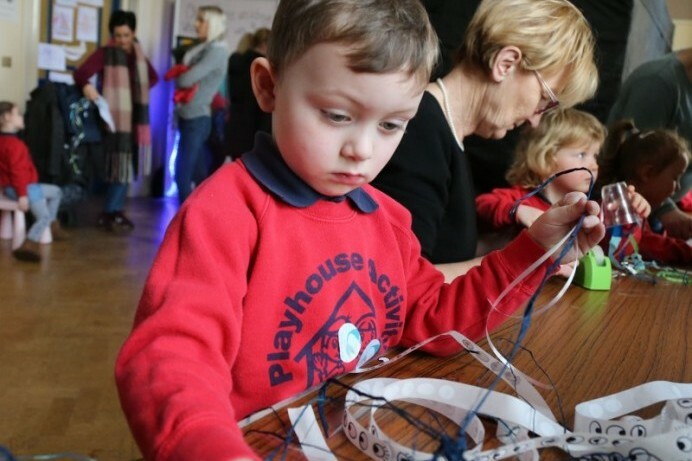 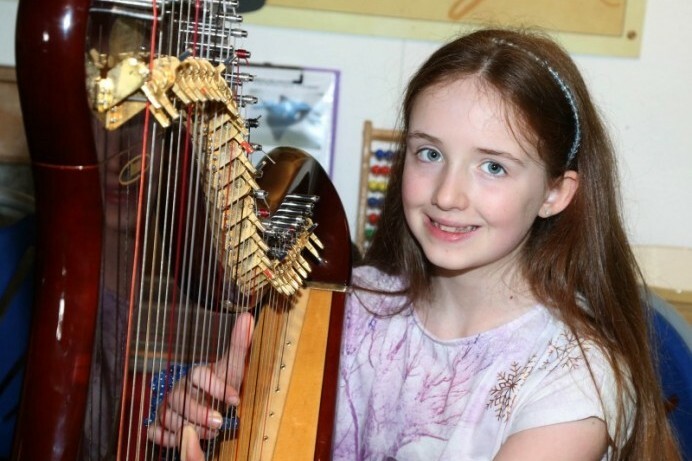 A full programme of creative workshops for children will take place at Roe Valley Arts and Cultural Centre this Autumn. 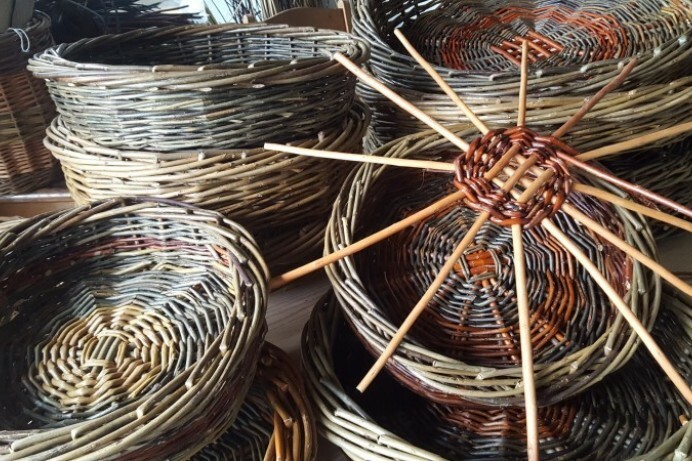 Roe Valley Arts and Cultural Centre has a feast of creative workshops in store throughout September to December. 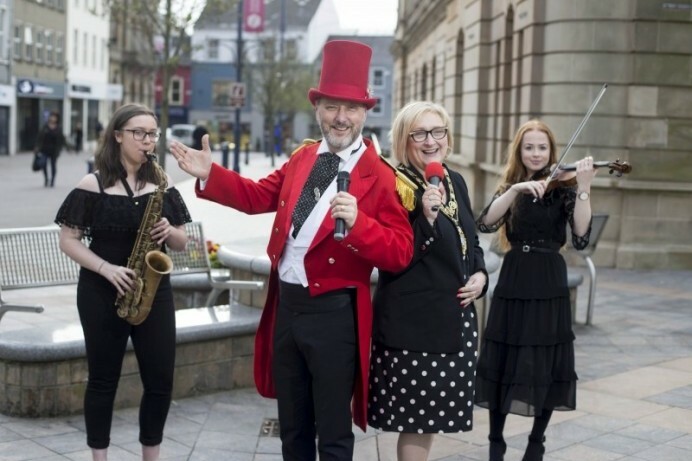 Roe Valley Arts & Cultural Centre in Limavady has launched its new autumn season of events packed full of music, theatre and family fun. 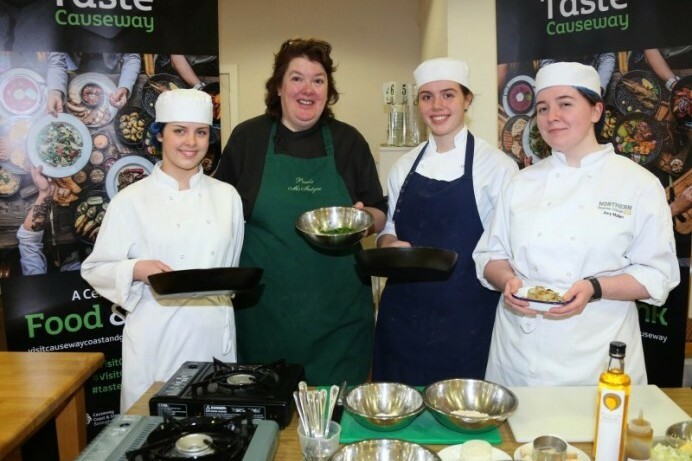 Are you aged between 14 to 16 and looking for a new and exciting experience this autumn? 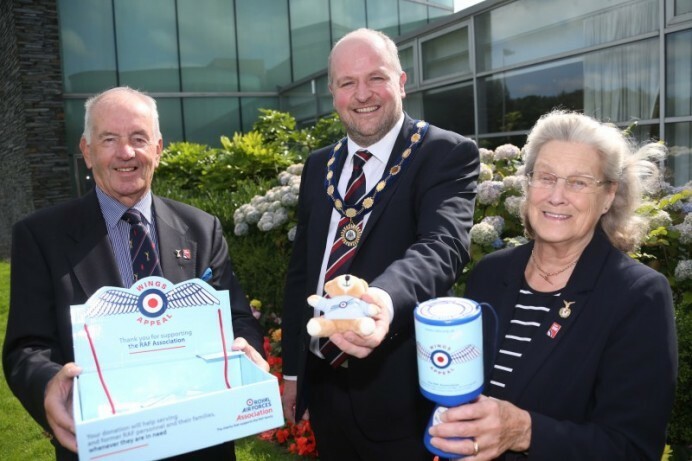 The 100th anniversary of the R.A.F.A Wings Appeal has been launched with a special reception in Cloonavin. 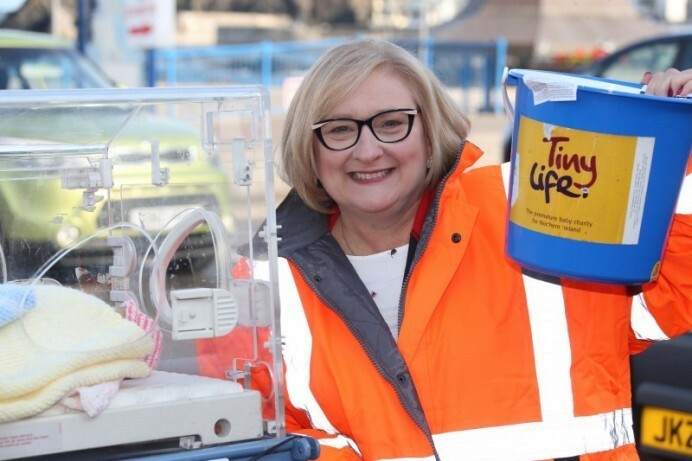 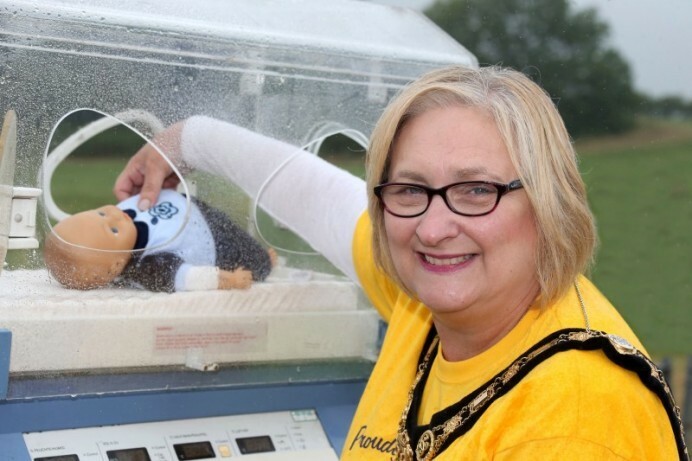 An Incubator Push in aid of TinyLife has so far raised over £1300. 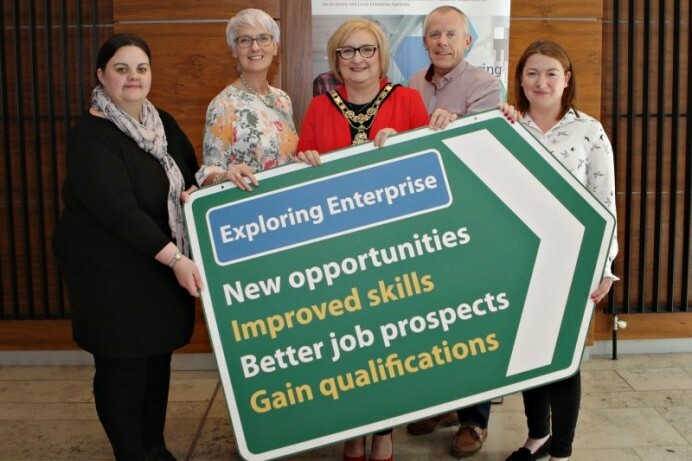 A new programme has launched in the Causeway Coast and Glens Borough Council area which will boost jobs by working with unemployed and economically inactive people in the region. 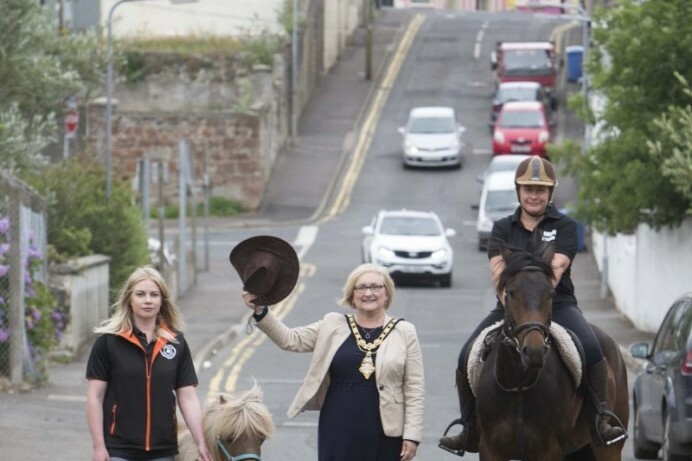 Thousands of people lined the streets of Ballycastle to sample the unique festival atmosphere of this year's Ould Lammas Fair. 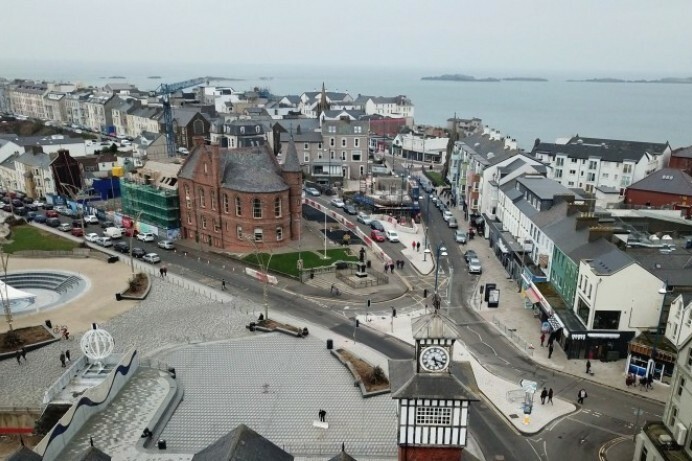 Bin collections will take place as normal on Monday 27th August 2018 except for Ballycastle town. 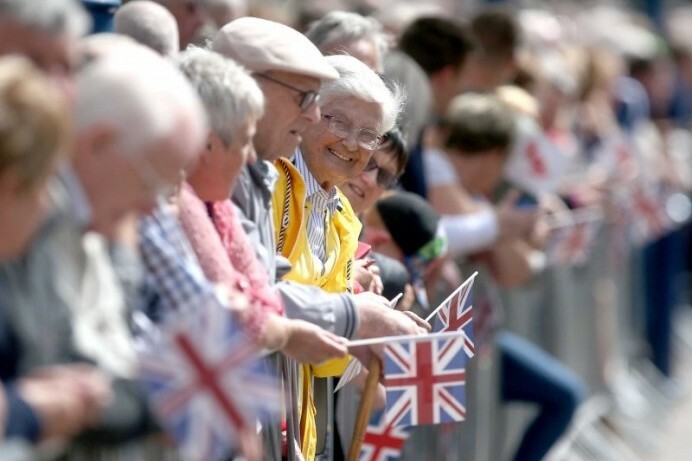 Are you ready for two-days of superb aerial displays matched by a fantastic range of attractions on the ground? 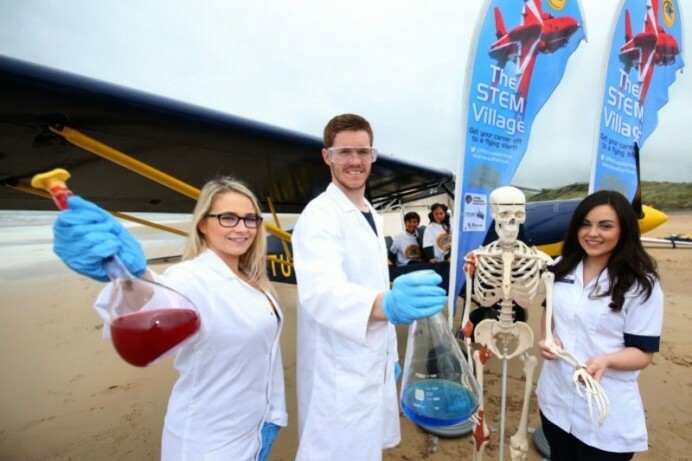 Individuals with additional needs can look forward to an enhanced experience at The STEM Village during Air Waves Portrush. 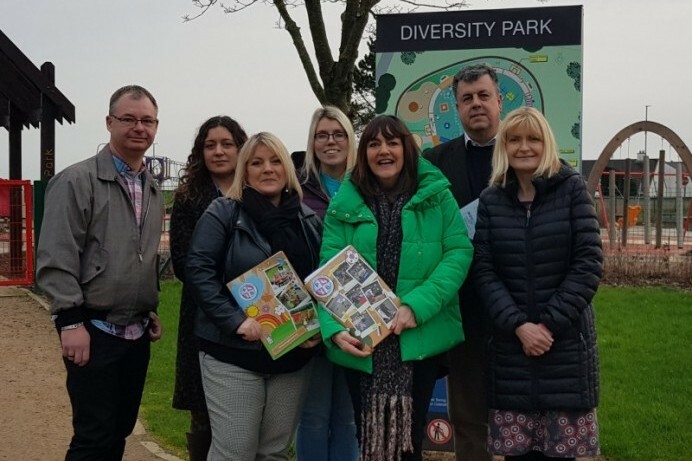 The Good Relations team at Causeway Coast and Glens Borough Council is organising a series of visits to historical and cultural venues within the Borough to encourage understanding of the diversity of people and places which make up our area. 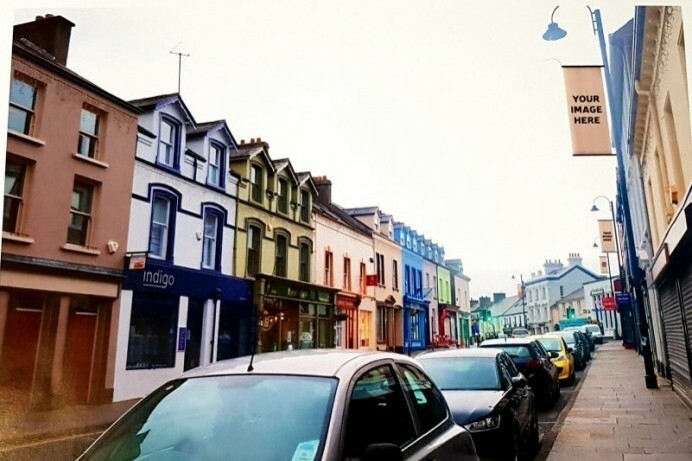 A twilight market, seafront fireworks, live music in the Diamond and hundreds of stalls through the streets will be just some of the highlights of this year’s Ould Lammas Fair. 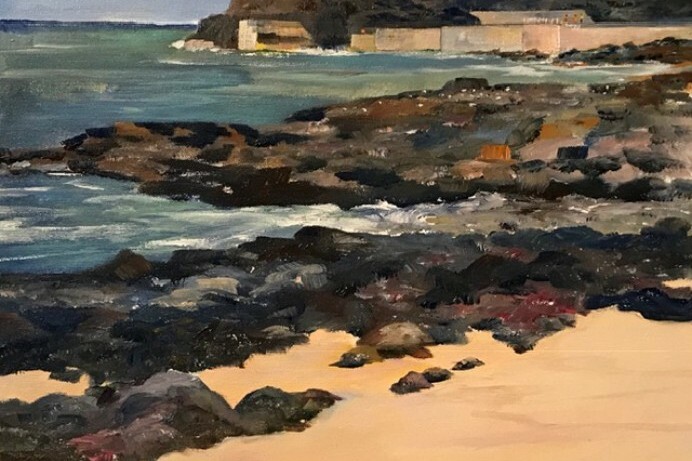 Flowerfield Arts Centre in Portstewart welcomes an exhibition of paintings by Armoy based artist Nicola Nemec from September 8th – 29th. 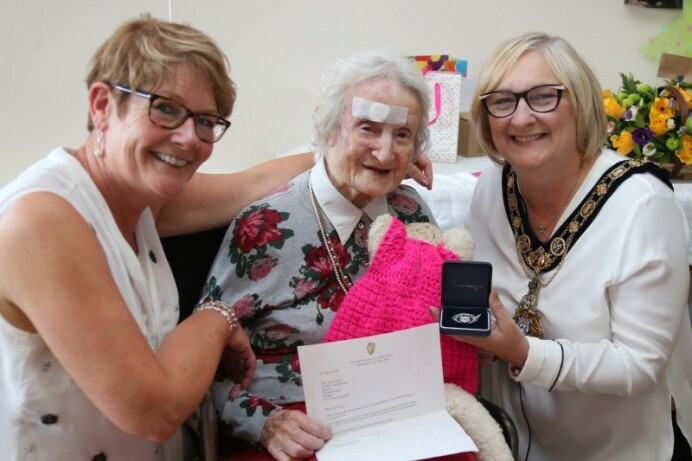 A special lady is celebrating reaching the magnificent age of 103. 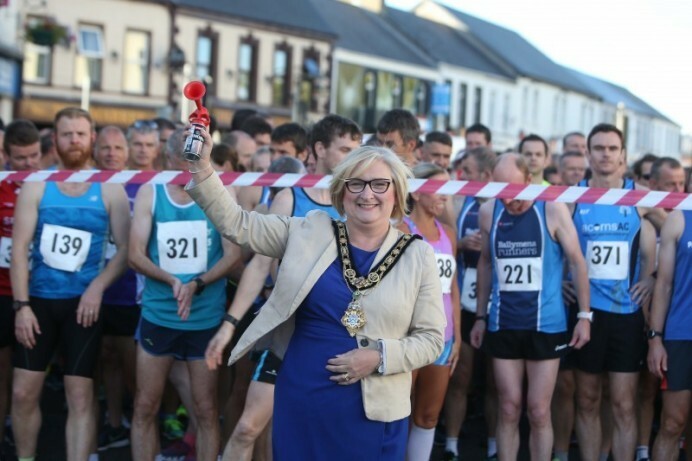 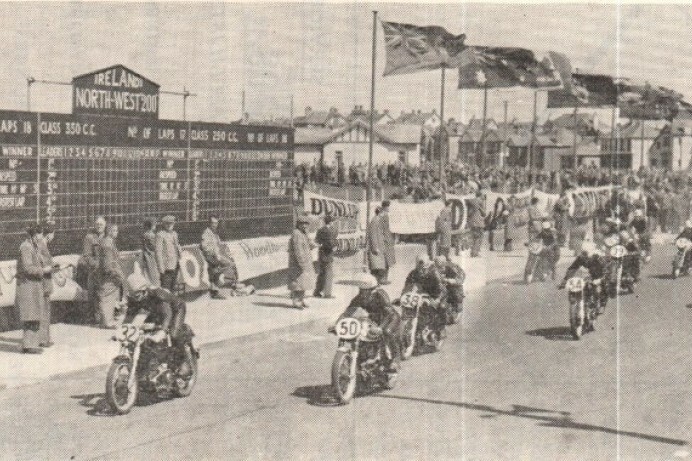 This year’s Edwin May Five Mile Classic attracted 401 entrants, making it the biggest event since it was first held in Coleraine. 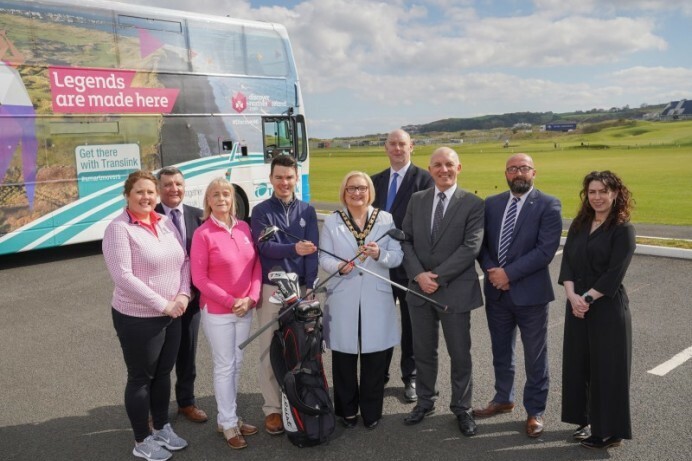 The full flying schedule for Air Waves Portrush can now be revealed, promising two days of superb aerial displays in an unforgettable seaside setting. 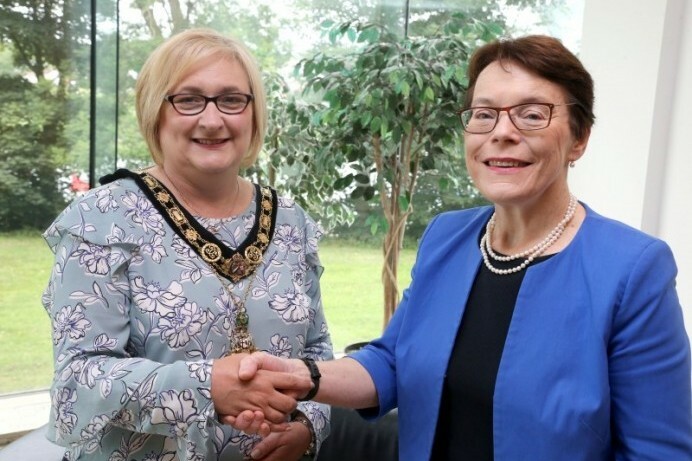 Causeway Advice Consortium have successfully secured a new three year contract to provide advice services to local residents in the Borough. 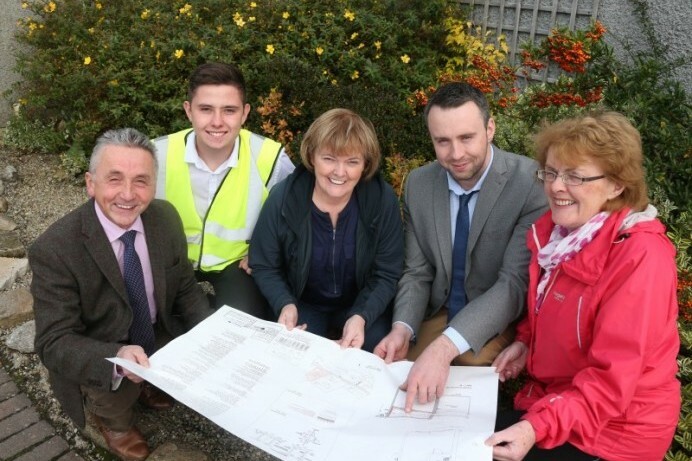 Causeway Coast and Glens Borough Council is currently reviewing the play park facilities in Limavady. 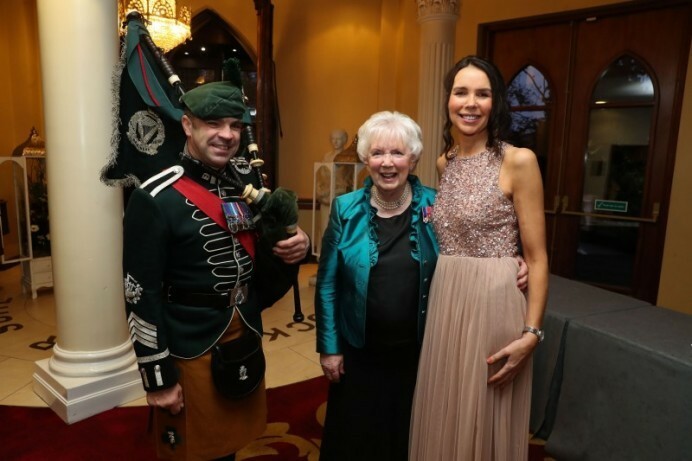 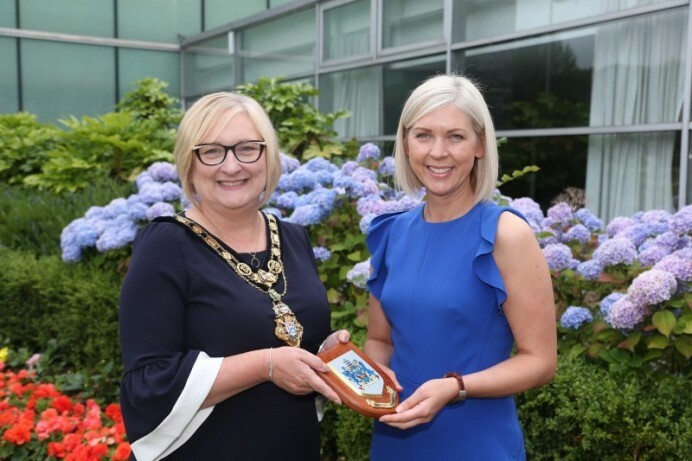 A civic reception has been held in Cloonavin for Dental Hygienist of the Year Joanne Cregan. 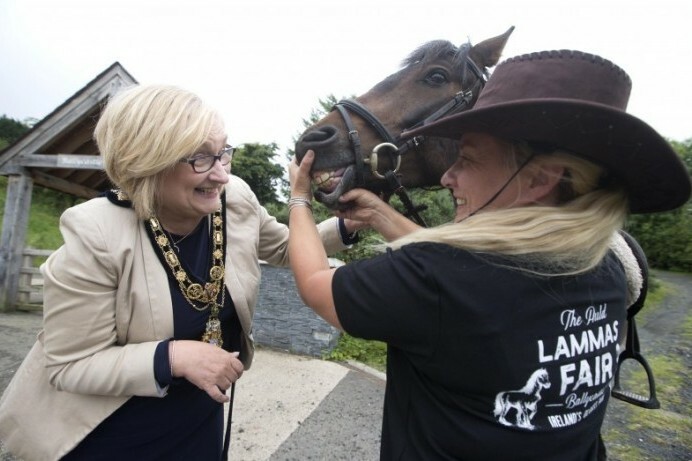 Point-to-Point horse racing will take place on Ballycastle beach as part of this year’s Ould Lammas Fair celebrations. 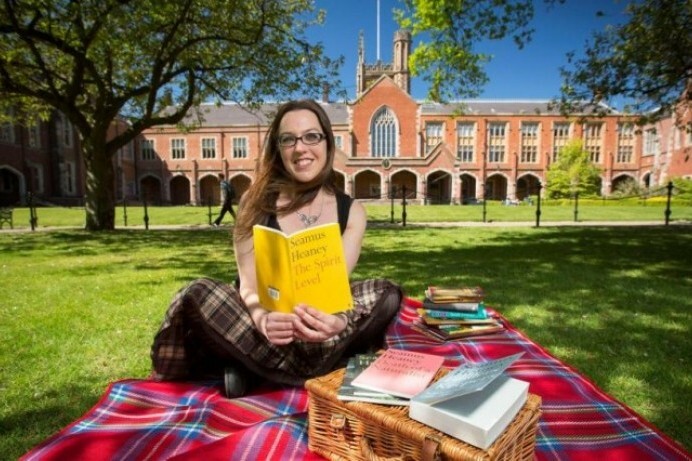 Northern Ireland’s first Children’s Writing Fellow is coming to Roe Valley Arts and Cultural Centre on Saturday 11th August. 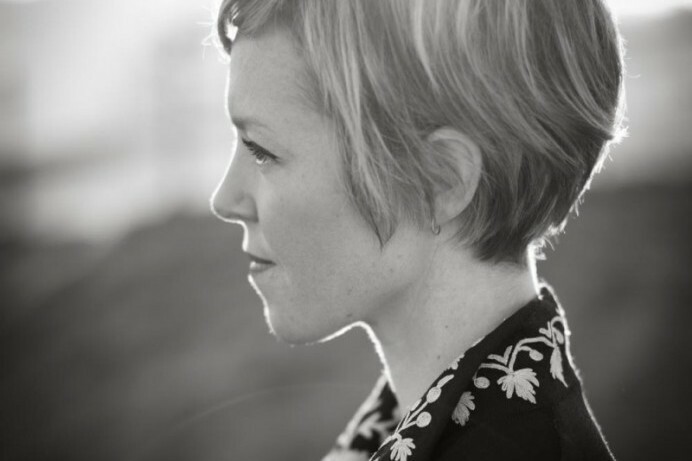 International singer songwriter Lisa Hannigan will perform at Roe Valley Arts and Cultural Centre this month. 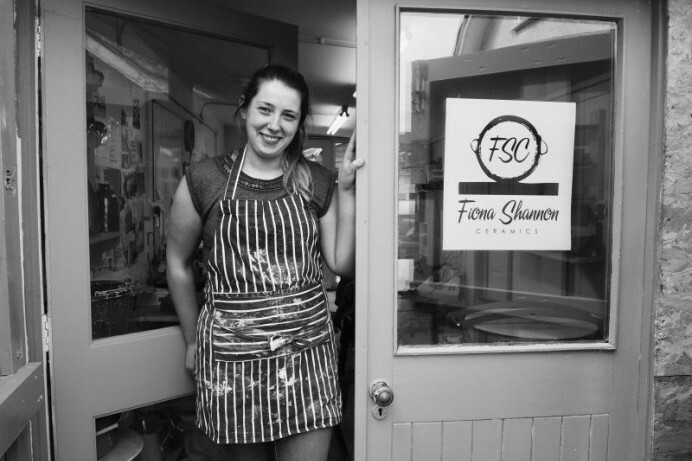 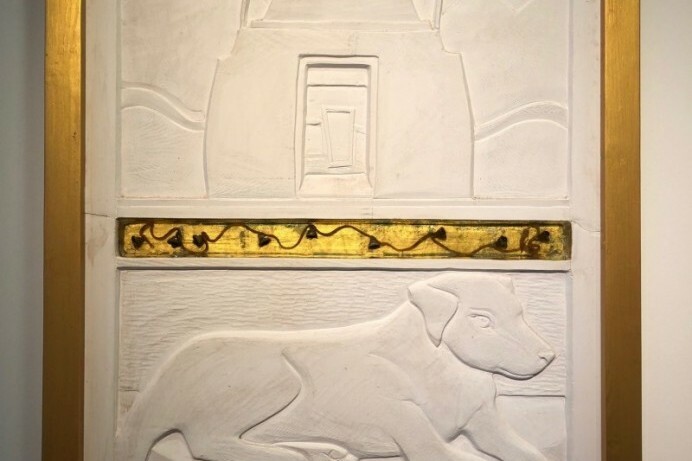 Artist Eleanor Wheeler will present her new exhibition at Roe Valley Arts and Cultural Centre in Limavady this month. 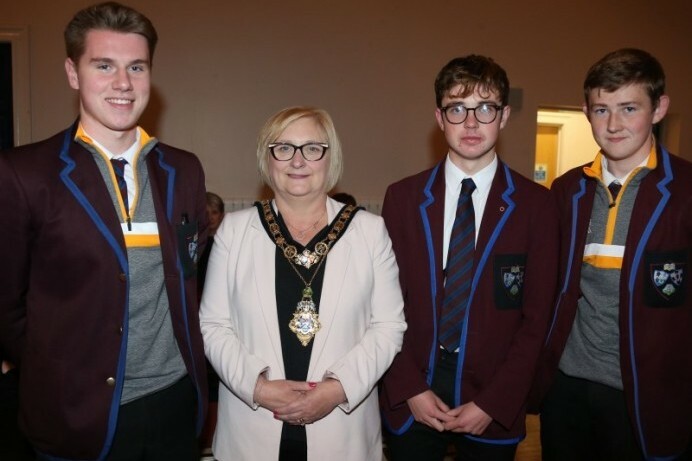 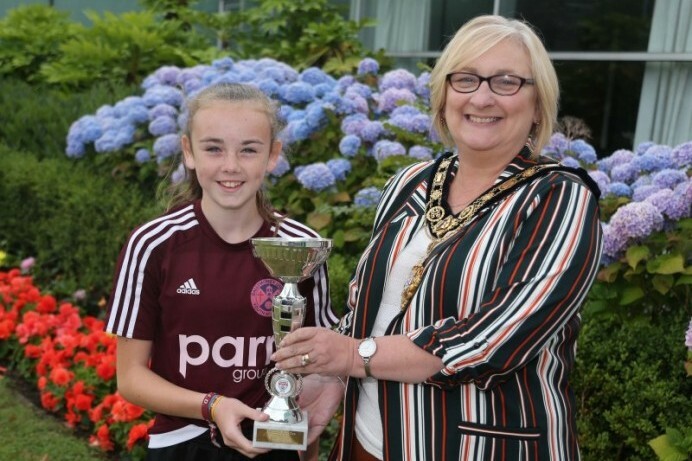 Ballymoney Football Academy’s Foyle Cup winning team has enjoyed a civic reception with the Mayor of Causeway Coast and Glens Borough Council. 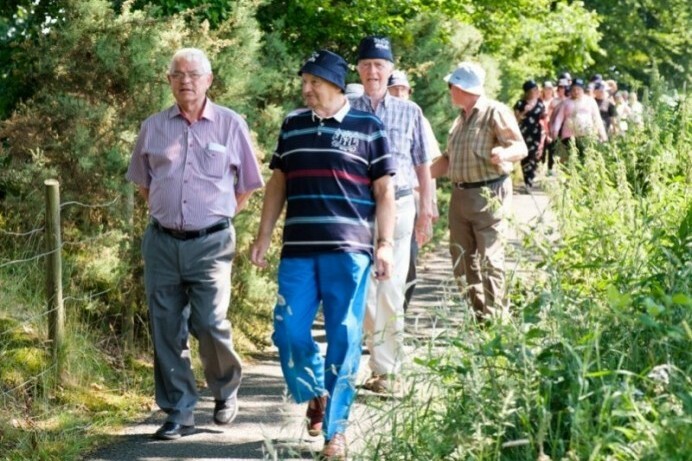 The first ever Causeway Coast and Glens Walking for Health Festival begins on August 2nd. 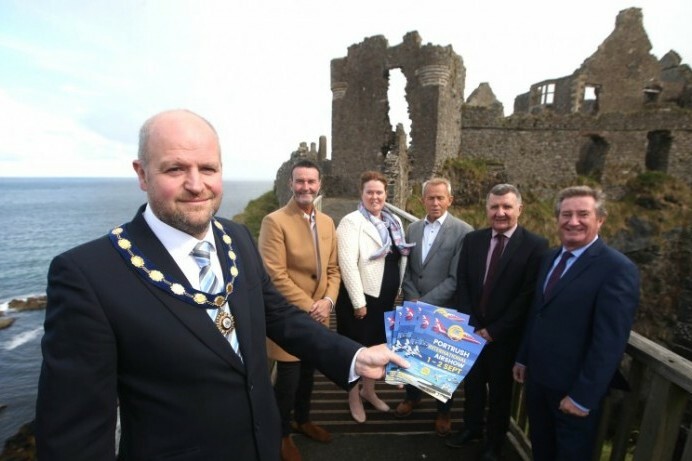 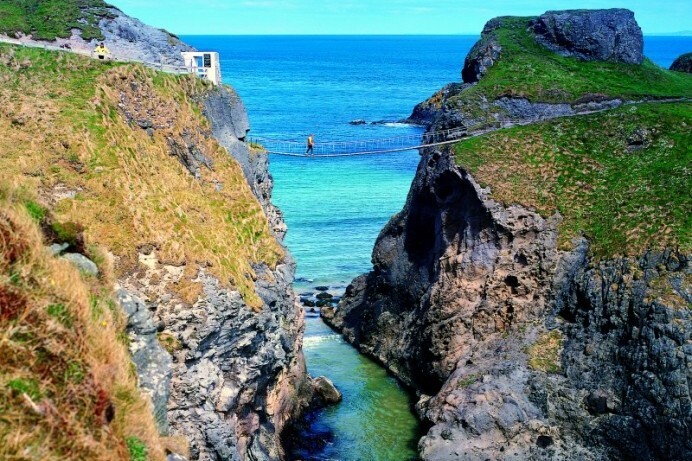 The Causeway Coast and Glens destination is celebrating its best ever tourism performance. 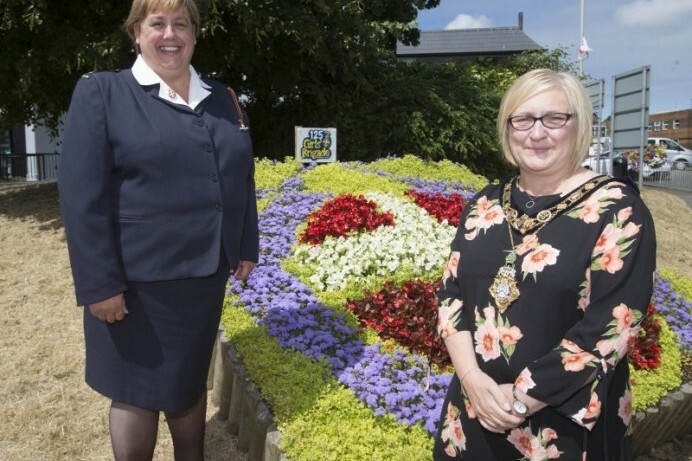 The Girls Brigade has marked its 125th anniversary with a new flowerbed in Ballymoney. 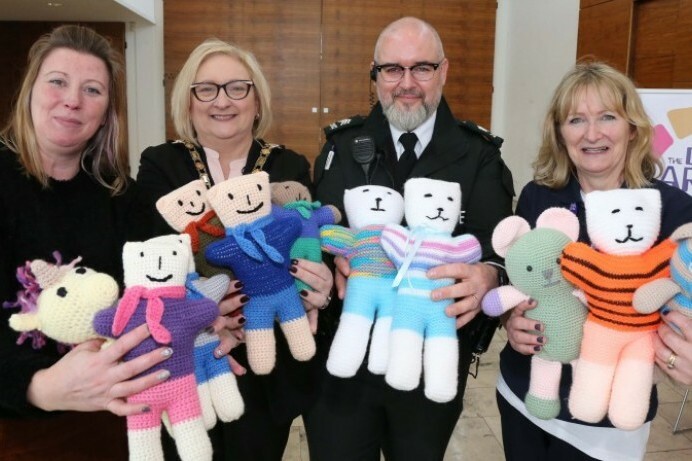 The award winning Big Telly Theatre will bring its Teddy Bears Hospital to Roe Valley Arts and Cultural Centre on Saturday 4th August from 12pm-4pm. 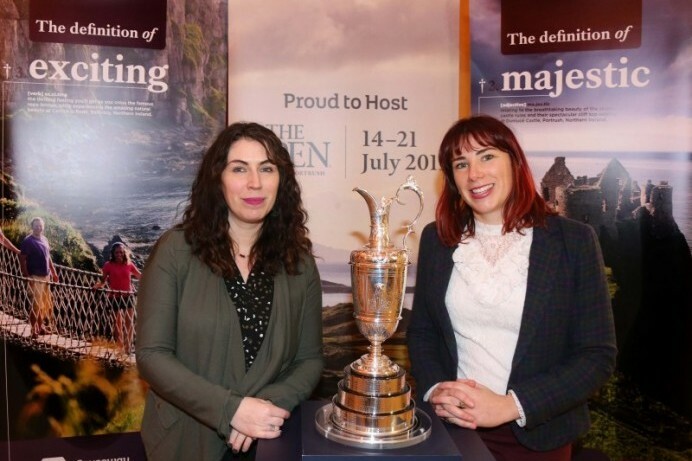 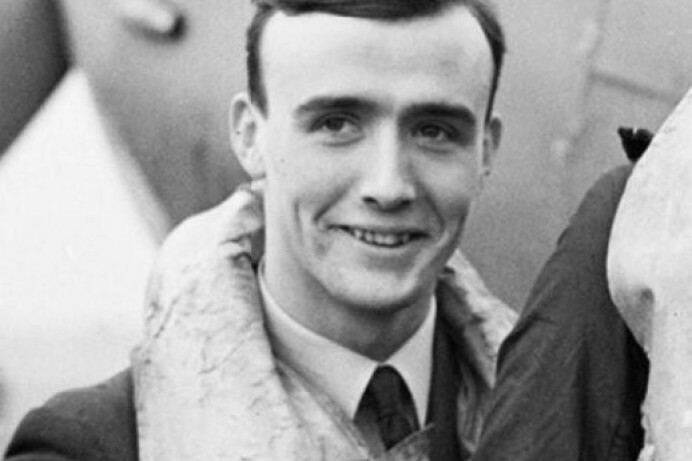 An aeronautical engineer aiming to become the first Irish person to travel to space is set to make a guest appearance at The STEM Village at Air Waves Portrush. 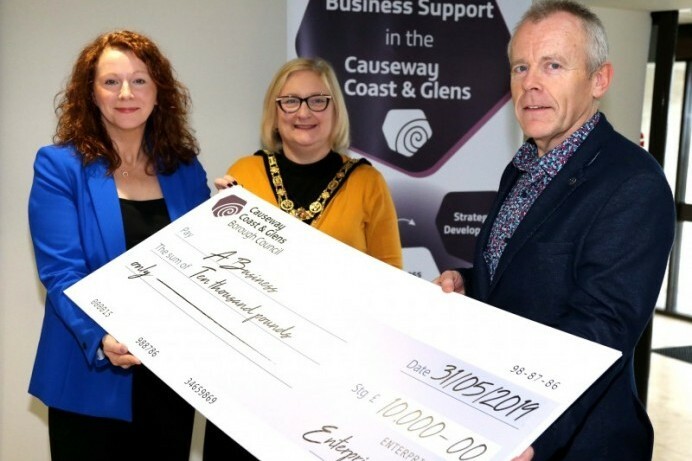 Causeway Coast and Glens Borough Council has awarded grants to seven businesses through its Enterprise Fund. 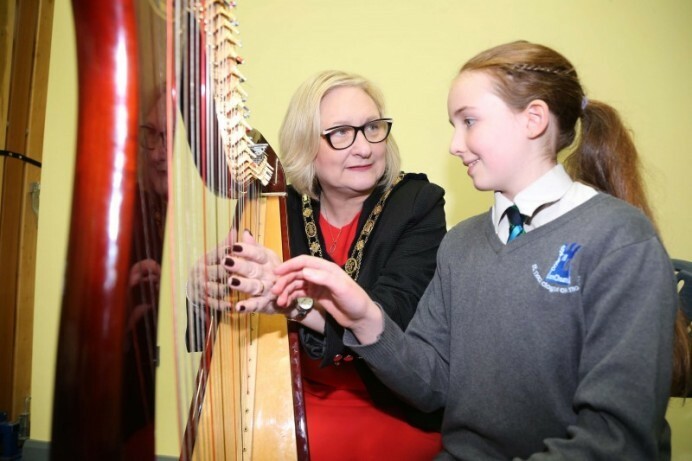 DH Christie Primary School in Coleraine is the latest ‘PlasticSmart’ school in the Borough. 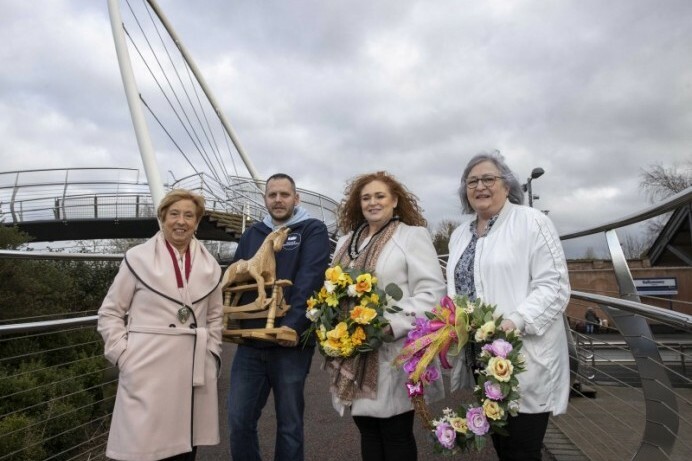 Arguably one of Ireland’s greatest female jazz and blues singers, Mary Coughlan will perform at Flowerfield Arts Centre on Friday 27th July. 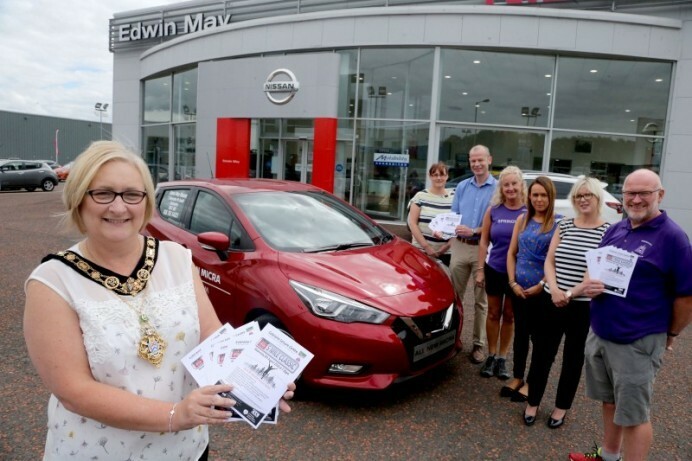 The annual ‘Edwin May Nissan Five Mile Classic’ road race is now open for registration. 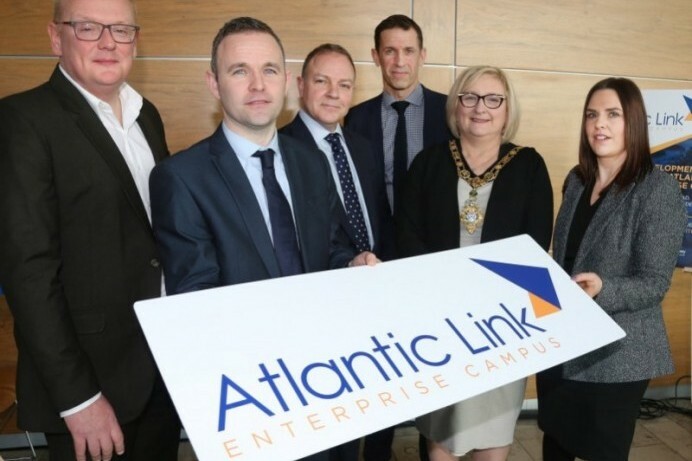 London delegation visits Atlantic Link Enterprise Campus in Coleraine. 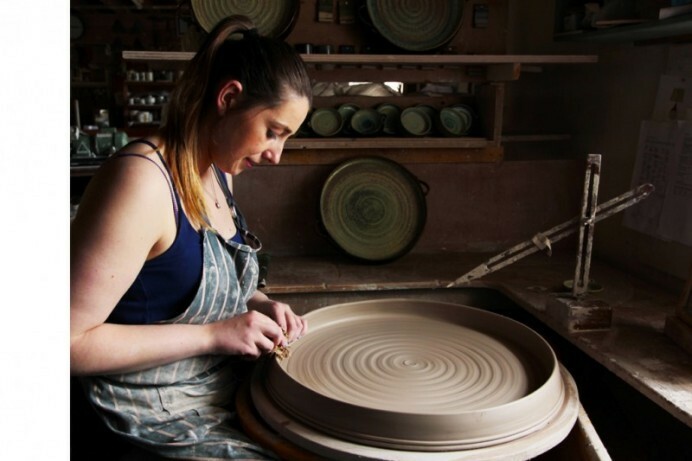 Adults can get creative this summer with a range of fantastic new courses at Roe Valley Arts and Cultural Centre. 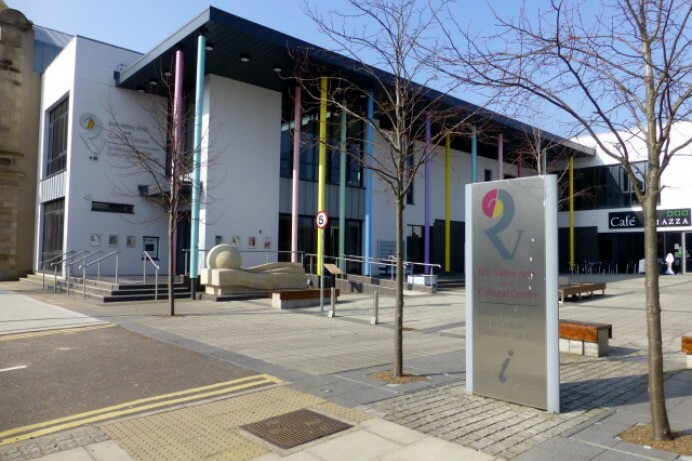 Bin and food waste caddy collections (if applicable) scheduled for Thursday 12th July 2018 will take place on Saturday 14th July. 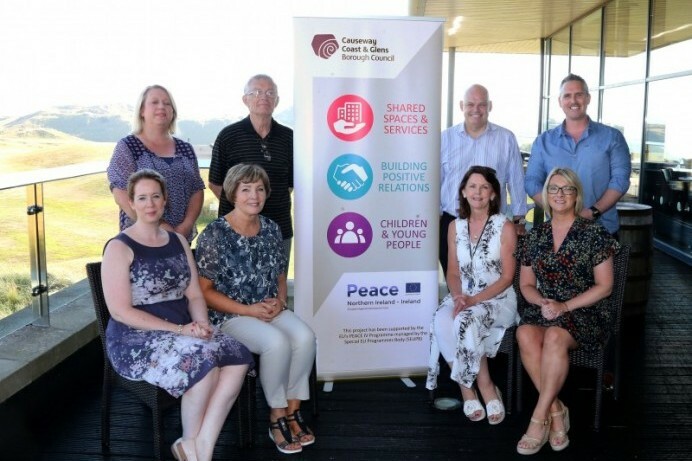 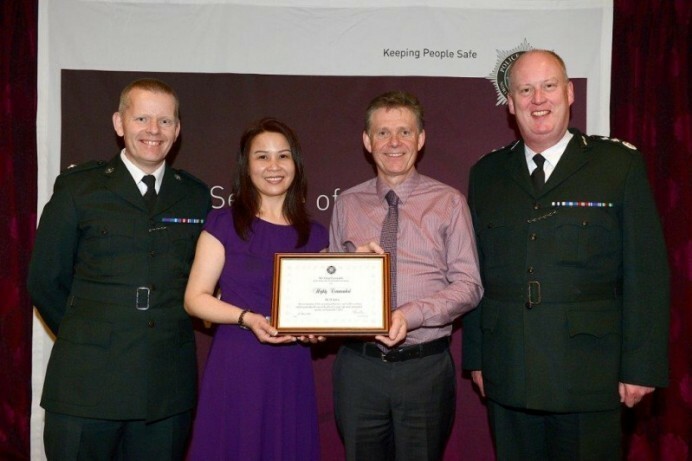 Evening of Reflection held for participants of ‘Sharing Your Community Space Programme’. 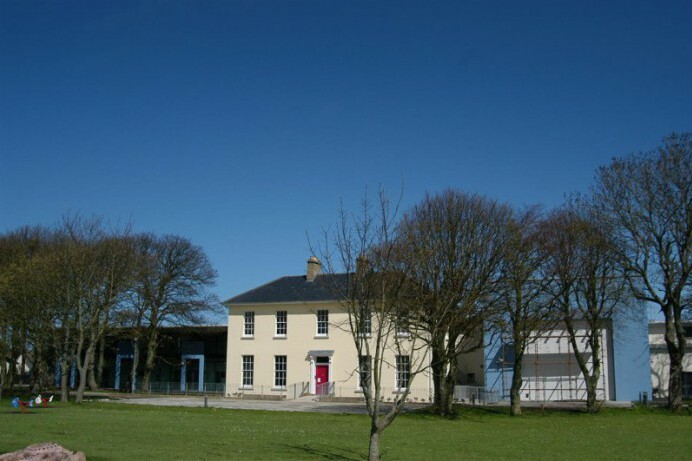 August Children’s Month returns to Roe Valley Arts and Cultural Centre with a host of fantastic family friendly activities. 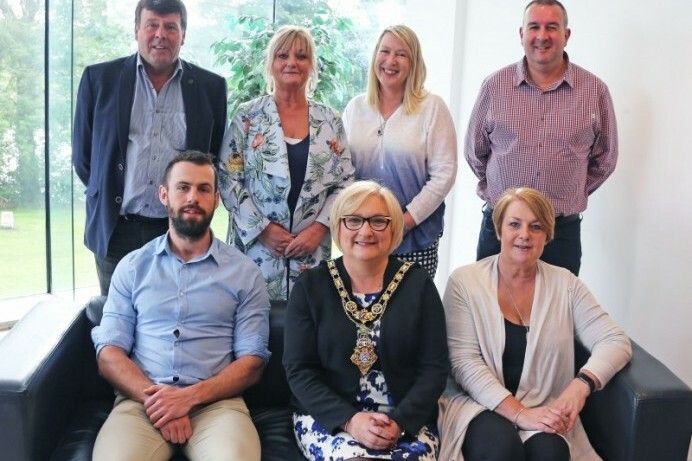 The Mayor of Causeway Coast and Glens Borough Council will be opening Books of Condolence in memory of Ballymoney rider William Dunlop. 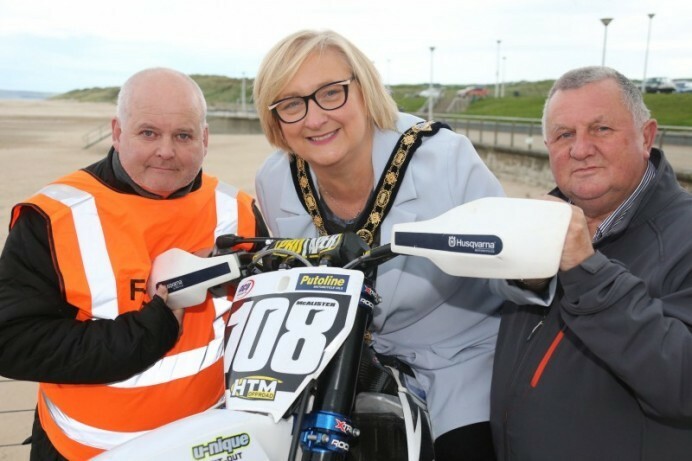 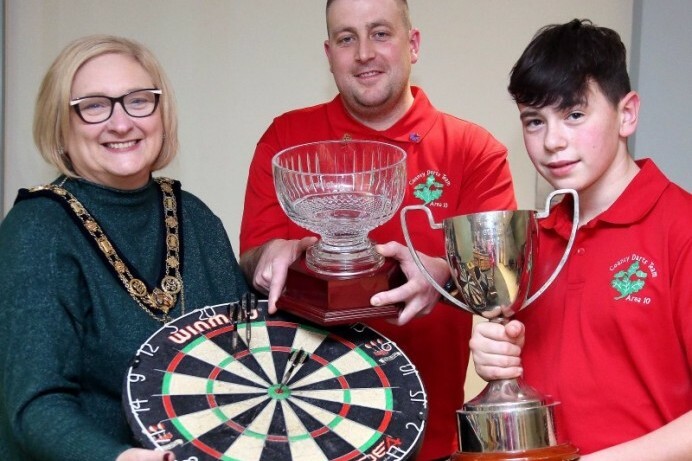 The Mayor of Causeway Coast and Glens Borough Council has paid tribute following the tragic death of William Dunlop. 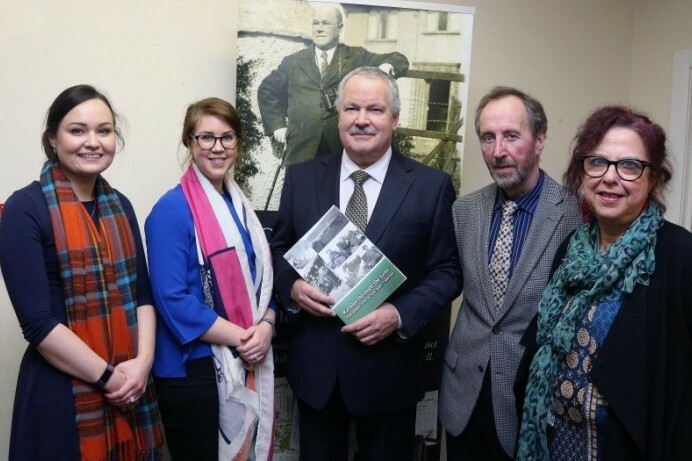 A new exhibition which explores the first organised migration from Ulster to North America has opened at Roe Valley Arts and Cultural Centre in Limavady. 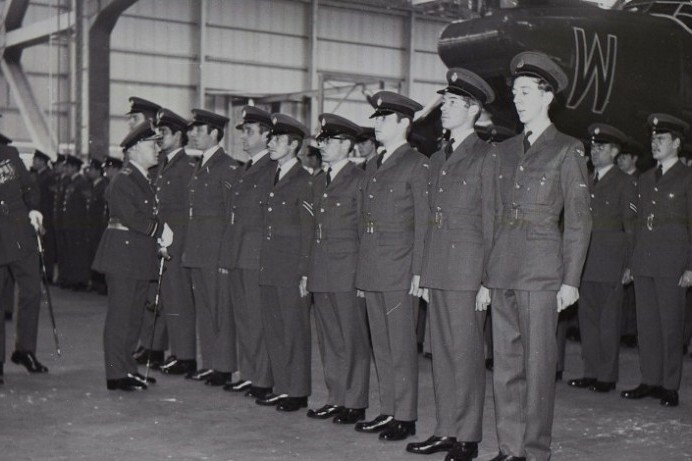 A new exhibition which commemorates the centenary of the Royal Air Force has opened this month at Green Lane Museum at Roe Valley Country Park in Limavady. 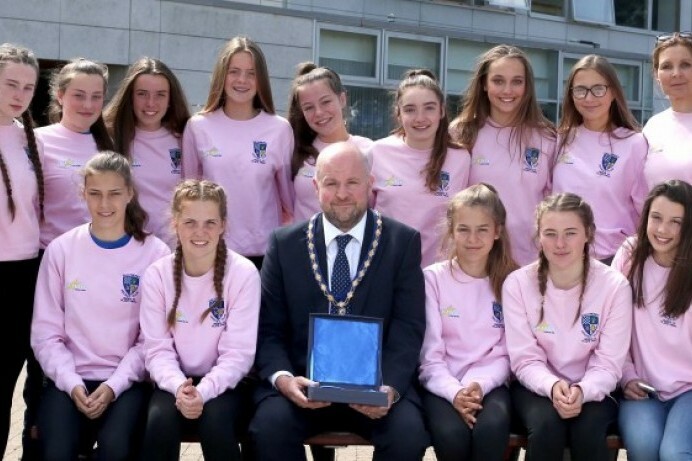 The achievements of Ballymoney Hockey Club’s Under 15 players have been marked with a civic reception. 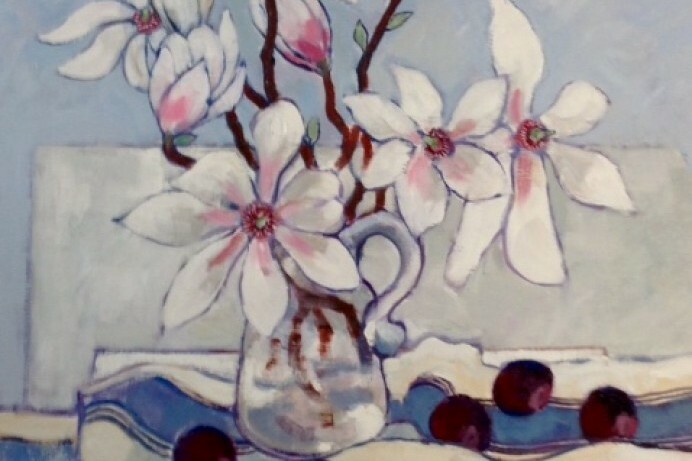 The remarkable painter and printmaker Richard J Croft is bringing his latest exhibition to Flowerfield Arts Centre during July. 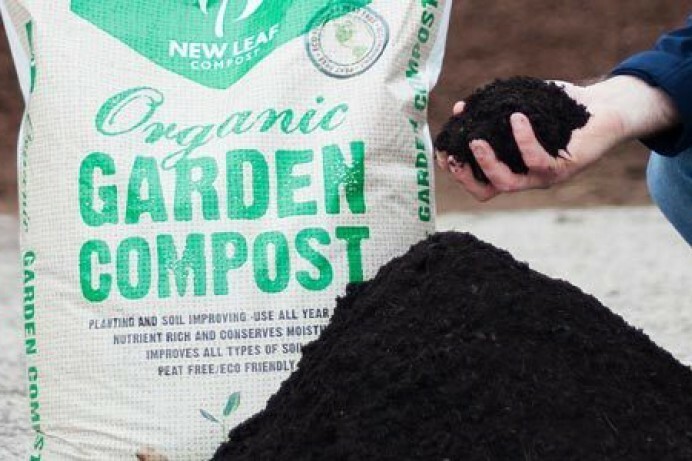 Would you like to receive free compost in exchange for recycling? 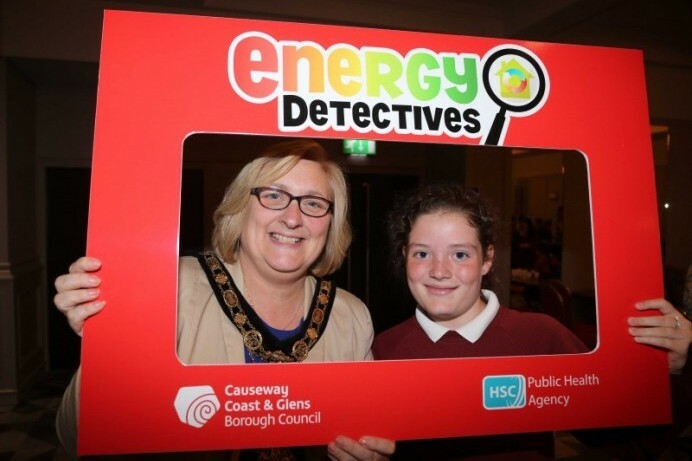 Causeway Coast and Glens Borough Council’s annual educational event ‘Streetwise’ has been enjoyed by school children from across the area. 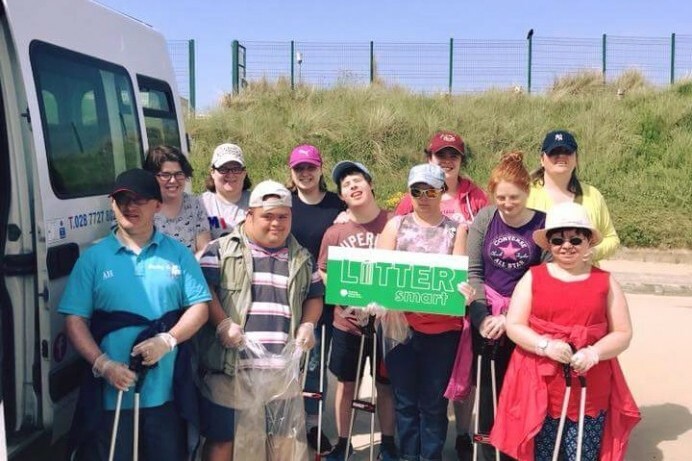 A litter pick has taken place at Benone Beach on World Oceans Day as part of Causeway Coast and Glens Council’s LitterSmart campaign. 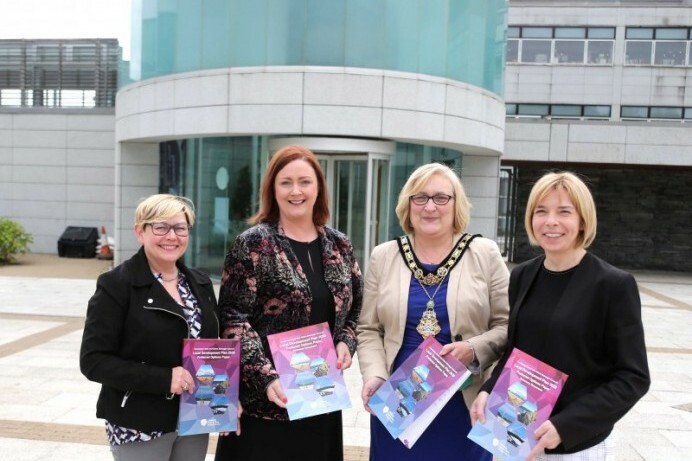 Causeway Coast and Glens Borough Council launched its Local Development Plan 2030: Preferred Options Paper (POP) for a 12 week public consultation period. 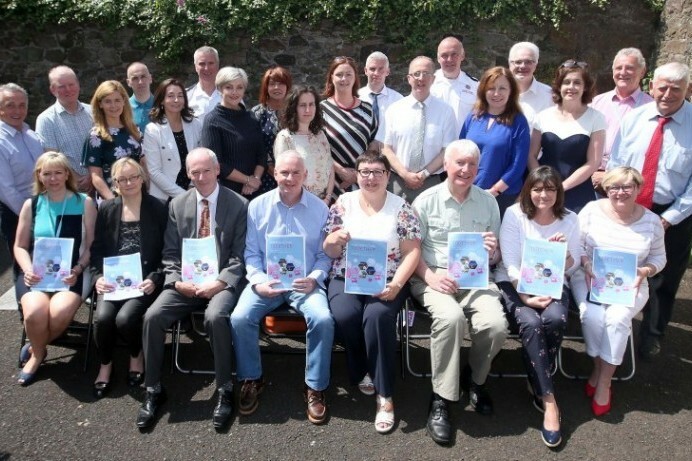 Consultation on Council’s draft Audit and Good Relations Strategy 2018 – 2023 is open until Friday 24th August 2018. 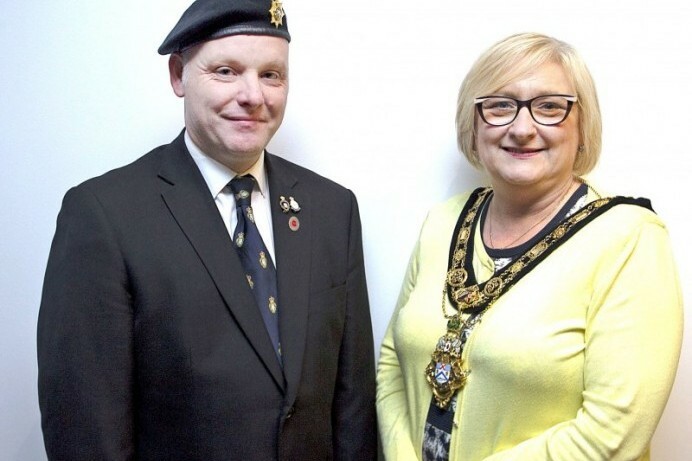 Coleraine has welcomed thousands of visitors to the town’s first regional Armed Forces Day celebration. 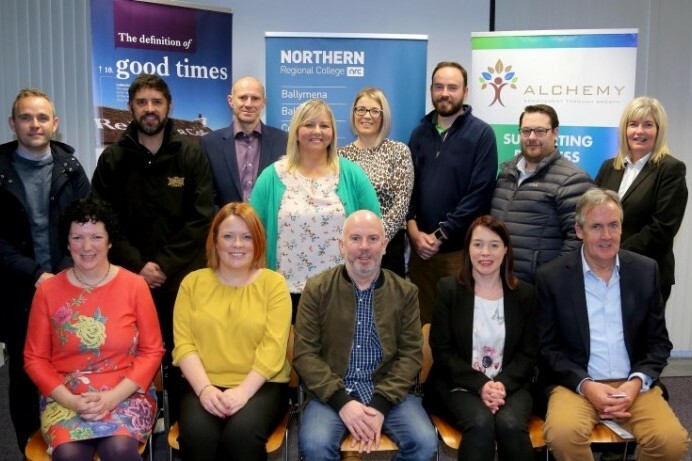 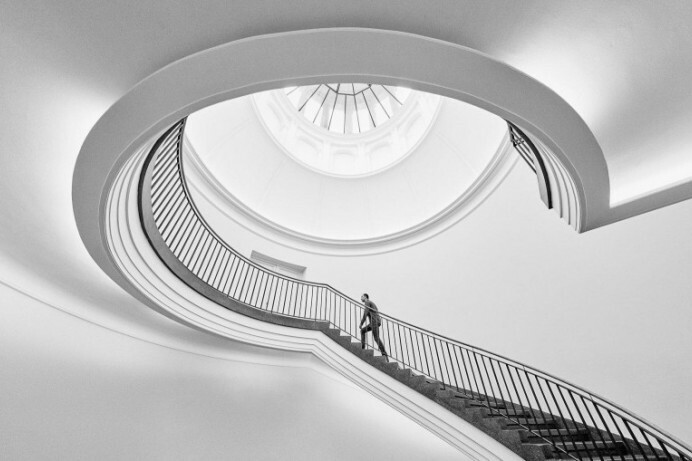 Things Connected Northern Ireland, a local public-sector consortium, has partnered with the technical innovation accelerator Digital Catapult, to bring an Internet of Things (IoT) network to Northern Ireland. 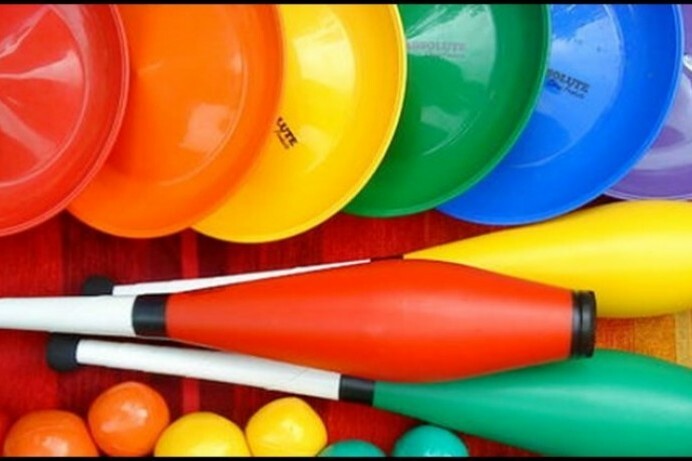 Are you aged between 14 - 16 and interested in learning circus skills during your summer holidays? 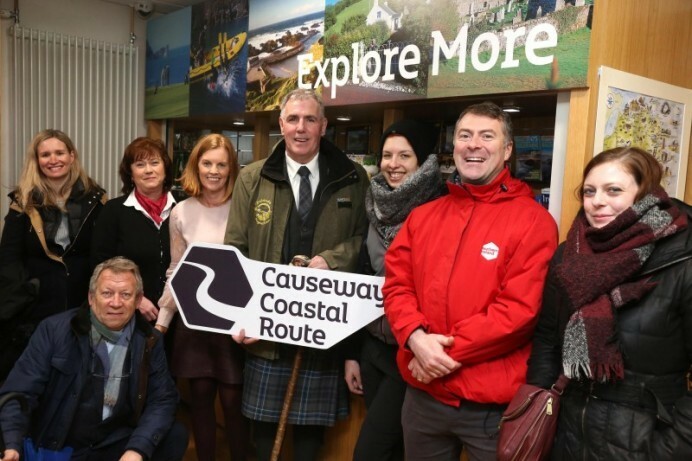 Visitor Information Centres across the Causeway Coast and Glens are celebrating fantastic mystery shopper results. 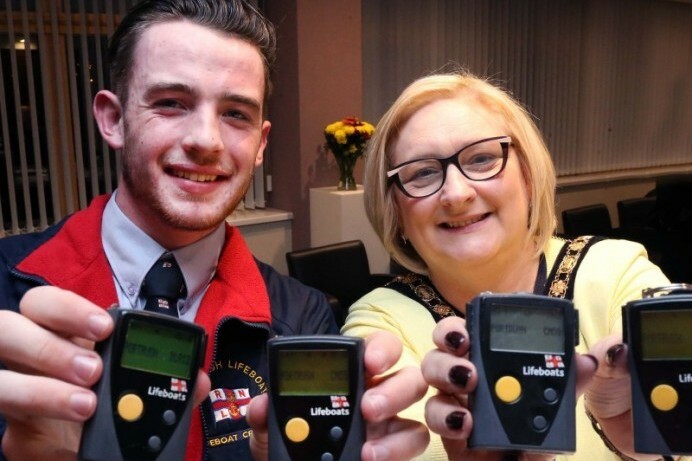 People who steal or misuse life-saving equipment have been urged to think twice about their actions. 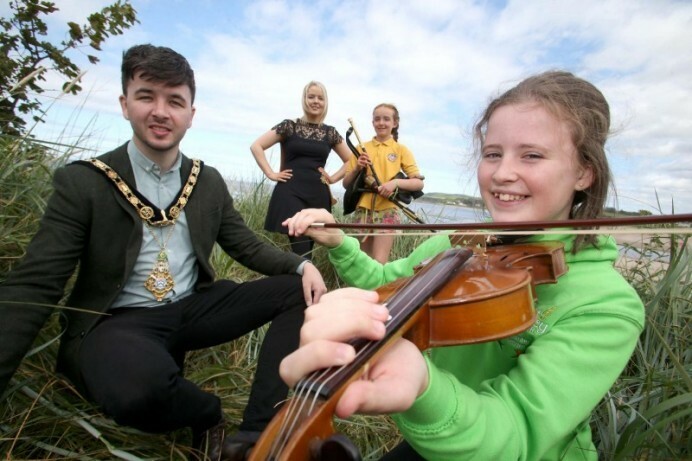 Thousands of people are expected to descend on Coleraine as Armed Forces Day meets Rhythm of the Bann on Saturday 23rd June. 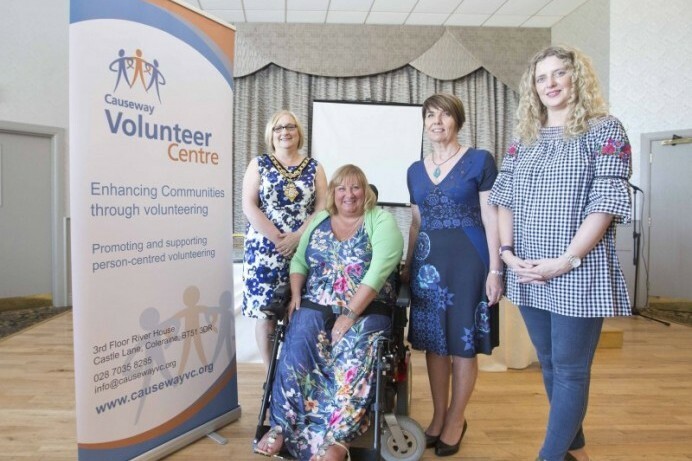 Volunteers in the Causeway Coast and Glens, particularly those living with a disability, have been celebrated during Volunteers Week. 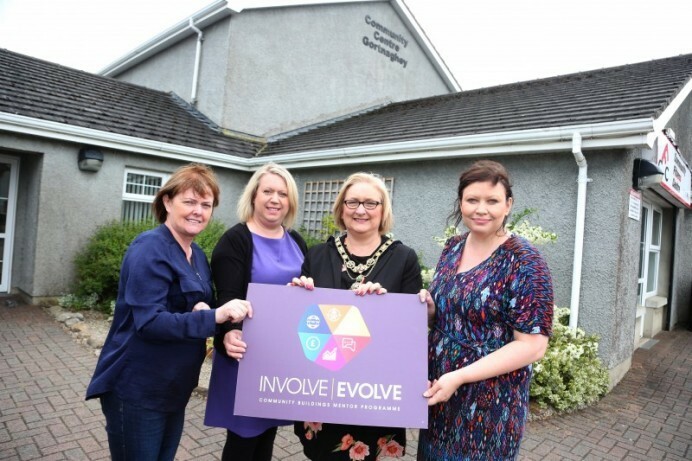 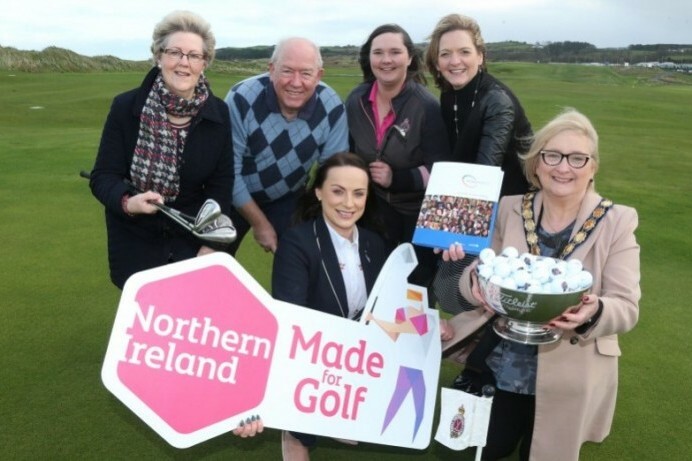 Causeway Coast and Glens Borough Council has launched a new mentor programme aimed at the community sector.